I wrote this a few days ago while I was cruising on a passenger train through Germany... It’s been a matter of minutes since we left the highlands and damn if I don’t already miss the Alps. I’m heading back to Utah from Munich tomorrow. As much I have grown to love the Wasatch and Rockies, something about these mountains is magical. I haven’t been anywhere else where the glacial valleys, quaint towns, jagged peaks, stark slide paths and endless views can compare. 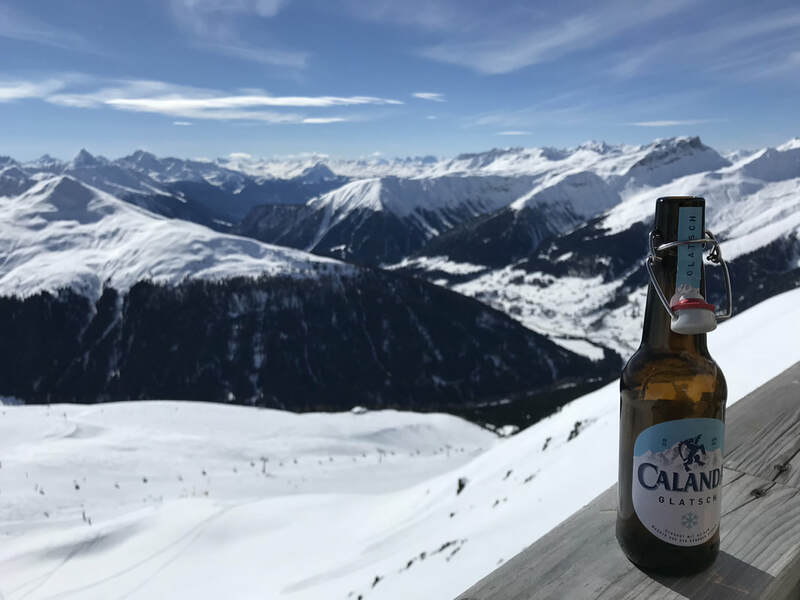 I spent the week in Switzerland, first in Davos, then in St. Moritz for the weekend. Last Tuesday, I came over from Planica, Slovenia by train: past Bad Gastein, Kietzbühel, Innsbruck, St. Anton, and many more iconic Alpen towns. In Davos, I stayed with Jon Shafer (aka Fast Big Dog aka FBD) and a very welcoming local, Maurus Kehl. Maurus took us into his home, a new flat in Davos Platz, without having met me, but Jon has got to know him well over years of business and ski trips to Davos. 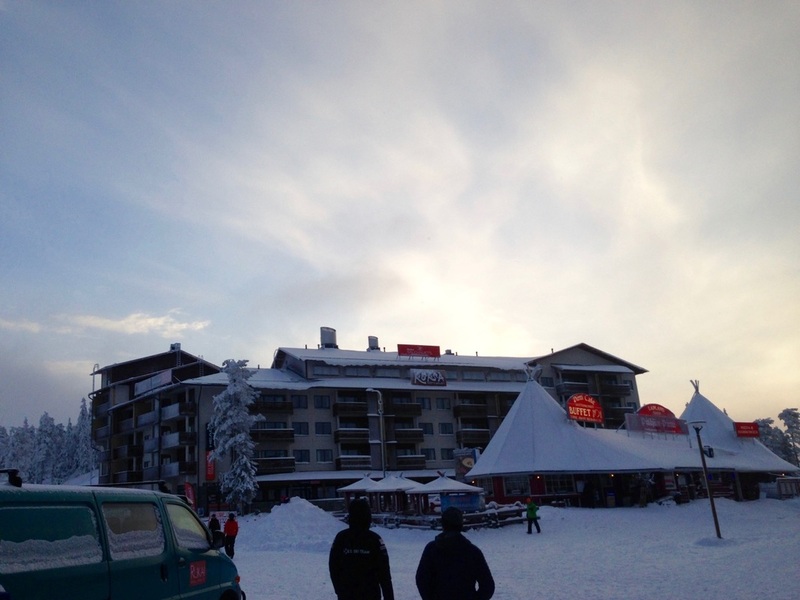 We hardly saw Maurus, who runs a restaurant at the top of one of the area ski resorts. Like most other restaurateurs, he works tirelessly. Some nights, he sleeps up in the rooms above the restaurant. On Thursday, we took the two-part tram up the resort for a lunch up at his restaurant, the Sun Peak. 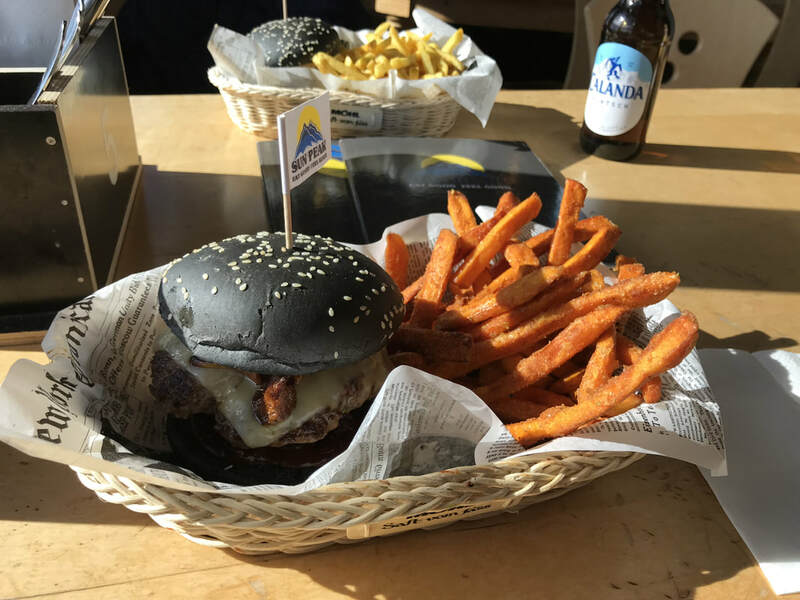 I had a “Colorado” buffalo burger with mushrooms that he picked in the fall down the valley. Maurus also happens to be a huge hockey fan. 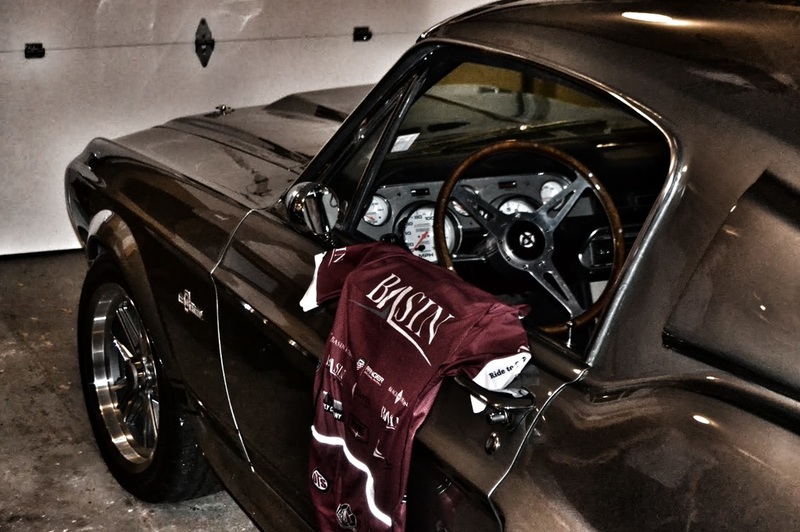 He’s lived in Canada and cheers for the Avalanche, in addition to the Davos Club. The Sun Peak’s menu reflects his North American travels, but with a distinct flair of local harvests and traditions. Combined with the stunning panoramic views, this was an unforgettable lunch. No need for white linen, expensive wine and black-tie servers for a “fine dining" experience. An aerial view of the Davos town and nordic center. Cruising high up the valley. Panoramic views from the Sun Peak. 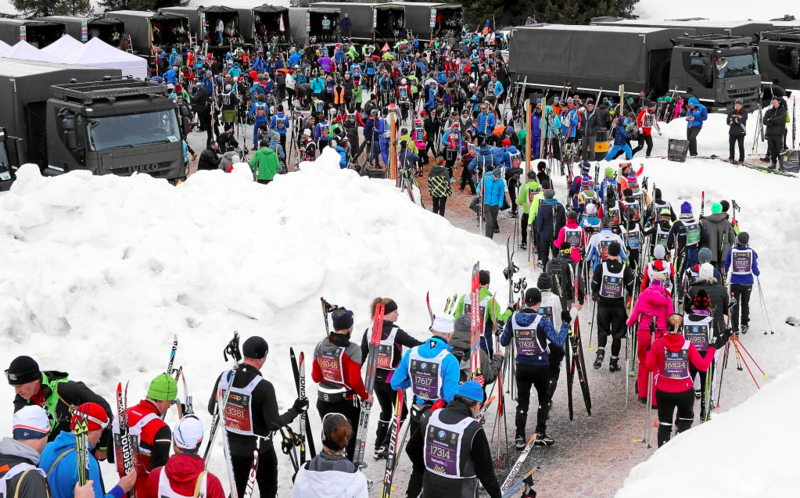 ​After a few days of world-class cross-country skiing in Davos, Jon and I were ready for the main event of the week: the Engadin Ski Marathon. We took the train over Saturday morning, with time for a short mid-day ski and logistical preparation for the big race on Sunday. Our World Cup Atomic representative put me in touch with the Swiss Atomic crew, who hooked me up with some killer race skis. I was surprised to see my new contact here, Kevin, was actually a year younger than me, but he certainly knew what he was doing. 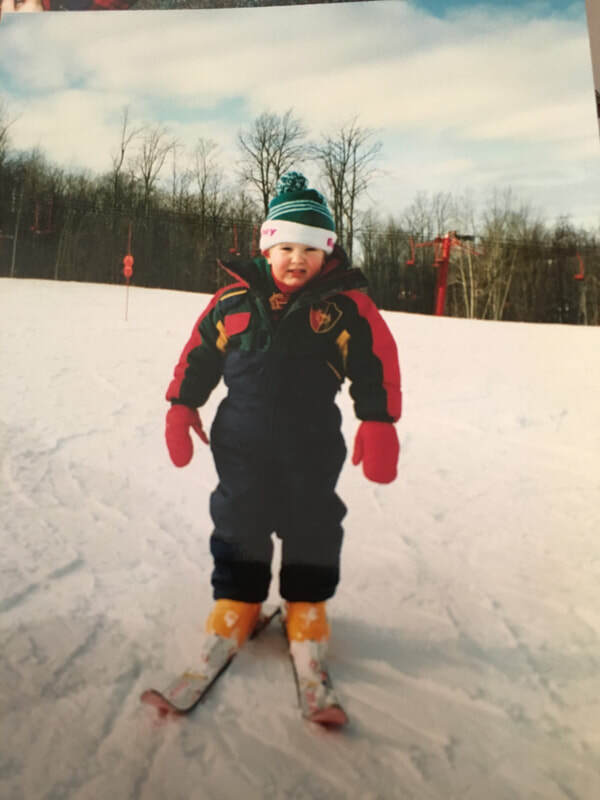 He was right about my weight, and already had tested skis to select the best pair for me, and then finished the prep with many coats of high flour wax, powders, and an all-important top structure for the base. Without this help, I wouldn’t have stood a chance of competing in this field. Four-time Olympic champion Dario Cologna often enters, and usually wins this race, but he was busy winning the Holmenkollen 50km in Oslo on Saturday. His absence may have disappointed the Swiss, but it didn’t do too much to diminish the level of the field. 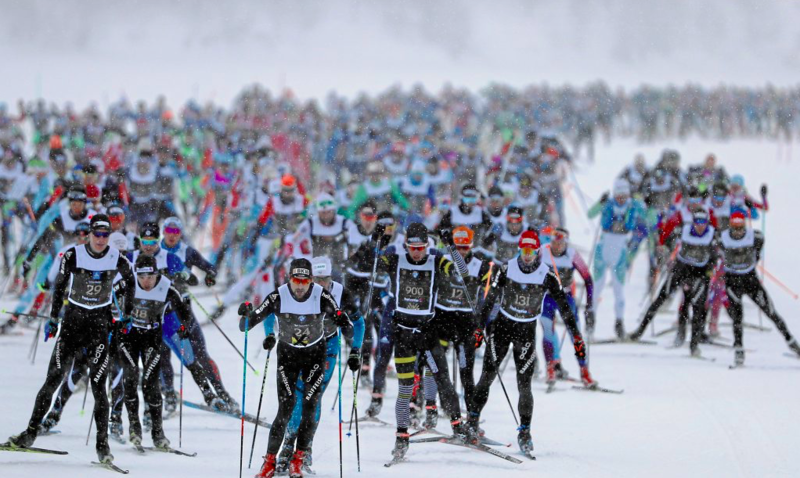 The World Loppet is filled with competitive World Cup athletes and professional teams that operate like pro-cycling teams. Sprint World Champion Federico Pellegrino (ITA) was rumored to be showing up. 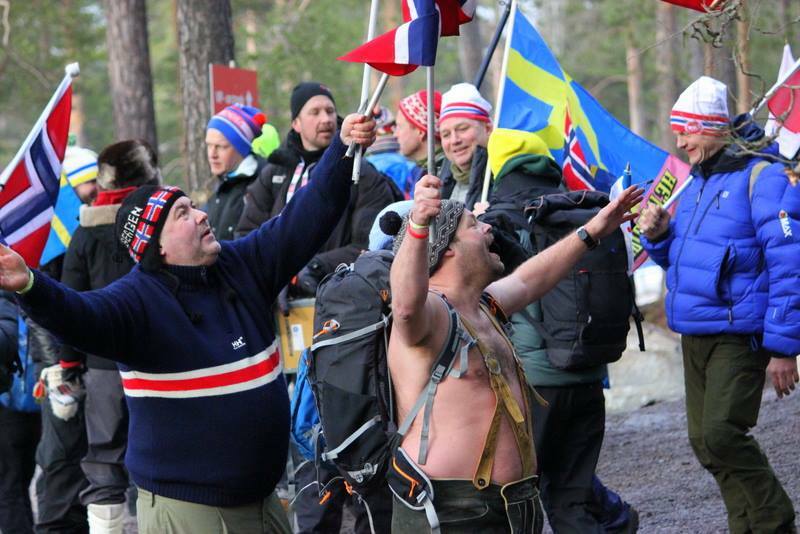 The organizers apparently had bib 1 reserved for him, but on Sunday morning a new big name had the first bib – Peter Northug. Northug is no longer the "king of skiing;" the 18 time World Championship gold medalist hasn’t been a force on the World Cup in two years, but he’s still a wild card with an amazing finish. And I was pretty psyched to toe the start line against a guy like Northug. 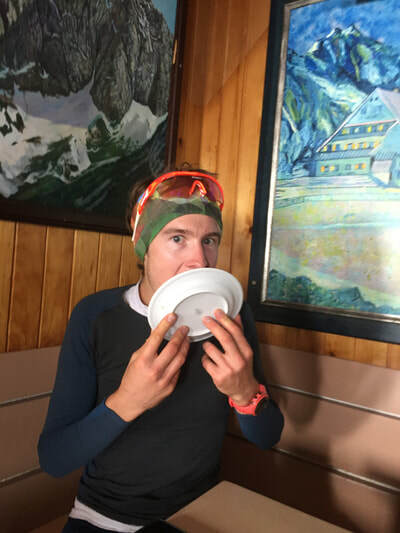 Race morning begins with a 5:45 wake-up for an early breakfast: a bowl of Bircher muesli (Swiss overnight oats) and a soft-boiled egg. Shortly thereafter, we load onto a fully packed bus heading directly towards the start. 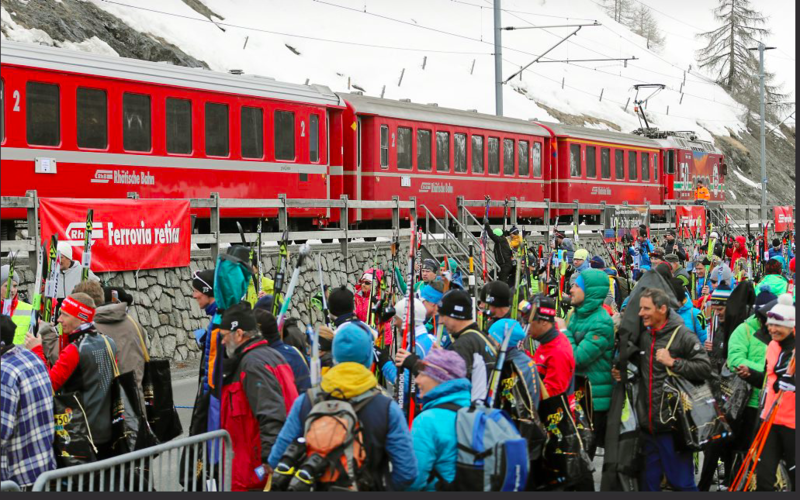 With 15,000 racers and limited parking at the start-line, this was a good time to be in the hands of Swiss public transportation. They must have some sort of call to arms to bring in enough buses to the region for this weekend. Prepping for the start-line stand. ​In the Elite wave there’s “only” 150 men and around 50 women starting together. 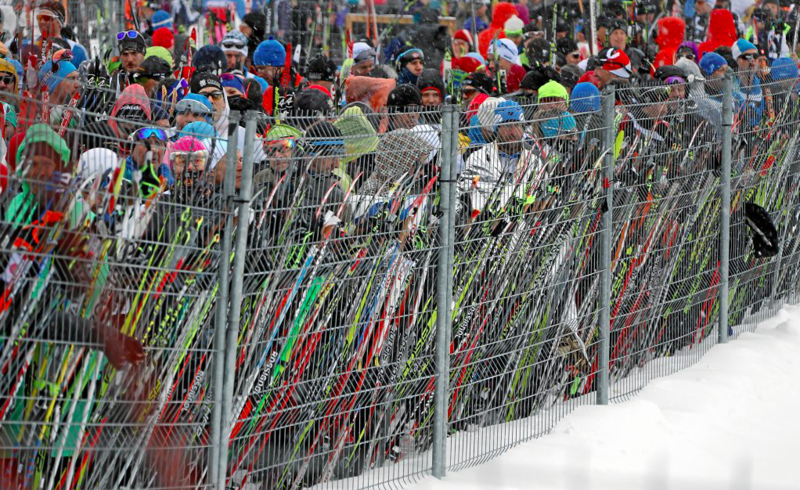 We had the luxury of being able to place our skis in line in the pen, first come first serve. Our wave would go out first. In the groups behind us a race before the race ensued. Clad in throwaway ponchos, old clothes or shivering in nothing but spandex, hundreds of jittery racers were already fighting for their start line spot when we arrived one hour before the start. 15 minutes before the start, I shed my wet warmup clothes and handed my race bag to the Swiss Army workers loading up trucks to be sent to the finish line. I pulled on my homemade raincoat – two heavy duty trash bags cut like a poncho with a skirt. It was still raining, and I kept this on until minutes before the race. In the start pen, I had just a few minutes to stay warm and loose before the gun would be off, which is exactly how I like it. I didn’t envy the thousands behind us in their respective waves, many having stood for over an hour in the sleet and wind for a better starting position. Three minutes to go, I clicked on my skis for the first time that morning. This was a twist on my normal routine, but I’m comfortable running for a warmup, and equally confident that I didn’t need much of a warmup before 42km of racing. I was near the front, but they added an additional front line, the big names and Loppet leaders. Andy Newell, one of America's best sprinters for the past decade-plus, stood on this line, distinct in his US Olympic race suit. This would be his first Engadin as well, and I was curious to see if I could ski with him at all. I looked around for other racers I knew: a few by name, my Atomic buddy, two kids from Kranjska Gora, Slovenia who I met the day before but had certainly seen out on the trails and in the ski tunnel in the Planica area. I didn’t look at my heart rate before the start, but I’m sure it was higher than at any other start this year with the exception of Olympic Trials. It’s a different feeling starting a race on a new course, point-to-point, of a new distance, against new racers, my first true ski marathon, compared to knowing every meter of course on a 2.5km NC loop. Racers in the pens. Swiss Image photo credit. ​With a gun shot, the frenzy was on. Like most mass start races, there was a mandatory double pole zone from the start, but it was unclear where it ended, and some risk-takers began skating as soon as possible. The over-zealous quickly caught poles and tips and found their way to the ground, as the rest of us pushed forward, vying for positions and flying onward at high speed. It reminded me of the thrill of criterion bike racing: tightly packed, too many wide to count, constant chaos and hyper-attention – only with poles and less likelihood of bodily harm upon crashing. Early on, I spotted the women’s World Loppet leader in a yellow bib. That’s probably a good one to follow, she knows where to be and how to stay out of trouble. I skied right on her for couple minutes before a skier besides her went down, and tangled her up in the aftermath. I didn’t have a lot of room to roam, but stepped around her flailing in a pure-flow focus. So much for that wheel to ride. The field gradually stretched out as the course narrowed and pushed past the first lake. My skis were running great. At one point I took a great line and found myself near the very front of the race. After just a moment of relaxing in this position I was quickly back another 20 or so spots. If you’re not passing people, you’re getting passed, moving backwards, another lesson from bike racing… and driving in traffic on the Autobahn. The next 5 km would be the most defining of the race. We flew through the outskirts of St. Moritz and into the trees. The fresh, wet snow was slower, and the field seemed to be shattering into groups. I wanted to hang with the leaders, but there was still a lot of racing ahead. Near my limits, I figured I was in an okay group. A double Swiss Victory. Talk about a cool trophy. This was my last race of the 2018 winter. 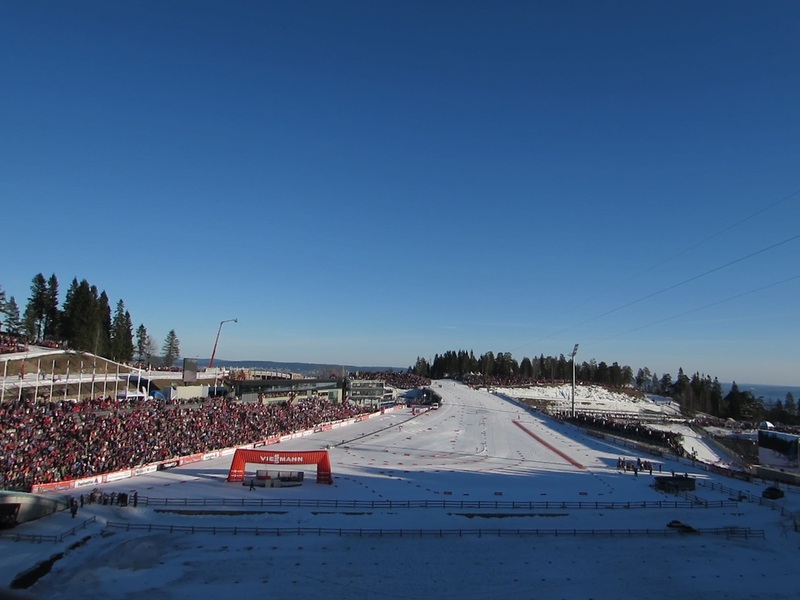 It’s strange not to end with a Nordic Combined race. At this point, on normal years, I would be celebrating the end of a season and the beginning of a better one with my teammates and best friends from around the world. I certainly wasn’t alone, with Jon Shafer soon to finish, a few other friends from the US and new friends to be made in the finish line festivities. It was strange not to have my normal crew around me, but we managed to keep the stoke on high, sharing stories from our race and our lives beyond skis. I owe a huge thank you to Jon Shafer for letting me join and taking such good care of me this trip. Additionally, I'm grateful for Atomic for providing speedy skis and service, all the volunteers who made the event happen, and the many racers I connected with over the weekend. I'm always amazed with how many old friends I run into on the other side of the world, and the new ones I make. It's a small world, after all. To end this, if you're still crazy for more, here's a professionally made highlight video. 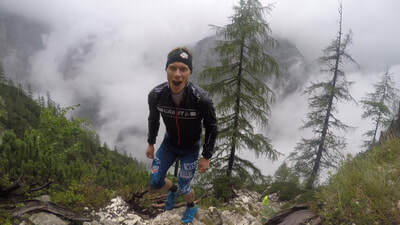 If you want to do some recon for your future Engadin race, the entire stream of the event is also on YouTube. Thanks for reading, and, as we like to say, I'll see you out there. ​I’ve had a busy few weeks, filled with travel, competitions, some hard moments and time for reflections. I thought I would try to fill you in a bit here. Three weeks ago, the COC group and I flew down to Munich after competing in Rena, Norway. 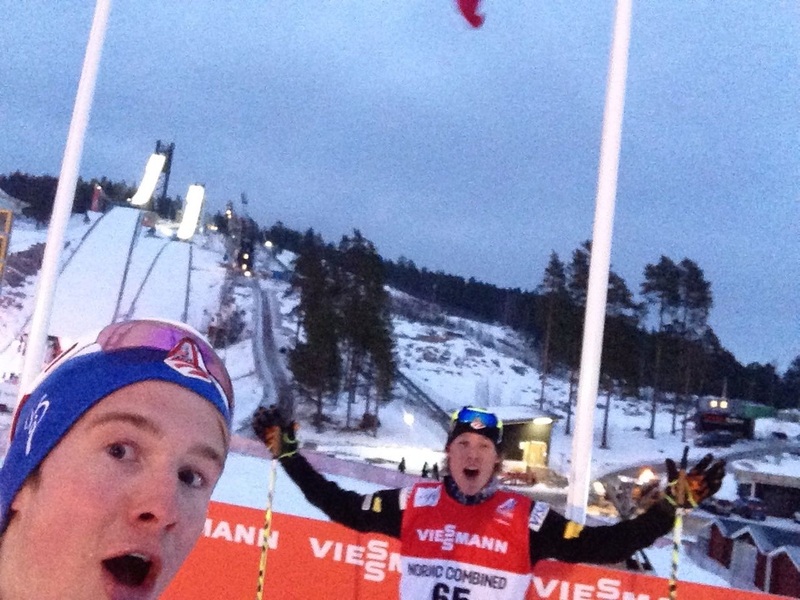 This was January 22nd, the day that the Olympic qualification period was officially over. I don’t want to make this post all about that, but not making the team definitely shaped my plans and thoughts over these past few weeks. That evening, Grant Andrews and I rented a car and drove into the night and rain to Ramsau, Austria, a little over two hours away from Munich. Grant and I spent the week training by ourselves. The rest of the team was split between a pre-camp for World Juniors in Oberstdorf, Germany and preparing for the Olympics/ competing in Seefeld, Austria. It was probably best that we get away for that week – we wouldn’t have fit in with the stress and excitement of the guys heading off to the Championships. 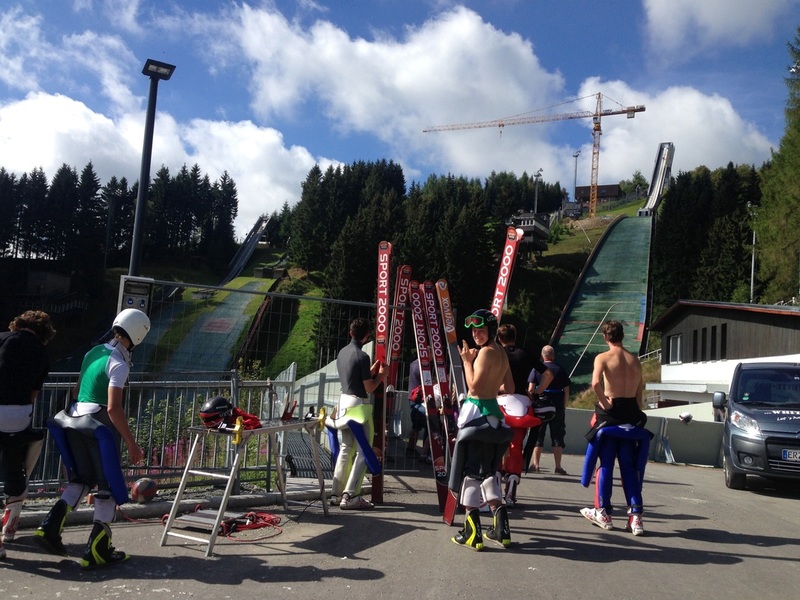 We arranged a couple sessions of jumping with the Polish team training in Ramsau. It’s a bit awkward – and this wasn’t my first time – walking up to a random coach and saying, “hey, want to be my coach for a while?”, but it also always seems to work out. In this community, “we’re one big family,” as the Poles so kindly demonstrated. 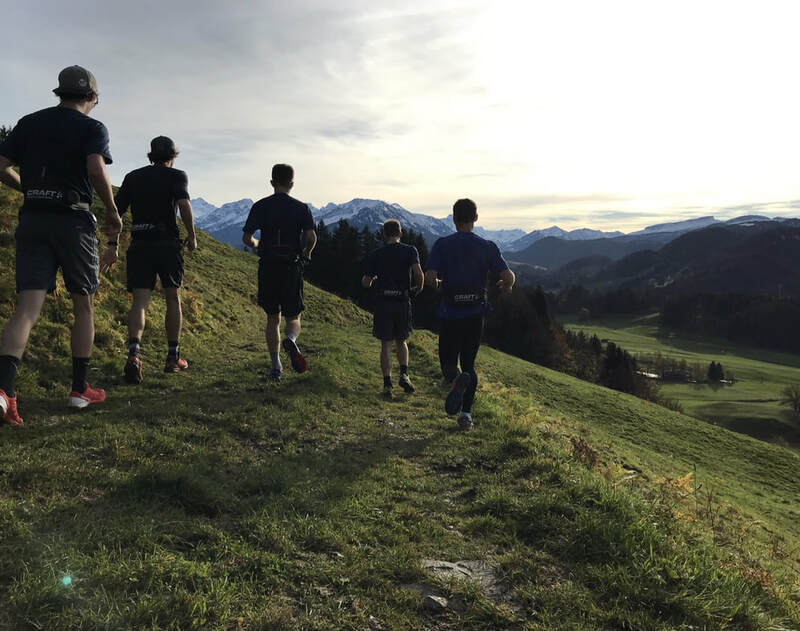 The cross-country trails are phenomenal in Ramsau, and we took full advantage of the chance for some nice easy cruising. I skied over 100km in a few days and hardly repeated the same loop. My prescription for fresh air and exercise in the mountains was well received. These days reminded me how much I love this sport, and how lucky I am to still be doing what I’m doing. 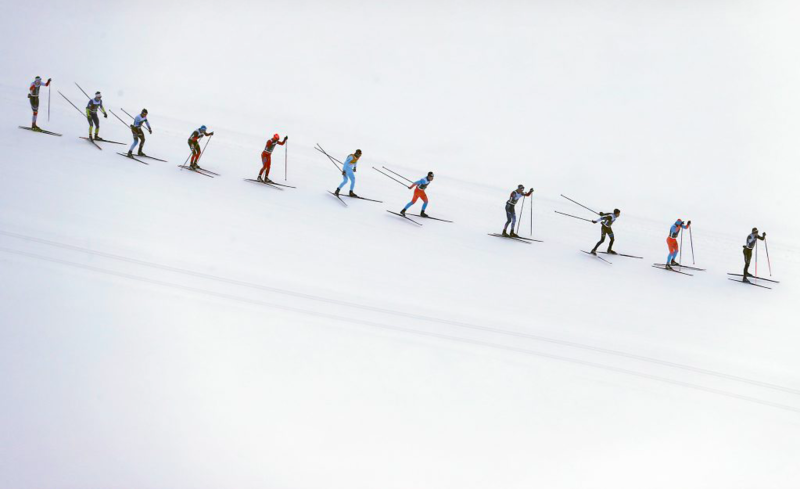 Ramsau is a ski-town where more tourists come to cross country ski than downhill. This might seem like a lot of work compared to the average person’s idea of a vacation, but these aerobic vacationers are far more relaxed than your typical Disney World/ Mall of America/ Times Square tourist. Speaking of being a tourist, I actually spent a whole day off-skis in Salzburg with my parents before they went to Switzerland to watch my brother at World Junior Championships. They flew into Zurich on Friday, then fought off jet-lag and drove nearly all of the way to Salzburg so that we could have the following day in Salzburg. Clearly, their support for me is unwavering and limitless. Without it, I can’t imagine I’d be writing about these experiences now. 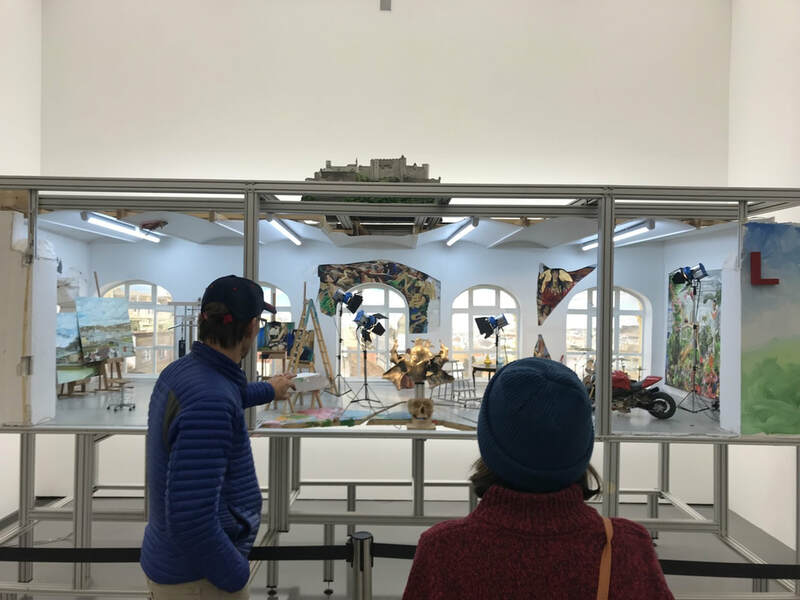 Getting cultured in Salzburg with my parents. 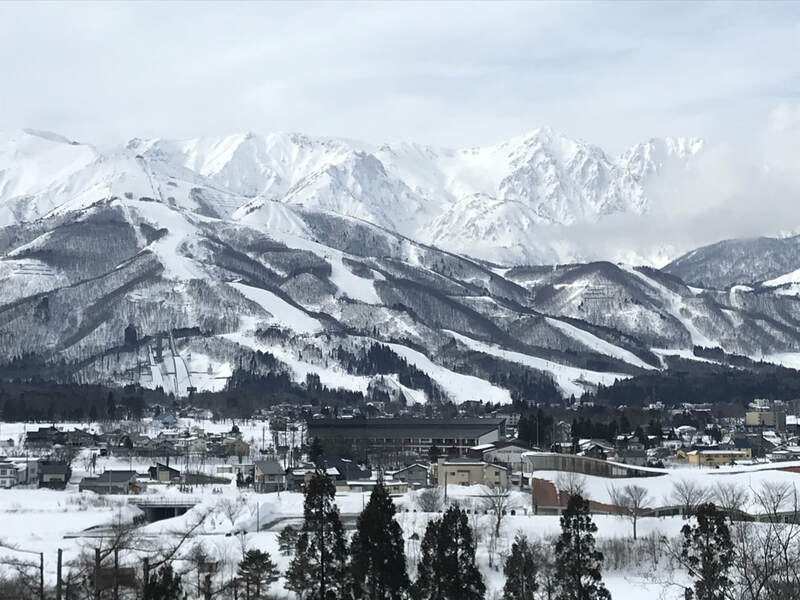 After Ramsau, the excitement level kicked up a notch with a trip to the World Cup in Hakuba, Japan. I flew over with Ben Berend, who got our fifth Olympic team spot upon its late announcement and would be heading to Korea from Japan. 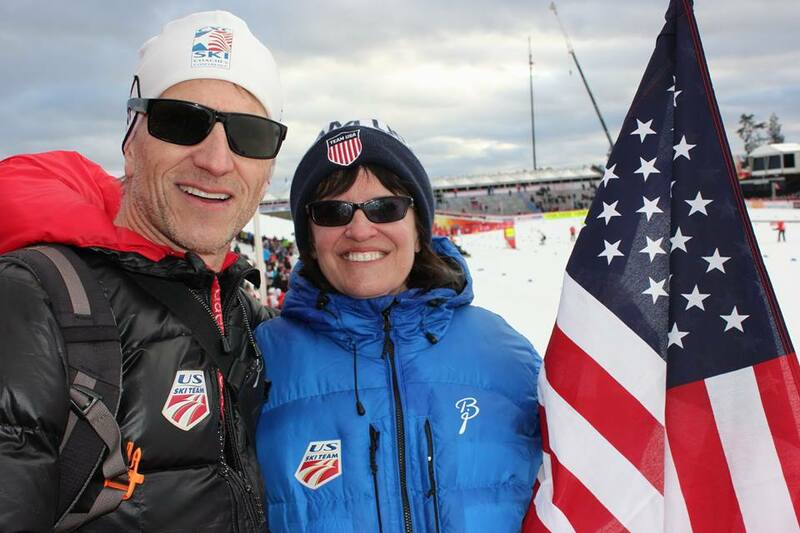 Clint Jones came from the US to coach us on his way to Pyeongchang. Clint works with both our team and the ski jumpers, usually just when we’re in the US, and it was awesome to have him on the road with us. We partnered up with the Czech team for skis and waxing, continuing an alliance which is proving to be all around great. 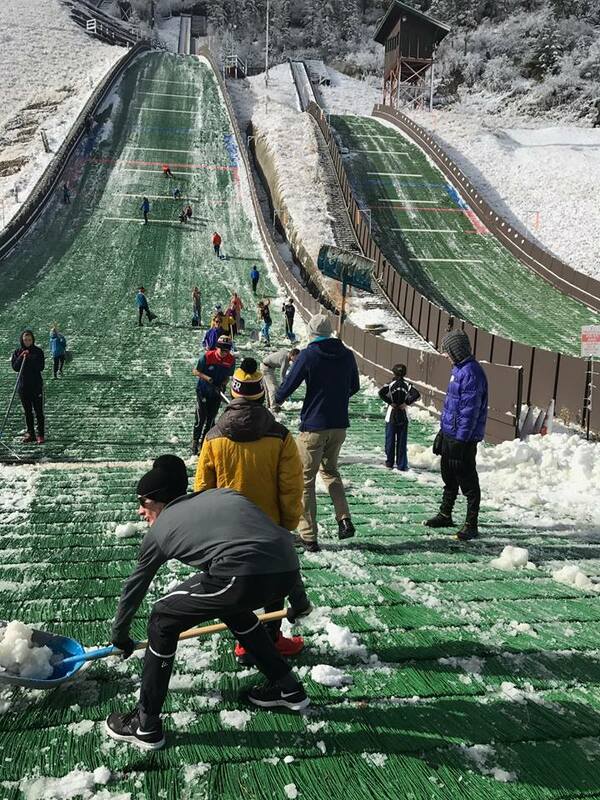 While we were in Japan, our World Cup technicians waxed for the Czech COC team in Planica, Slovenia, and the rest of the US/Czech crew worked together at World Juniors in Switzerland. 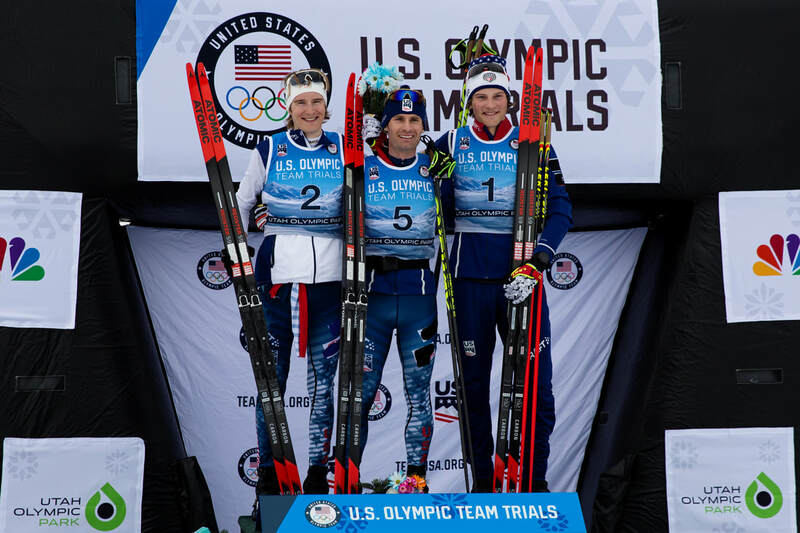 We were super psyched to watch Ben bring in a bronze medal on the opening day, and the Czech took the win, making for a real cause for celebration from our staff there! This was my third trip to Japan. I’ve felt extremely lucky to be there each time. 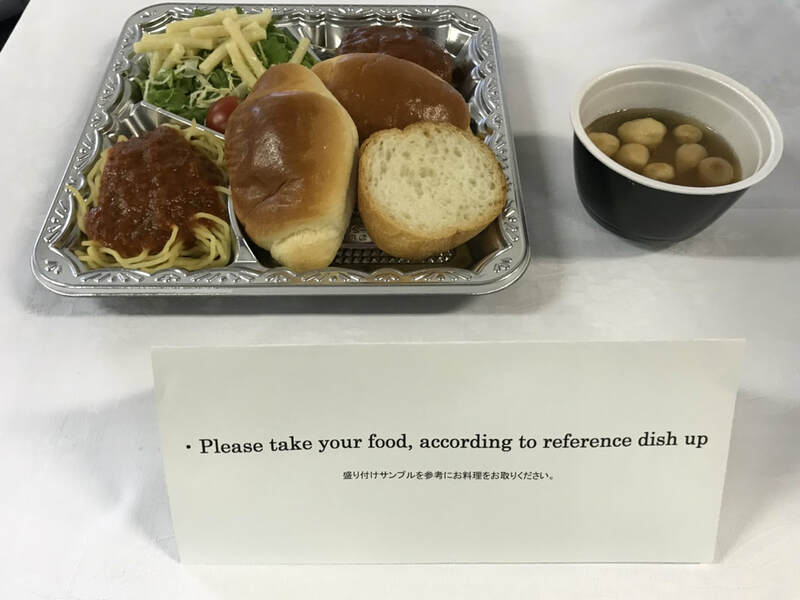 They always treat us with wonderful accommodations, warm hospitality and the occasional laugh from Japanese TV programs. In the evenings, after a dinner with fresh fish and endless options of Japanese foods, we would relax in the calming Onsen hot springs. 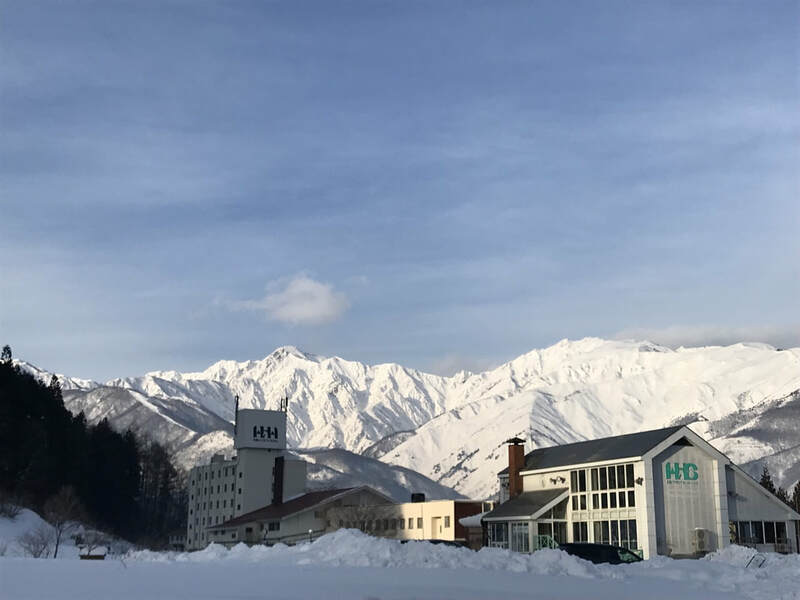 The ski town of Hakuba is the home of many of the 1998 Nagano Olympic venues. The Nordic venue is surrounded by a Rocky Mountain size ski resort, with runs that shoot right down to the big climb of the cross-country track. 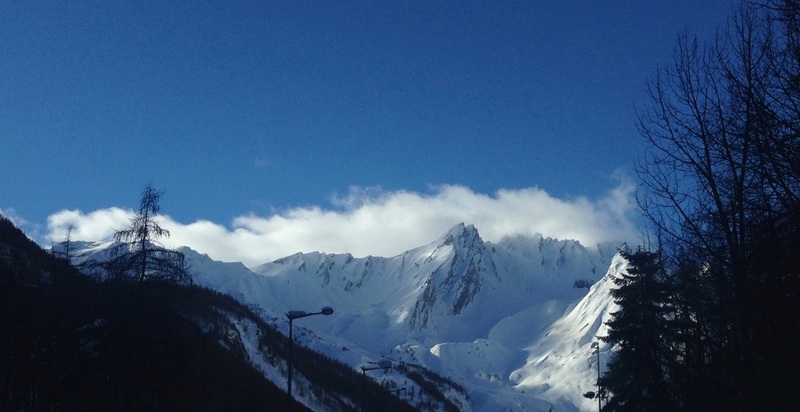 Above the ski resort, snowy peaks rise for more than 1000 meters beyond the highest lifts. 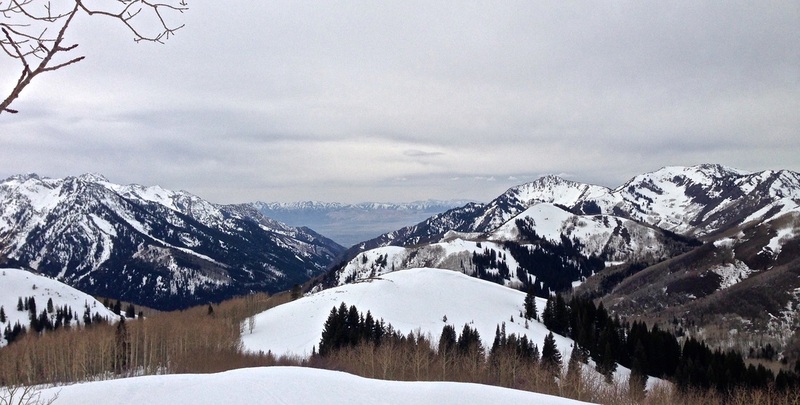 To put that into perspective, imagine Deer Valley with another mountain more than doubling it in the background. I’d be lying if I said I didn’t fantasize about staying and skiing powder for a few days after the event… maybe next time, definitely sometime. For the moment, it was time to get some points. Although no World Cup is ever easy, this one had just 38 competitors (with many athletes skipping competitions to prepare for the Olympics). On Saturday, however, I wasn’t at all close after the jumping. Until now, I had never not started the race after jumping. It’s tough to fly halfway across the world and then sit out a race, but this time it made far more sense to save my energy for the next day. Watching the racers grind five times through a grueling course, I knew I had made the right call. On Sunday, I finally put together a better competition jump – still not great, but I could hardly complain about going nearly 15 meters farther than my last three jumps. I’ve found that I almost always have my best races when I have a good jump and it really counts. 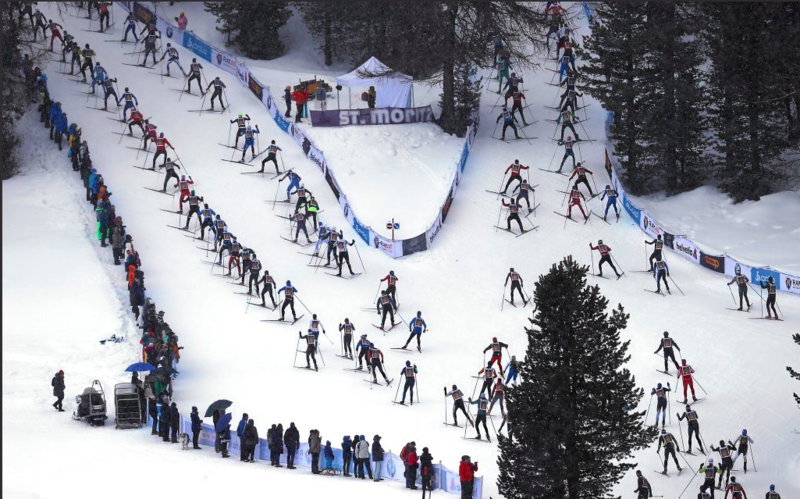 I hadn’t had a race on World Cup that I was truly satisfied with in about two years, but with a chance to bring in some points, I was more motivated than ever. 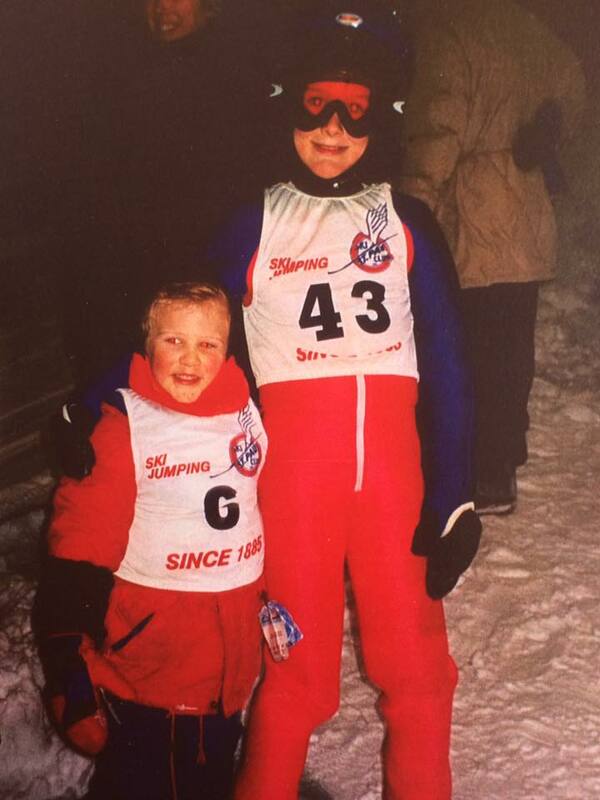 Starting in 30th, I ended up skiing to 24th, which was better than I hoped after the jumping. I was the 8th fastest on the day, a stat that doesn’t really matter, but it makes me happy, especially since my previous best was 9th from three years back. 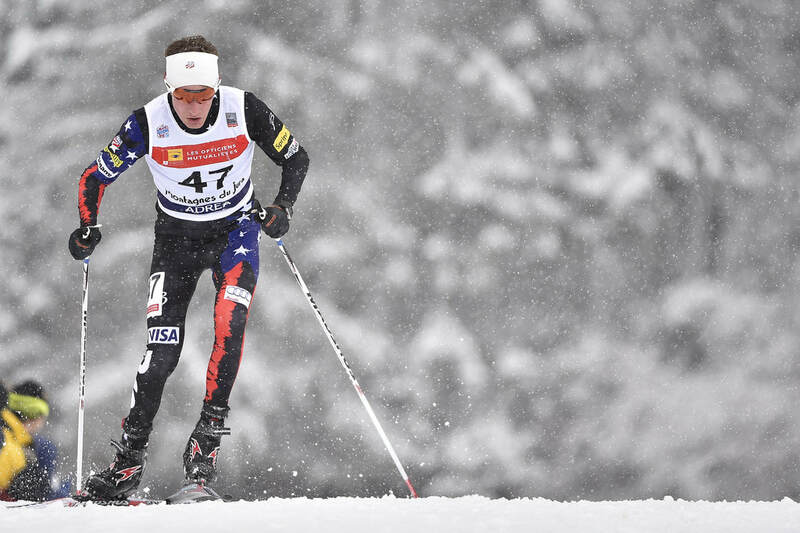 The day before, Ben Berend had scored his first-ever World Cup points with a strong 23rd place finish, so it was a good weekend for our team. A view of Hakuba. Notice the jumps below the Alpine resort. Our hotel in Hakuba... and the impressive Japanese Alps. Ok, we didn't eat sushi the whole time... lunch was supposed to be familiar. 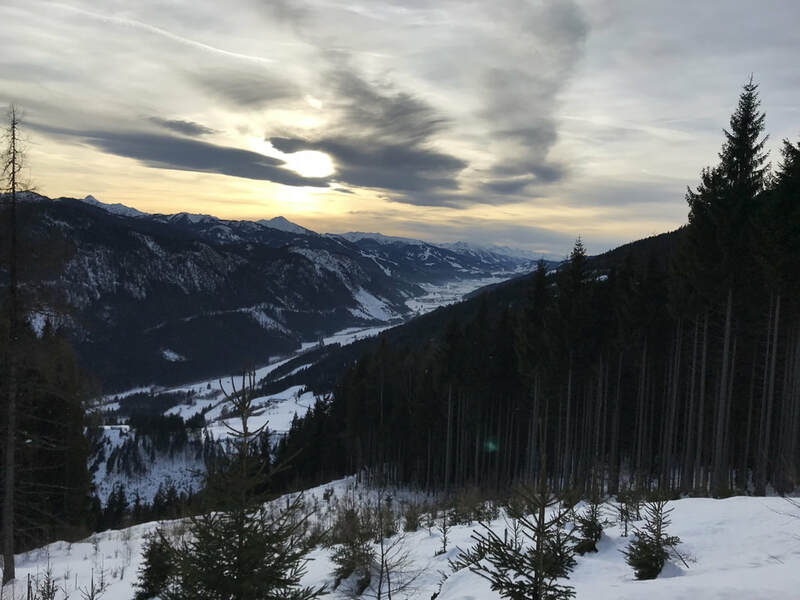 Seefeld, like Ramsau, is an Alpen-paradise – the perfect place to spend a couple days training before getting right back to competing that weekend. Asides from the 5:00 o’clock wakeup calls (thanks jet-lag), I had nothing to complain about. 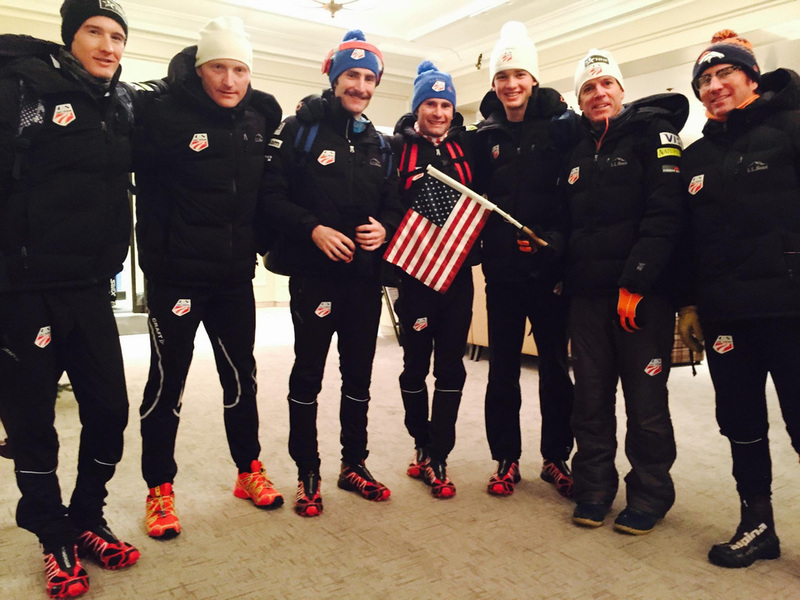 I was back with a full team here: Grant, Stephen, Jared and coaches/wax techs Tomas M. and Tomas K. I was happy to get a session of training on the hill, a nice easy classic ski, intervals on the race track, and some recovery time at the neighboring four-star hotel’s spa area. From Seefeld, we headed east, towards Vienna and the edge of the Alps for Eisenerz, Austria. This little town is where I first competed in a Continental Cup on international soil. Since that first eye-opening weekend in 2011, I’ve been back a couple more times. 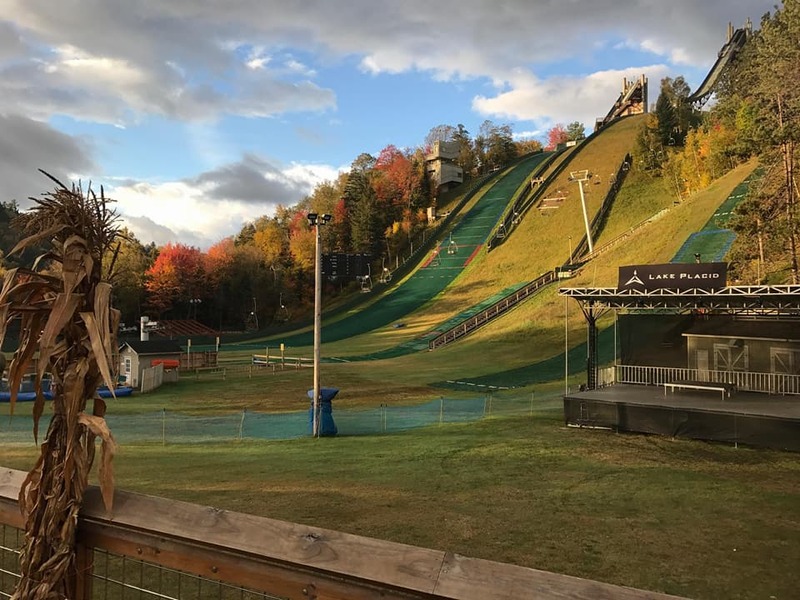 This year, I was excited to get on their completely new 97-meter hill, which was a drastic improvement from their old-school hill that I had competed on in the past. Despite my enthusiasm for the new hill, ski jumping didn’t suddenly get easy for me. I jumped to 45th on Saturday and 38th on Sunday. (In contrast, I skied the 7th and 9th fastest times). My 94.5-meter jump on Sunday was definitely a better effort for me, but the level of ski jumping on both the COC and World Cup circuits is higher now than ever. 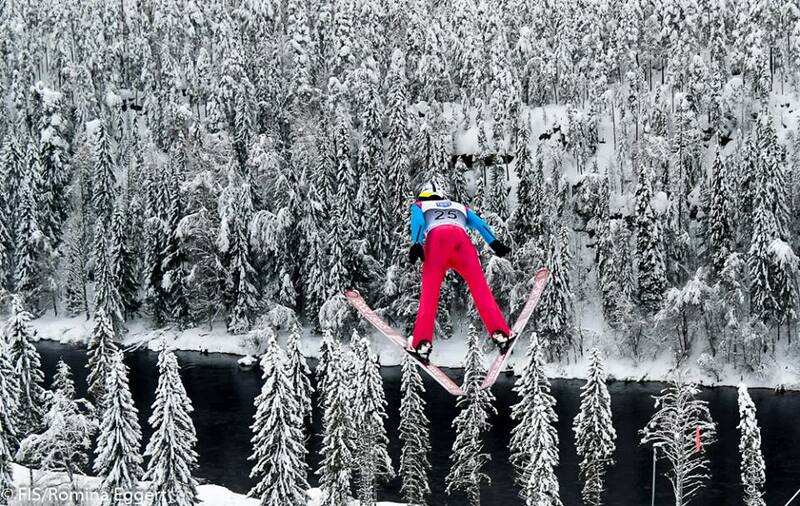 If you’re going to jump like that and still hope for a good result, you better ski real fast. 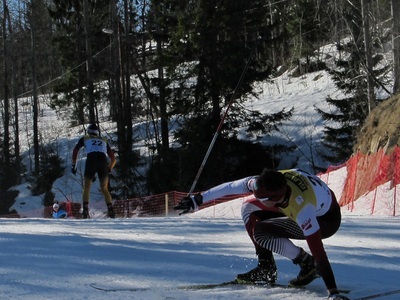 I tried my best to do just that, latching on to Bernhard Flaschberger, one of the fastest skiers in our sport. On the best of days, I can hang with him for a while, but one lap of flying through the pack with him was too much for me. On the second lap I went from around 30th to 20th place and right back when I “hit the wall” and watched the group that I had just passed ski by me. Ahead of me, “Flaschi” pushed on to an impressive 11th place (from 41st), but I had a bit of a resurrection in the fourth and final lap and skied back up to 22nd. It wasn’t a result to celebrate by any means, but it’s the best I’ve done on Continental Cup this year. At this point, I have to focus more on overall performance feelings – like I would in a summer competition – than getting too caught up in results and counting points and seconds. Making up ground in Eisenerz. Romina Eggert photo. That’s the gist of these last few weeks. I haven’t been on social media much, but I’ve been overwhelmed with the outpouring of support that I’ve received in texts, emails and messages from many of you. You guys are amazing. This winter has been extremely humbling, actually this sport in general is a generous dose of humility for me. Hearing from all of you has been a really needed balance for the tougher days. Finally, for those that missed it, I sent an email out to everyone who supported me in my Rally Me this year, trying to express my gratitude, which I copied below. Here I am, not going to the Olympics. In case of any luddites living without social media (which I do recommend trying), you'll need to hear it from me. I didn't make the Olympic team. 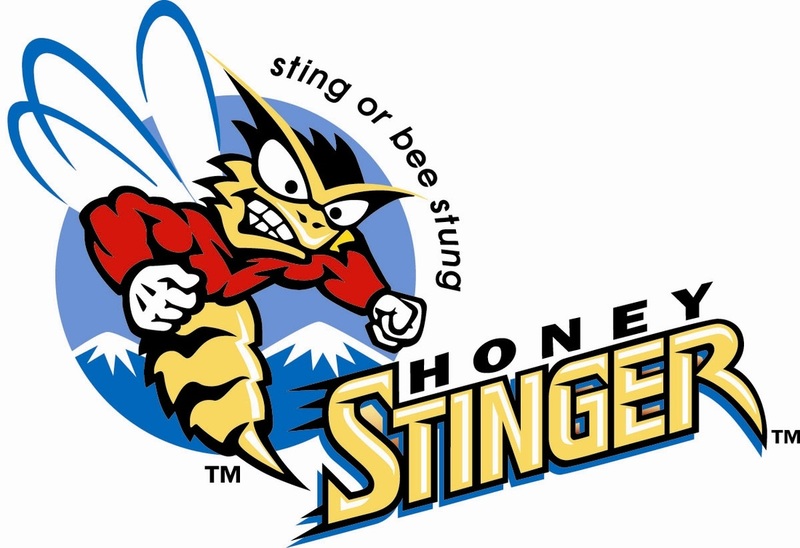 More than likely, you all already have known this since last week's team naming. Some of you were probably shocked and a little confused. If you watched Olympic Trials, you might have thought that my 2nd place performance would put me right in line. When we somehow, miraculously, ended up with five spots, surely you would have expected me to be among the crew. Up until a handful of weeks ago, if someone had told me that we’d send five athletes, but I wouldn’t be one of them, I would have been equally in disbelief. Our qualification is all about international rankings, and I never had a day like Trials on the World Cup or Continental Cup during the qualification period. I understood the criteria quite clearly; by the time the selection period ended, I knew where I stood… pretty low on the totem pole. After the official announcement, I heard from many of you. At a time when I needed support more than ever, a few words of encouragement went a long way. It’s funny how much more likely we are to give congratulations than condolences, but the messages in these few days meant more to me than they could have at any other time. Those that really helped me get through a few bleak days were the people kind enough to praise my strengths as a person, rather than simply a skier. With admittedly spotty success, I’ve endeavored to hang on to this concept. I try not let me entire self-image collapse simply because I often fail to execute over the space of 40 or 50 meters and a time span of a few seconds. From a macro perspective, this notion seems completely irrational. But I’ve given everything to this sport, and I’ve had the full support of a family, community and staff at my side. 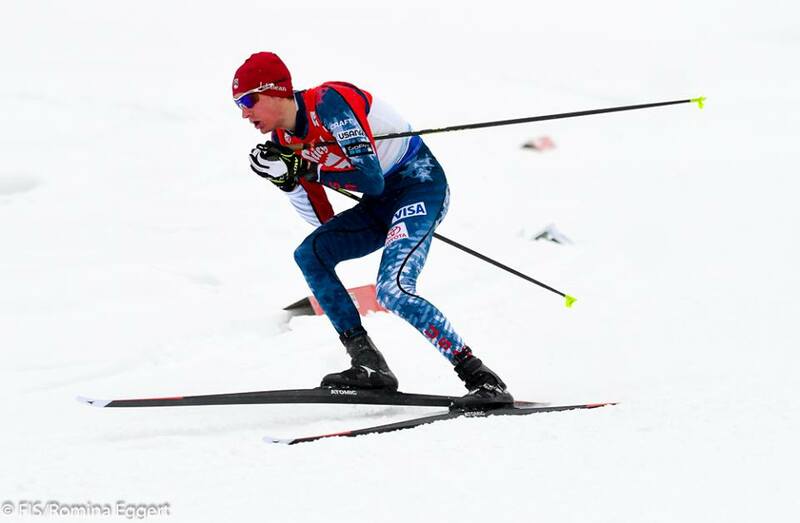 For years, every goal I set was focused on Nordic Combined: metrics like average ranking, COC and World Cup results, and ultimately preparing myself to ski at the 2018 Winter Games. And now, it feels like failure. I’m not the first to feel this, I certainly won’t be the last. Right now, I need to accept this and grow beyond wrapping up my identity with whether or not I have the Olympian prefix. When I don’t get so caught up in the moment, I take a look back at all of the amazing times I’ve had pursuing this dreams, and I really wouldn’t trade them for an easier way. The experiences of this year alone certainly outweigh a couple weeks of being spoiled by the USOC. To tie all this together, the real reason I’m writing this is to thank you one more time. I realize now that when I said that I needed your help in order to achieve my Olympic Dreams, it may have been with unfair focus on the result. In reality, what you all really enabled me to do is so much more than I can possibly convey here. This year, the stars didn’t align, but your support doesn’t mean any less because of it. I am forever grateful. 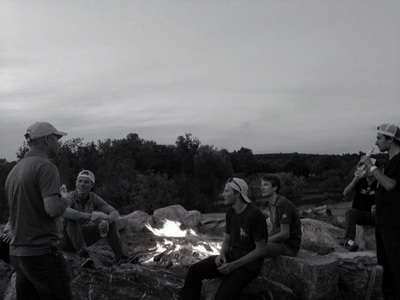 ​This last camp was one of the shorter overseas trips I’ve had in quite a while, but we made our time count. We flew over to Germany on the 23rd for just 11 training days. 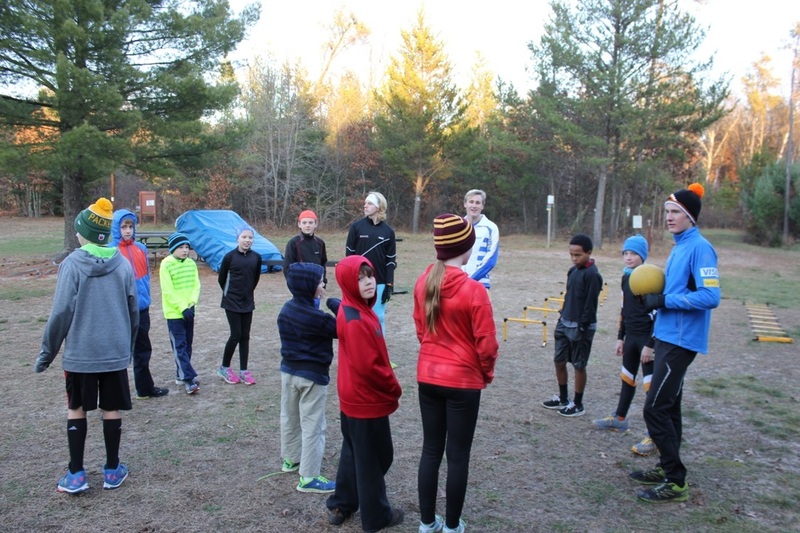 Our coaches designed the camp with a dual focus on high quality jumping and high intensity cross country training. 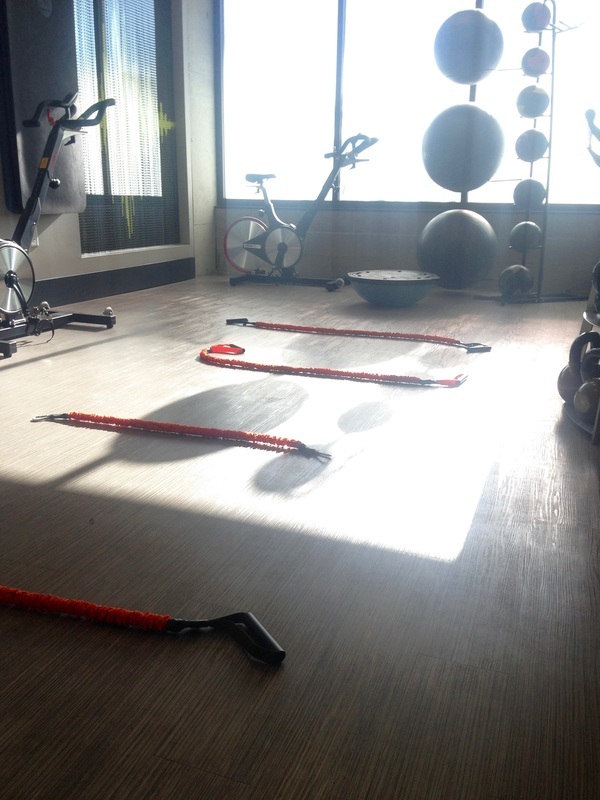 In this short block, we packed in 7 jump sessions, three strength/plyometric sessions, 6 interval workouts on rollerskis, 2 races, and 2 level 1 runs. Squashing jet leg to start a killer camp with a run on Day 1. 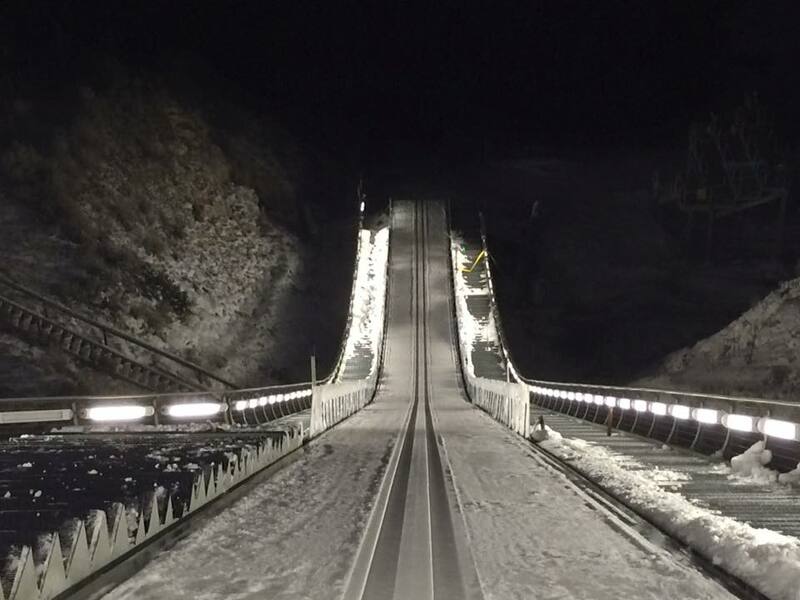 Oberstdorf is one of the best places to be this time of year, particularly because they turn on their refrigeration system on the inruns and ice over the track. 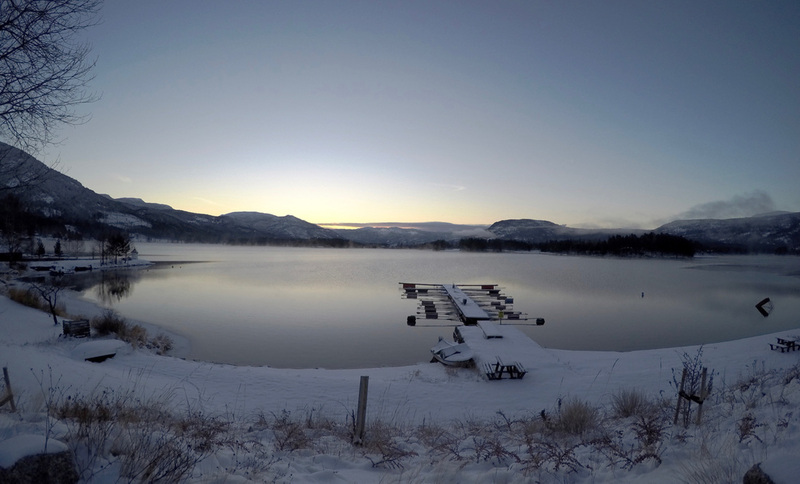 Despite landing on plastic, we get half the feelings of winter jumping with the smooth, ice track before launching. 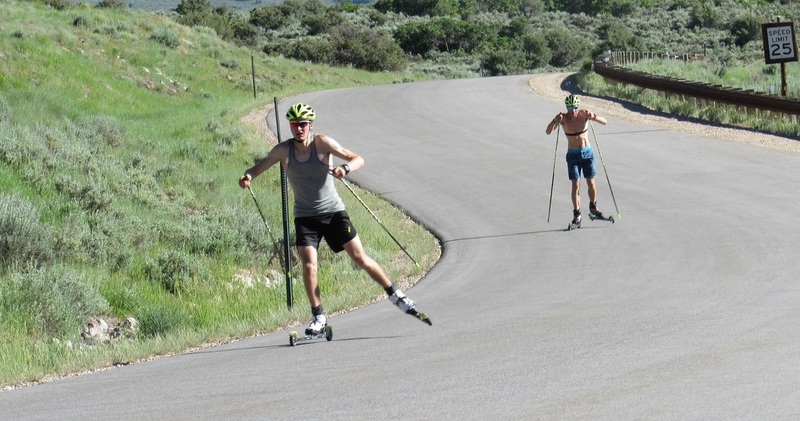 There’s also a challenging roller ski course just outside of town, where we spent most of our afternoons. These sessions were our last before we wait for snow to fly, so it was important to dial things in and cement the improvements we’ve been working on all summer. Ideally, by this time of year we’re not making big changes, just fine tuning and setting a good level before the season. However, I went into this camp with some work to do, but I was able to make some big changes throughout the week. 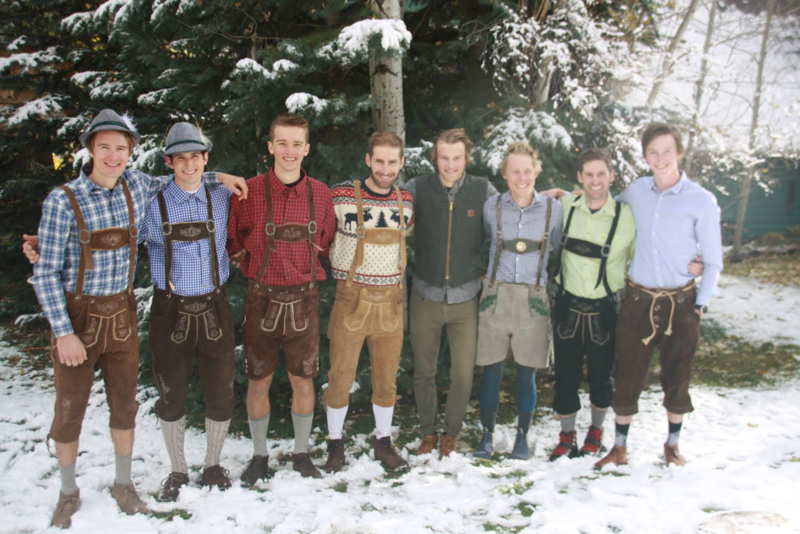 All of USA Nordic - men and women's jumping, nordic combined and staff, together in Oberstdorf. Our 8-man team, happy to be together and working hard. Nathaniel Mah photo. Searching for flight off the takeoff. Romina Eggert photo. ​A big part of my ability to make positive changes this trip was an increased focus on the flight phase of my jump. Throughout this summer, my takeoff has gotten fairly consistent. Although sometimes lacking in power or perfect timing, my technique is generally close enough to where I should be able to fly. I came to realize that working to get into an effective flight position is going to be the most beneficial thing that I can do. Jan Matura, our newest coach, was instrumental in helping me make these changes. Jan came on this summer, primarily to build and alter our jump suits, but he’s stepped into more of an all-around coaching role. 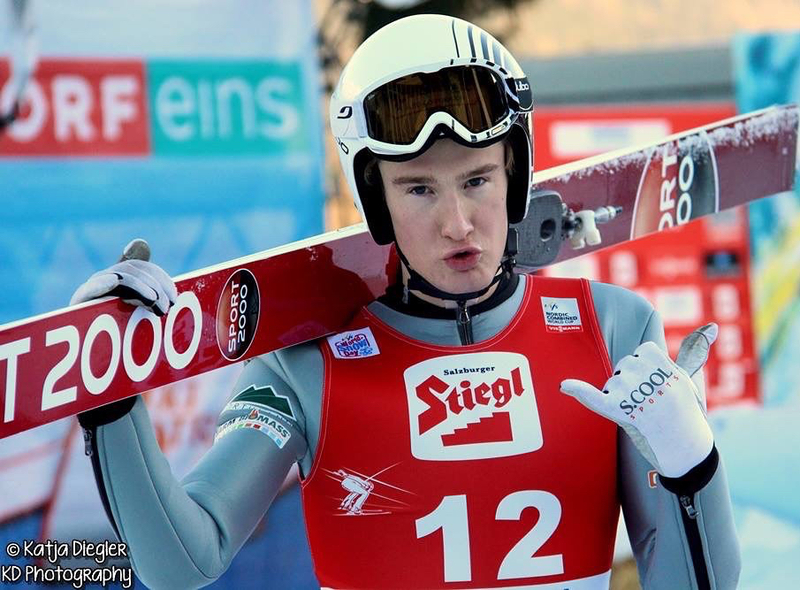 Jan just finished up a very successful 15-year career as a ski jumper for the Czech Republic. 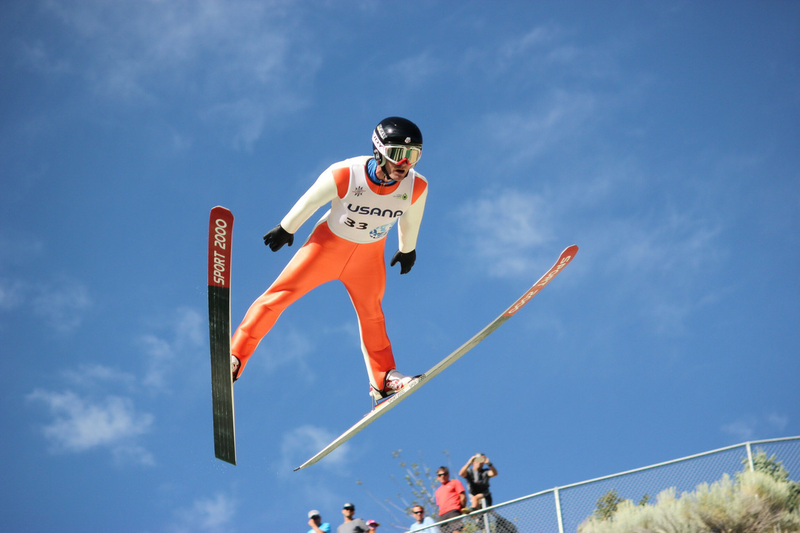 He’s got a couple World Cup wins under his belt, and has been to four out of the last five Olympics – dating back to Nagano (’98) in his days as a Nordic Combined skier! Add in that his cousin, Tomas, has been working with our team for five years now (first as a wax-tech, now as a coach), and Jan is a perfect fit for us. 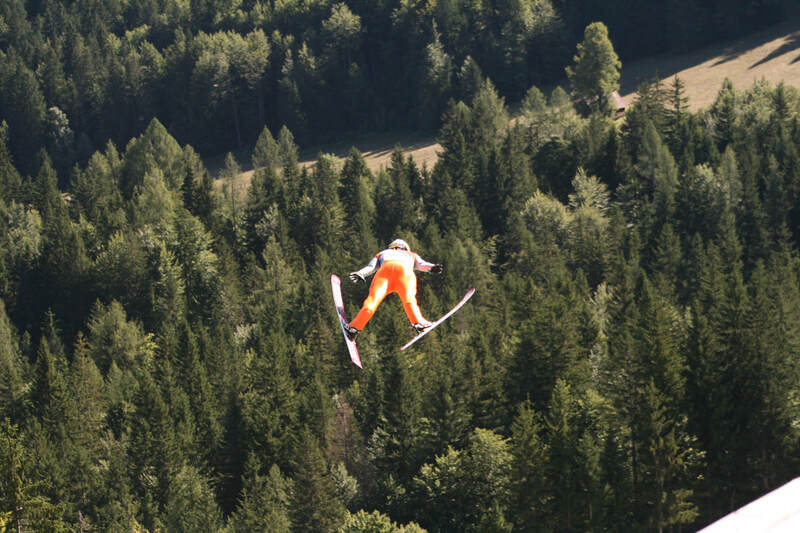 Jan shared his experience and knowledge from the ski jumping circuit to provide new insights for the entire team. He meshes great with our other coaches, Tomas Martin and Martin Bayer. It felt like they have been a team for ages. Preparing for flight. Caro Erbe photo. The biggest challenge of this trip was managing the heavy cross country load. We jumped nearly every morning and then hammered out intervals in the afternoon, ranging from 8 x 5 minutes near race pace to 10 x 1 minutes at maximal effort. Whether long and grueling or short and sharp, all our sessions on rollerskis were demanding! 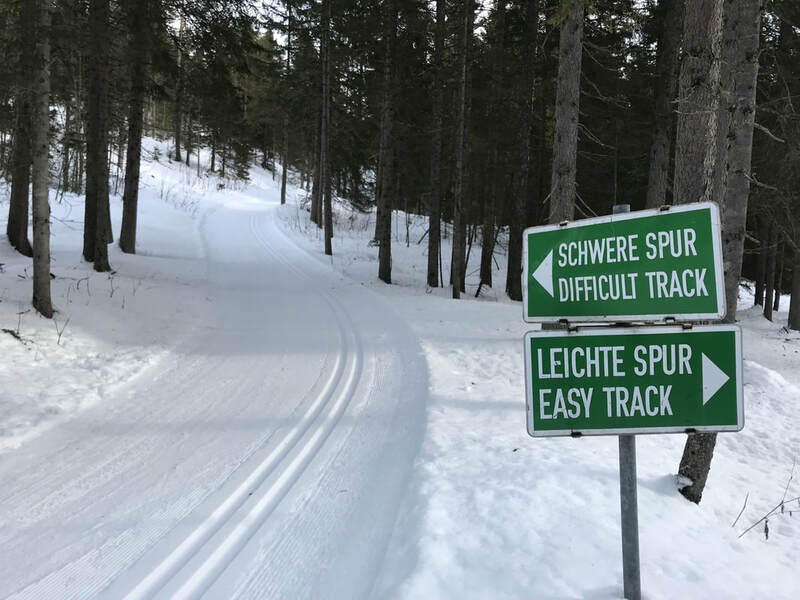 Our coaches threw in two races, one in traditional Nordic Combined format off a jumping competition, and another, our last workout of the trip, a mass start. It’s one thing to manage this training load as an endurance athlete, but the real key is to be able to stay fresh, or at least ignore tired legs and still make improvements on the jump. ​Amazingly, our whole team seemed to be having better and better sessions as the camp went on. It wasn’t until the last day of jumping when all our bodies seemed to give in. 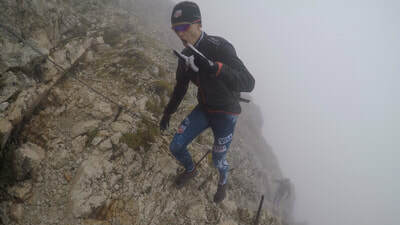 We were hoping to end the trip with a rad session of only far jumps, but tougher conditions and tired legs made things a little more difficult. It was almost uncanny the way we all felt the fatigue, like we had held it at bay until the last minute, and could do no more now. That said, I can still jump with less than 100% strength, and it’s actually an important skill to have in the competition season. It just takes some willingness to acknowledge and accept how my body feels and then focus on what I’m working on. Mass start racing for our final workout of the trip. Packing in this much training, especially while trying to focus on jumping and high intensity cross country training, was definitely a risk. 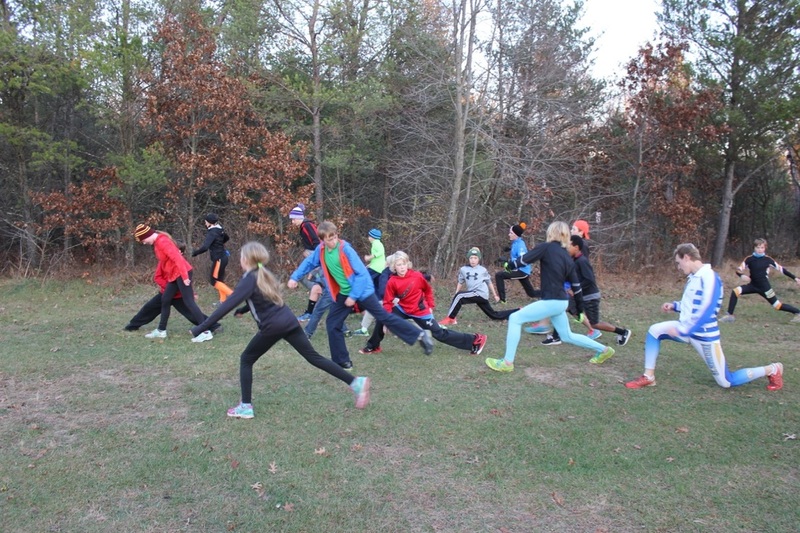 Obviously, jumping at a higher level is the priority for most of our team, but we needed to include this block of training for cross country as a part of our pre-season prep. We didn’t have time or energy for much besides eating, training, technique analysis and sleeping – the true athlete life. This kind of focus is what it takes to maximize training benefit. We stayed in apartments, rather than a hotel with a meal plan, which ends up being a bit more work but is far more cost effective. Our coaches helped with doing most of the grocery shopping and the cooking. Normally, I’m all for helping in the kitchen, but this trip is was nice to recover after training while the coaches worked on dinner. Tomas was head chef, whipping up some killer meals every night. Small German towns like the one we stayed in outside of Oberstdorf offer little in the form of distractions. We did indulge in celebrating Halloween, with some candy to share and a horror movie night. Next year, maybe we’ll come prepared with costumes to wear on the jump. (Nick Mattoon showed us up in this department, jumping with a shark suit back in Park City). As usual, the trip ended with a shuffle of gear. We needed to organize for what we were leaving over in Europe for the winter, skis to get stone-ground in Germany, tools and wax in the appropriate vans, and our own duffels packed for the trip home. There's no way to travel light when you have gear for two sports. Now we're back in Park City, continuing to prepare for winter and hoping for snow and cold temperatures. Taylor, Bryan and Ben Berend are heading back overseas in just over a week. 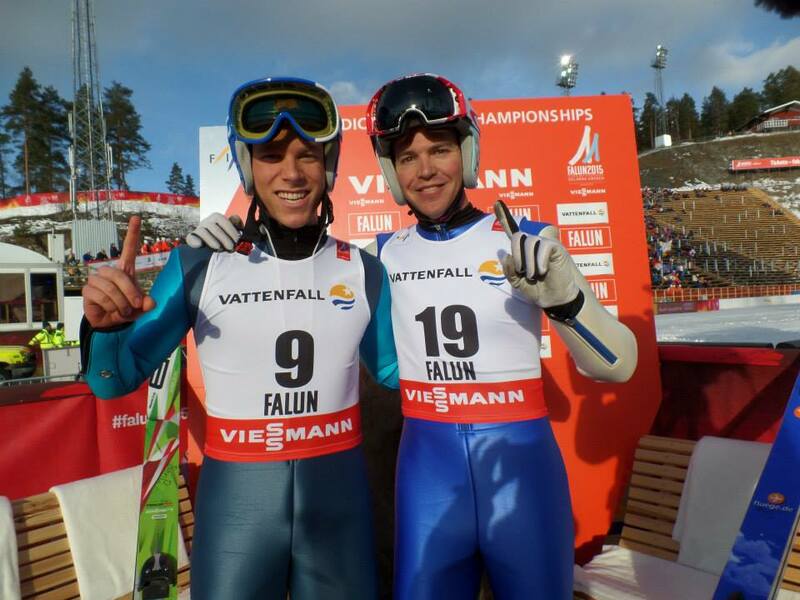 They'll compete in the opening World Cup in Ruka, Finland. 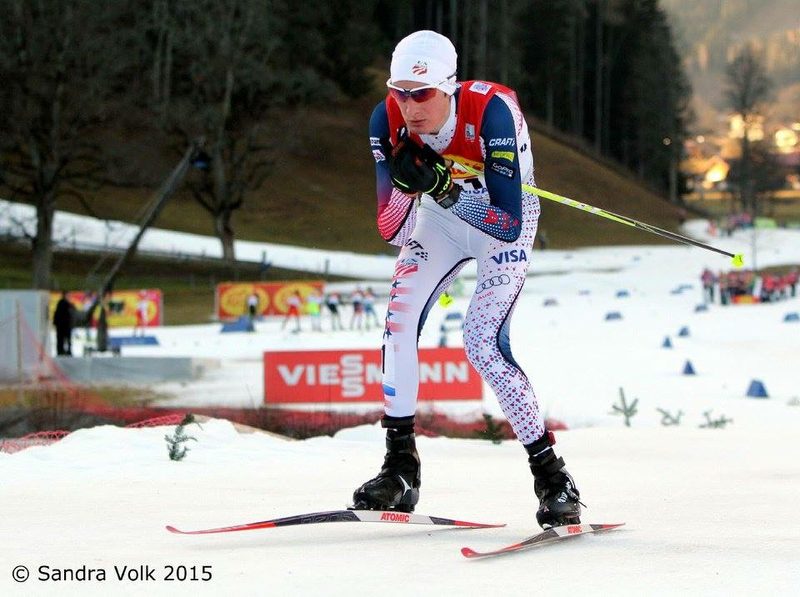 I'll be back in Europe in 30 days to start my season on World Cup in Ramsau, Austria. 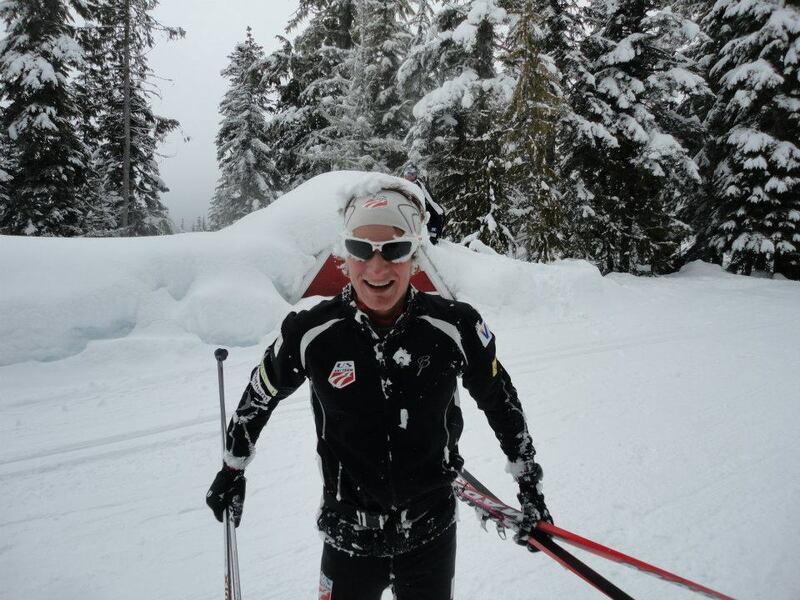 In the meantime, some of us will be racing against cross country skiers in West Yellowstone over Thanksgiving weekend. 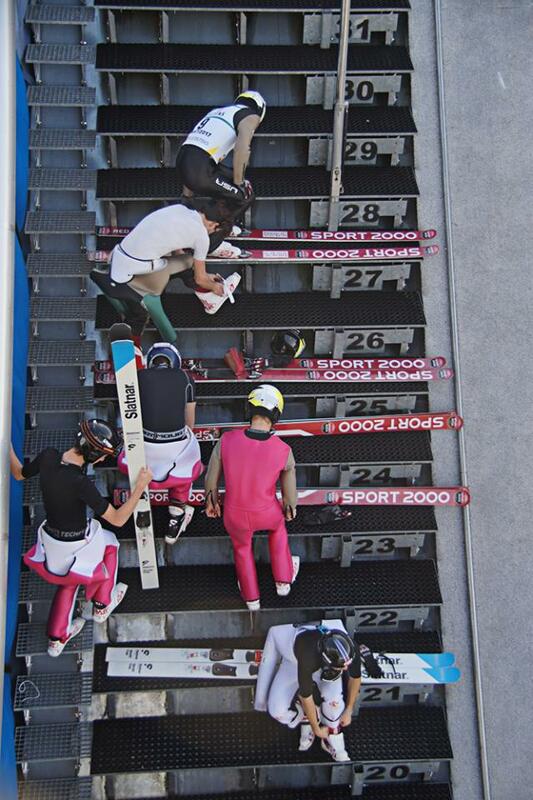 Following that, we'll have Winter Start, a prep competition in Steamboat Springs. I'll keep you updated on how the early season goes! Packing it up... lots of gear to organize. 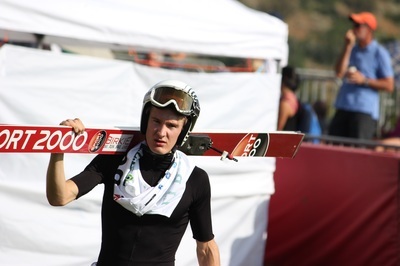 Leading the charge of skiers trying to make up time in Planica. Romina Eggert photo. ​After a little time back in Park City, and a short break before getting back on the jump hill, I’ve realized that I was ready for a reset. I’m not one to struggle with homesickness or dread travel. But after a point, everyone needs some time to reset. My desire to sit down and write is usually pretty low after disappointing results. I don’t want to spend my time dwelling on mistakes, as if writing makes the past more real than moving on. However, as I share my journey with readers here, it’s not fair to anyone or the sport to stick to the highs and ignore the lows. As a whole, I had a fantastic summer and fall training block overseas. If you read my earlier posts, you’ll know that we had some of the best training opportunities we could ask for, as well as some good competitions. I was able to score Grand Prix Points at the end of August, and hoped to build upon that result in the next competition opportunities. 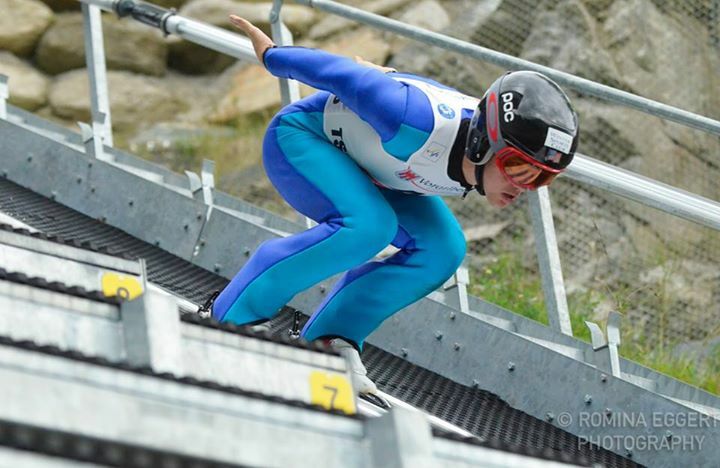 Our final weekend in Slovenia was spent competing in the last leg of the Grand Prix circuit in Planica. 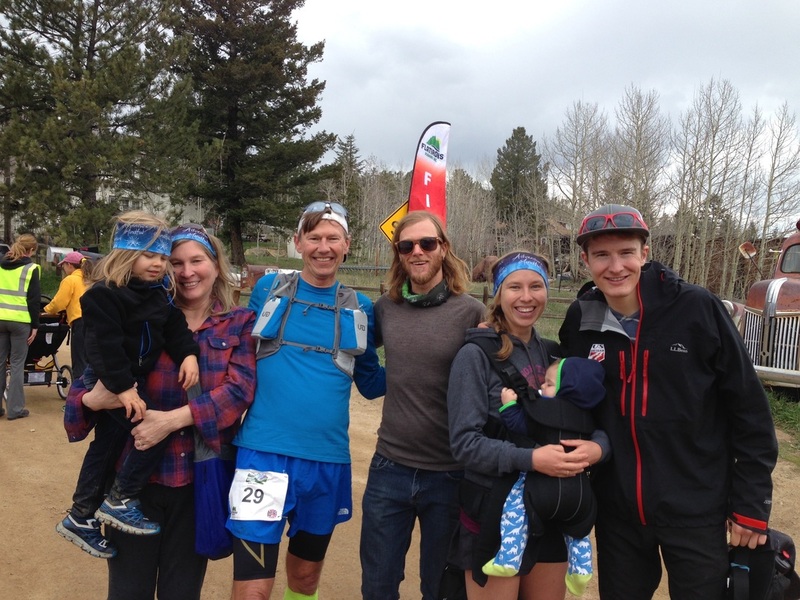 It was as close to a home competition as we’ll get outside of Park City or Steamboat. However, it doesn’t matter how well you know a hill if you can’t find the rhythm and jump with confidence on a given day. Due to my results on Saturday’s event, I sat out on Sunday and cheered on my teammates. Forced spectating is always a bittersweet experience. On one hand, its much less stressful than competing, but I almost immediately miss the opportunity to lay it all out on the line and see where I stack up. After Planica’s competitions, we finally headed stateside – for a short competition week in Lake Placid before continuing on to Park City. 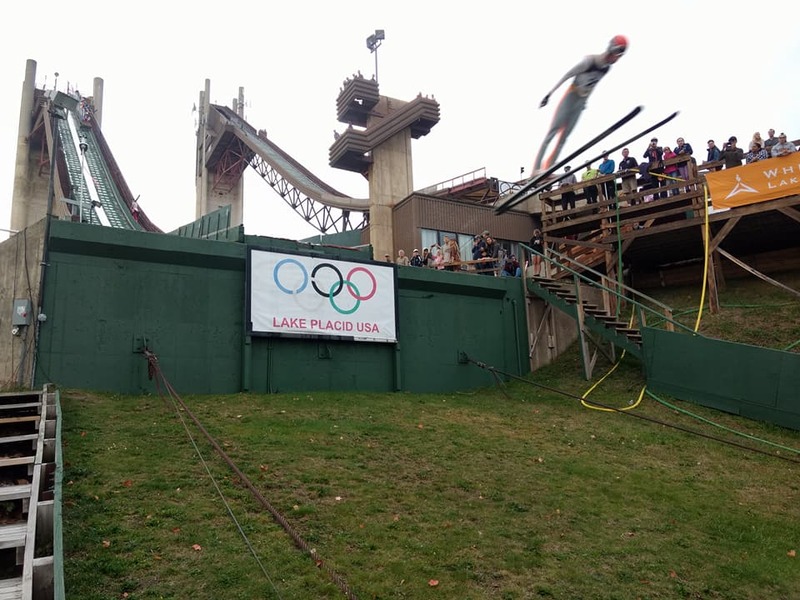 The primary focus of Lake Placid was on US Nationals Championships – held on Sunday on the 1980’s Olympic 90-meter jump. Lake Placid on a beautiful fall day. 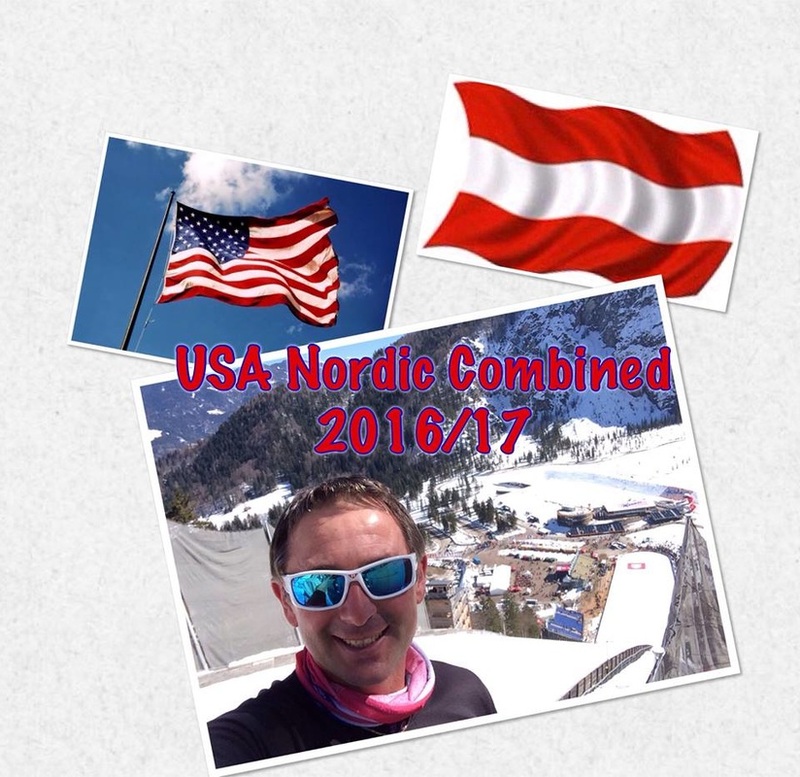 USA Nordic photo. Although I’ve had good results in Placid in the past, this time didn’t meet all my hopes and dreams. 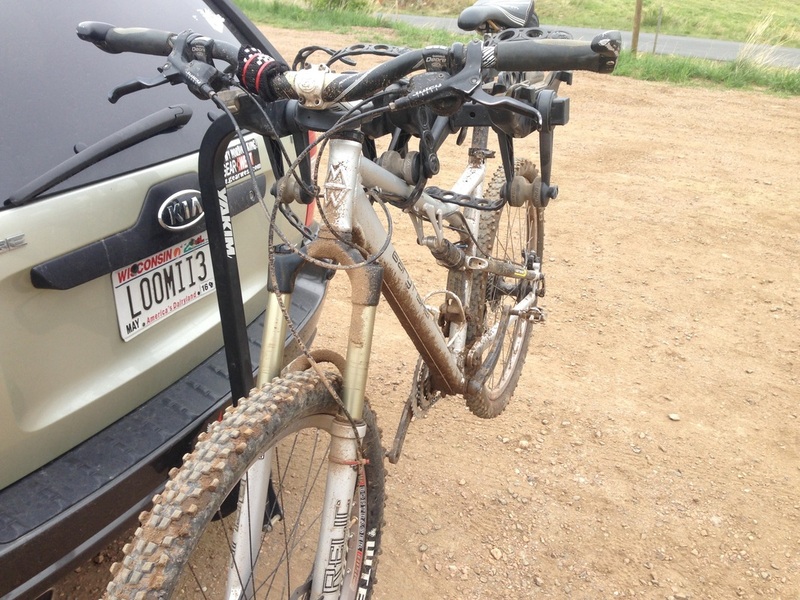 It started as a shock to adjust to the new hill and ended in a rut of struggling from painfully low speeds. Our Nationals are held with the ski jumpers, against the best special jumpers in the U.S. Over the past couple years, these guys have made huge progress. It’s been exciting to watch, but it’s not so fun to jump from their gates. You'll understand if try as hard as you can to hit a golf ball further than you’re usually capable of without your handicap and into a stiff wind. That golf swing won’t get any better until you take a step away and come back later, with a relaxed grip, no expectations, and a 1000 less thoughts racing through your mind. Those easy strokes that you’ll soon be hitting are what create confidence which you can build upon. But as soon as you trying with all your might again, it’s going to get tough. Come racetime, I had already been agonizing all weekend with embarrassingly short jumps. If you were there, you wouldn’t have seen strong showings of emotions from me. I tried to keep it inside, but was numb with disappointment after competing. 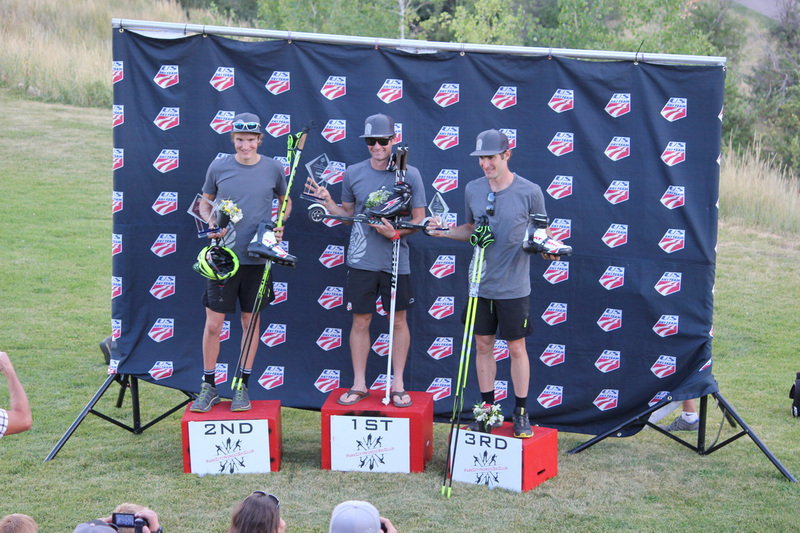 I knew after the jumping that I had almost no shot at a spot on the US Championship podium. It's not always as easy as we make it look. 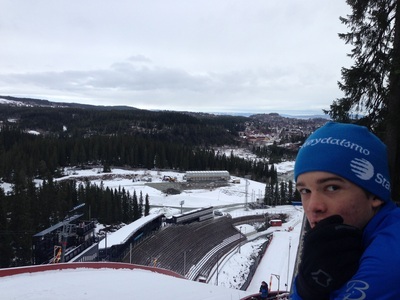 Junior Team member Beckett Ledger, USA Nordic photo. 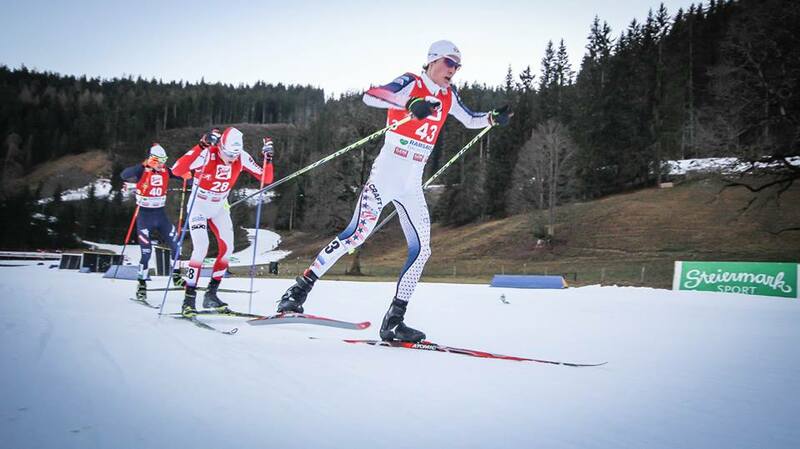 If you think that a 10km race is the painful part of Nordic Combined, let me tell you something. A race is quick, compartmentalized pain, and on the right day it's even fun. The feeling of failure is far more lasting. As twisted as this sounds, I used this perspective as motivation for the Championship race. 25 minutes of racing, how bad can that really be? Compared to falling short of my goals and performing well below potential, this pain would be manageable. Yes, racing hurts, buts its acute and short-lived – far better than dull, lingering pain of failure. A simple answer is mental toughness. But to me, it’s more than this. It’s desire. Perhaps they are one-and-the-same, but to switch from disappointment to intense motivation takes a desire to be great, no matter what. On Sunday, I tapped into this. I flipped this dial in the course of my warmup, minutes before the race. Headphones in, jaw set, I decided I would be able to give it my all in this race. The Championship podium was out of reach, and I was lucky to finish in fifth. After the race, my perspective of pain was still off. I hardly remembered the race hurting, but I know it did. I know that I gave it everything I had, which was all the redemption that I needed. Hammering into the last lap with Taylor Fletcher (right). 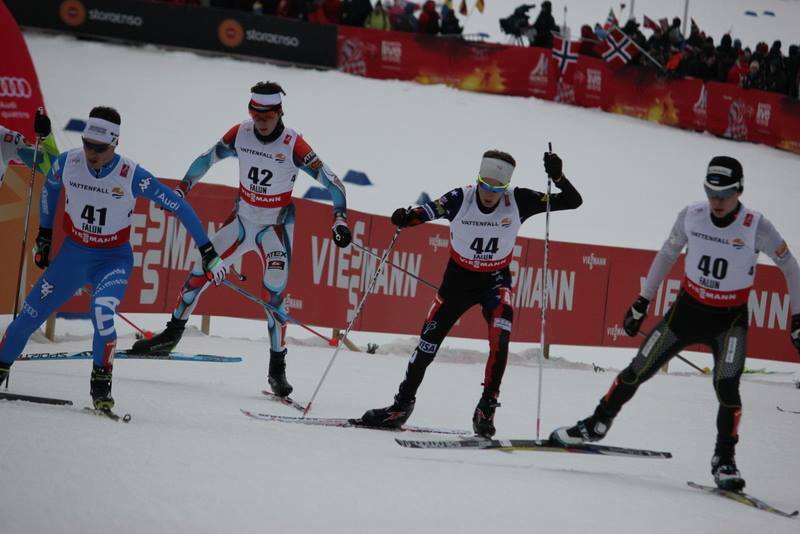 USA Nordic photo. 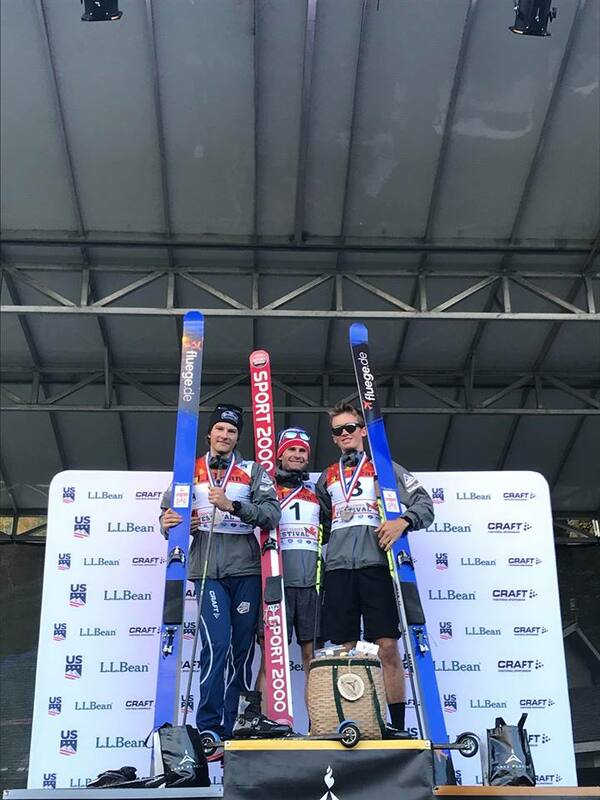 Your 2018 National Championship Podium: veteran Bryan Fletcher, with first-time medalists Ben Loomis and Jasper Good. Redeemed or not, I was still feeling disappointed. Yes, I was impressed with Bryan’s winning performance, and proud of Ben and Jasper standing on their first National podium. But I was still feeling pretty gloomy. It takes time to reset after a couple tough competitions, a few days off from jumping and training on familiar grounds. 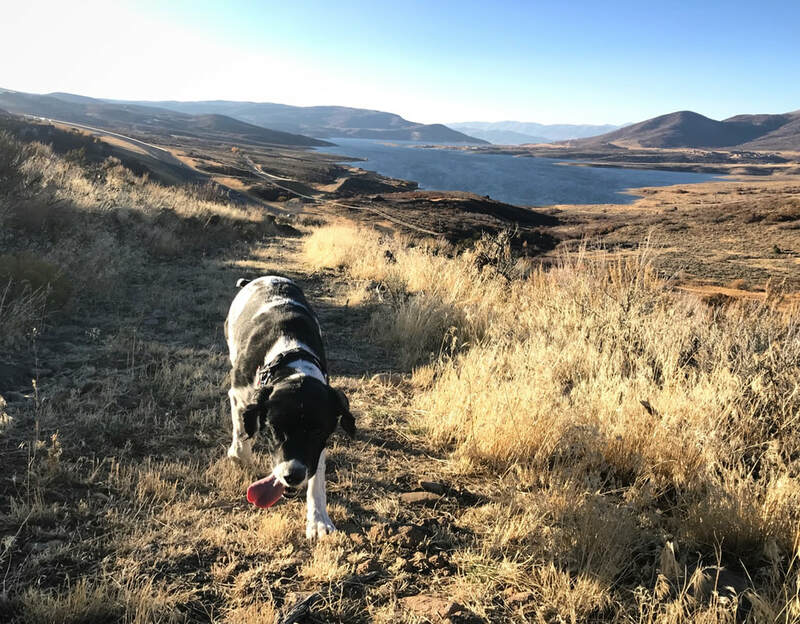 Hitting the trails with Jordanelle Reservoir in the background and my favorite (four-legged) training partner. 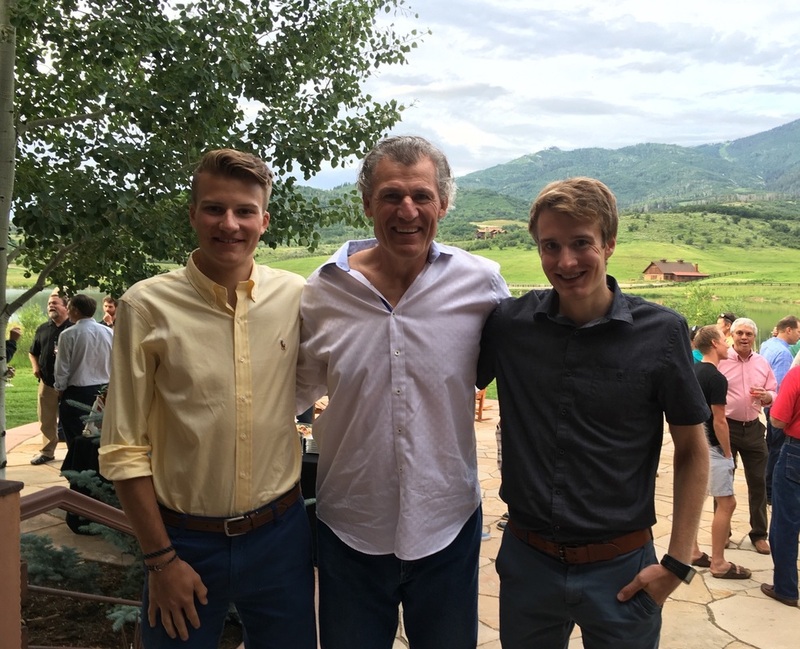 We spent this last weekend in Steamboat Springs, CO. Our entire team made it over for the third annual Oktoberfest fundraiser. 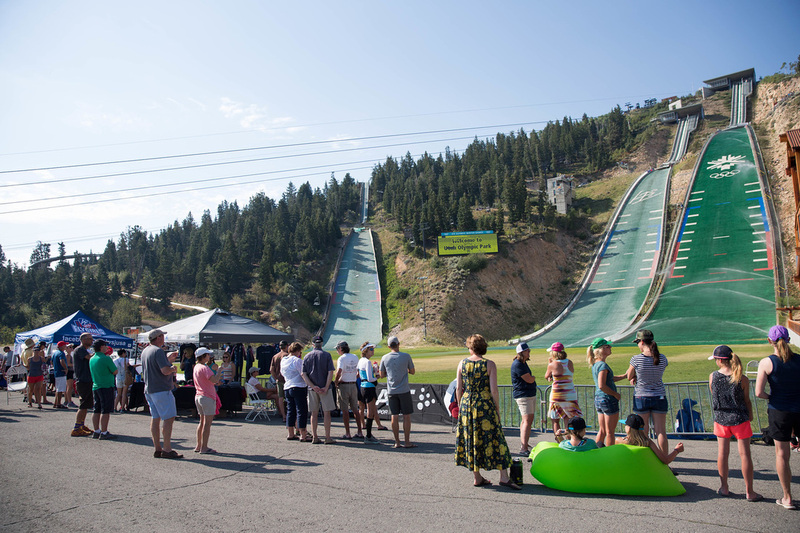 A few dedicated parents put in some serious work to make this happen, and the support of the Steamboat community never ceases to make it worthwhile. We didn’t break out our jumps skis while we were in the Boat, but we came out to show some support for the younger Park City and Steamboat kids jumping on the 70 and 40 meter. I don’t have the skills of their coaches, but I enjoy stepping in to motivate the next generation. I know how important it is for the youngsters to have the “big guys” to look up to, and the relationship goes both ways. We all enjoy the refreshing attitudes and joy of a little kid on a big ski jump. In fact, these kids were so motivated to jump that they had no hesitation clearing the fresh snow off the jump before the session. Actually, I think they had as much fun doing this as anything. Many hands make quick work. 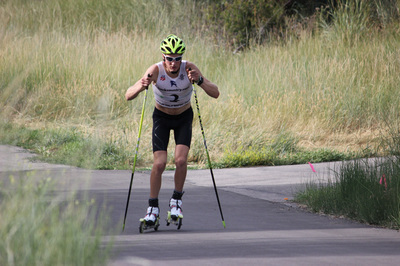 USA Nordic photo. Shoveling hard and wondering "What's up with Friday night snowstorms in October?" Feeling rested, centered and focused, I’m ready to head back to Europe now for one last important training camp. Tomorrow (Monday) we’ll be en route to Oberstdorf, Germany, for a two-week block of high quality training. 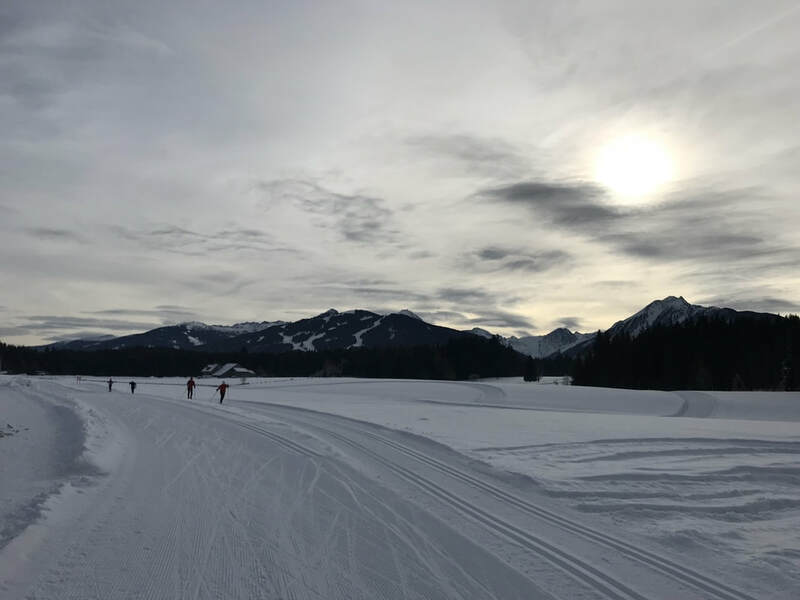 Oberstdorf is one of the few hills open at this time of year, and it has the significant benefit of a running ice track. We’ll get half the feelings of winter here, jumping from a refrigerated inrun but landing on traditional plastic. I'm looking forward to showing my coaches and I that I’m ready for winter here. By the time we return from this camp, I should have a better idea of where and when I’ll be starting the season. For now, it’s a bit up in the air, so there’s nothing I can do but hold my head up and keep plugging away. Thank you for reading, and for the continual support. I’ve been really amazed with the community support this fall in my Rally Me campaign. I still have two weeks left to meet my goal, and we just made it over the halfway mark. If you haven’t already, I encourage you to check out the page by clicking below. Again, thank you all so much for the support! I can promise to pay it forward! Everyone loves a costume party. Kitted in lederhosen for the Oktoberfest fundraiser. One more thing... I should have time to keep blogging this season more than usual as I just finished up my last course with DeVry University! I'm feeling pretty fortunate to have undertaken this work while continuing to compete. As soon as the diploma comes in the mail, I'll officially have an B.S. in Business Administration. Maybe I'll keep busy this winter studying for the GRE! 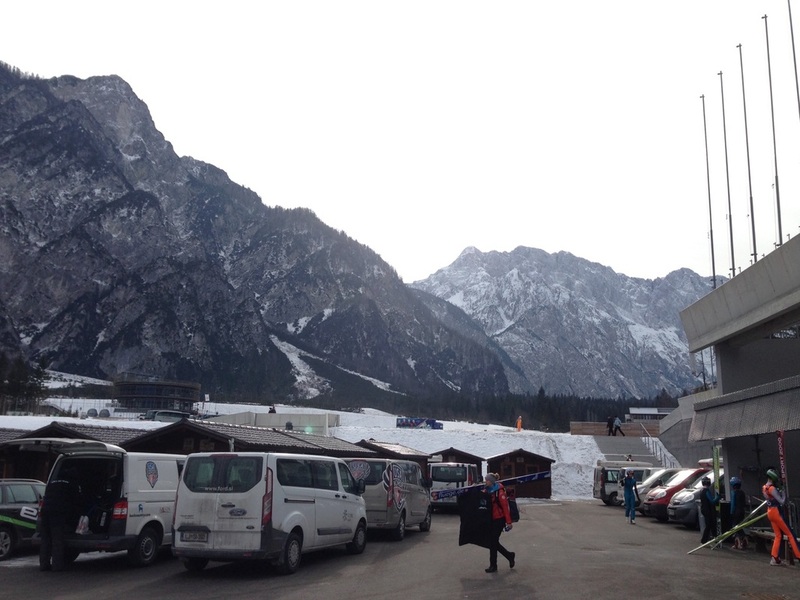 ​This last week, we packed up from Planica and drove to Ramsau, Austria. 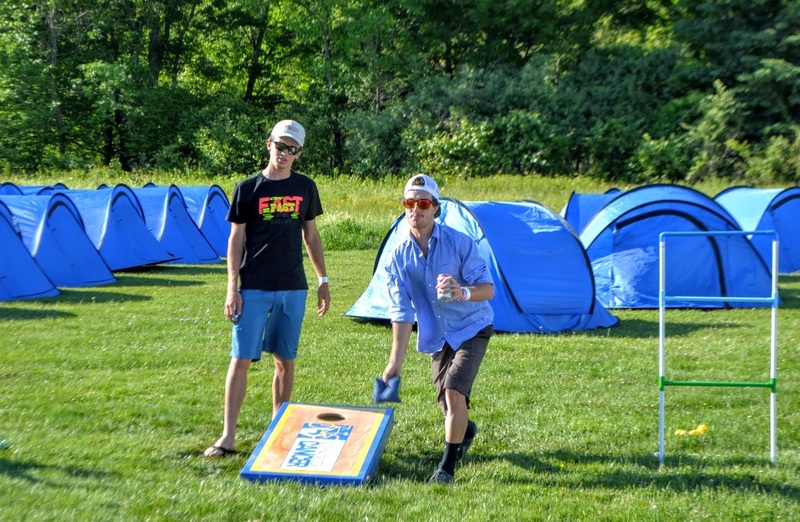 The beauty of living in Europe with a home base is that we can easily get to new places for camps without feeling the drag of continually being on the road. Ramsau checks all the boxes for a perfect camp. 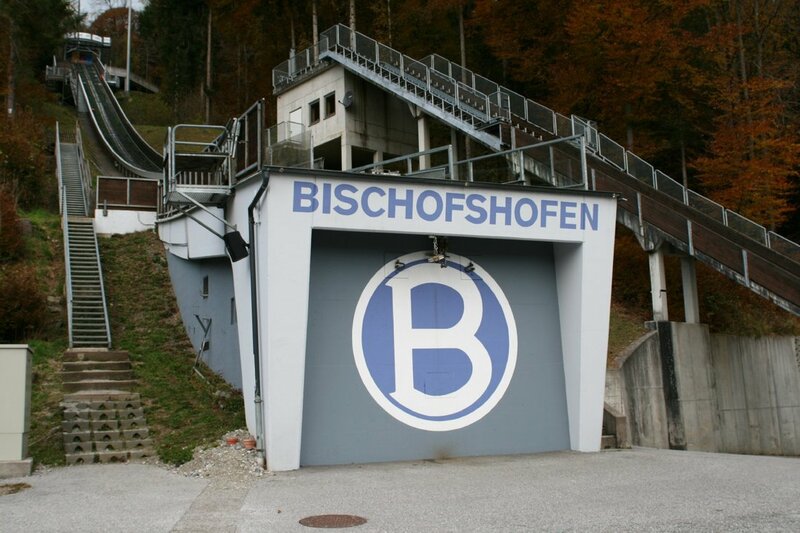 First off, it’s an easy two hours from Planica, and we can train on the K90 where we’ll compete in December for the World Cup and then drive 40 minutes to jump the large hill in Bischofshofen. We also stopped at the Atomic factory on the way in Altenmarket, just before heading up the mountainside to Ramsau. Our whole team is on Atomic cross country skis now, so we picked up some new skis to test and discussed what we needed before the winter. It’s pretty convenient to be able to just pop in to the European headquarters like that. In addition to jumping, one objective was to get up on the Dachstein glacier, which is open for skiing almost year-round. (This year it was closed for much of July, a trend which is likely to only be increasing). I’ve probably been to Ramsau a dozen times now, but the view of the enormous Dachstein mountain towering above town never ceases to amaze me. Surprisingly, in all my times there, I’d never been up to the glacier. 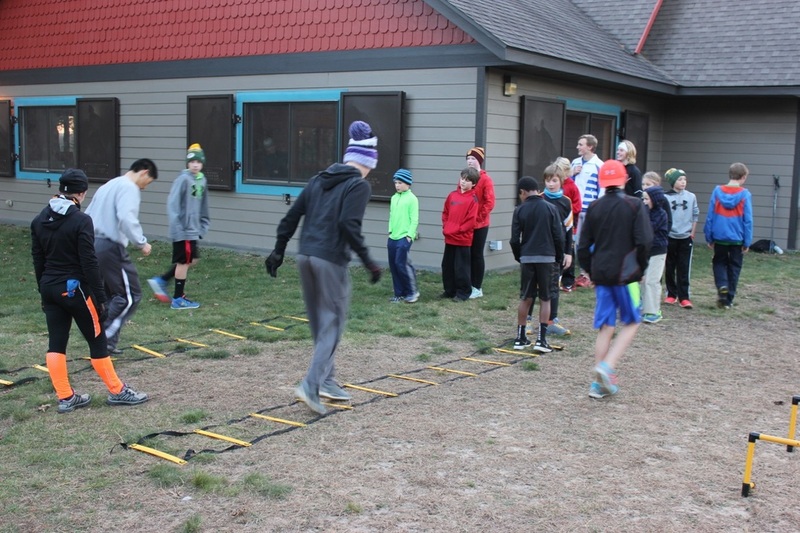 Before we got up to ski, we had three days to focus on jumping. After a session in Ramsau, we drove to Bischofshofen the next two mornings. Bisch is a special hill, probably the most unique of any jump I’ve been on. The inrun is incredibly flat and long before it eventually ends in a 5-meter-high takeoff. It was fun to get some flying time here, and helpful to jump a completely different profile hill than the ones in Planica. 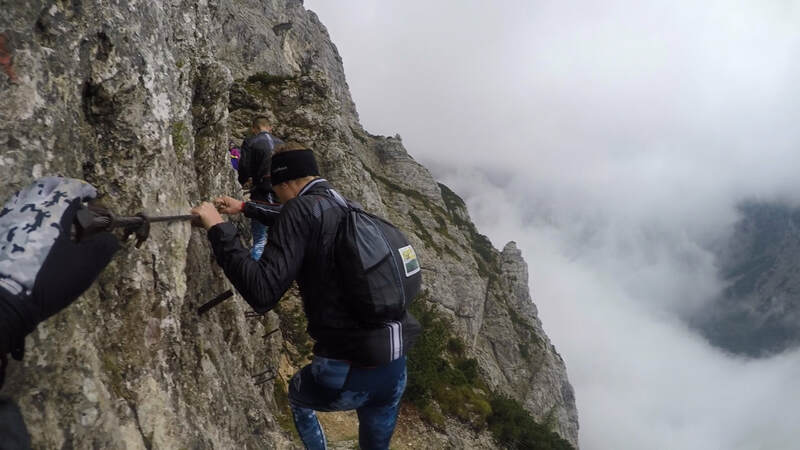 Check out the sweet video that Nathaniel Mah made from our first couple days in Ramsau. ​The skiing on the Dachstein is just under 9000 feet above sea level, much too high to try to get a quality, high-speed intervals session in. We endured another long rollerski in the rain for our intensity session before shifting the focus to easy distance training. It was the kind of session that we dreaded all day as the rain poured down with no sign of a break in the weather. But once we got our bodies warmed up and safely navigated a few corners on the rollerski track, it turned out to be not all that bad. 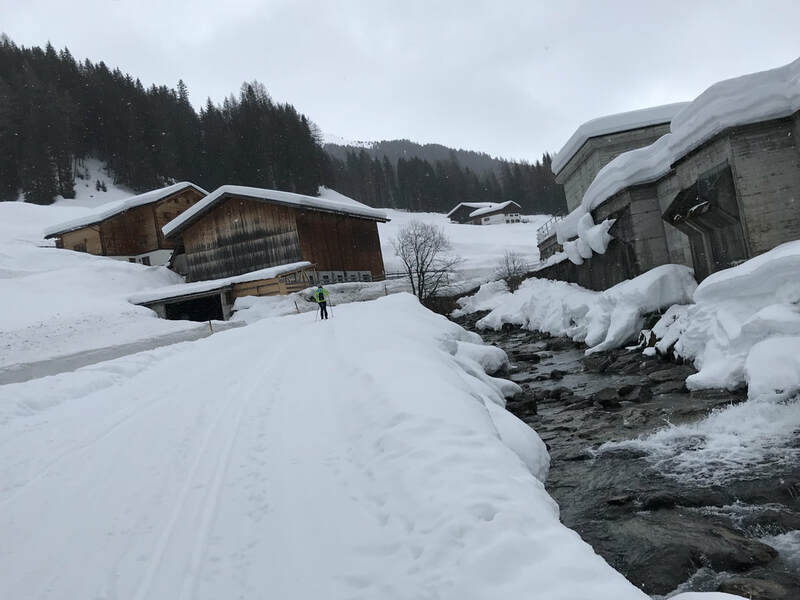 Asides from some skiing between our hotel and the track, we did our best to stay off the roads, where, believe it or not, its verboten to rollerski. 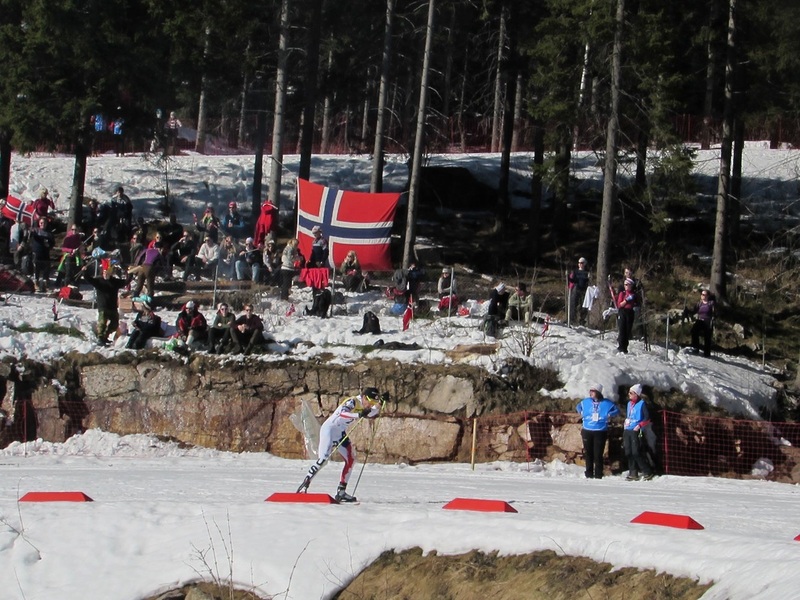 This rule always shocks me in such a Nordic mecca – proud home of the 1999 World Championships, annual World Cups and a ski marathon. I’ve been lucky so far, but apparently there’s one cop in town that send you walking home and even give out tickets if he’s particularly irritated. Fortunately, the rollerski track is one of the better ones around, as long as you don’t overcook any of the tight corners. (Knock on wood, I haven’t joined that club here either). Ben L with the Dachstein in the background. ​The upside of rain in town was that we were confident in snow up high. 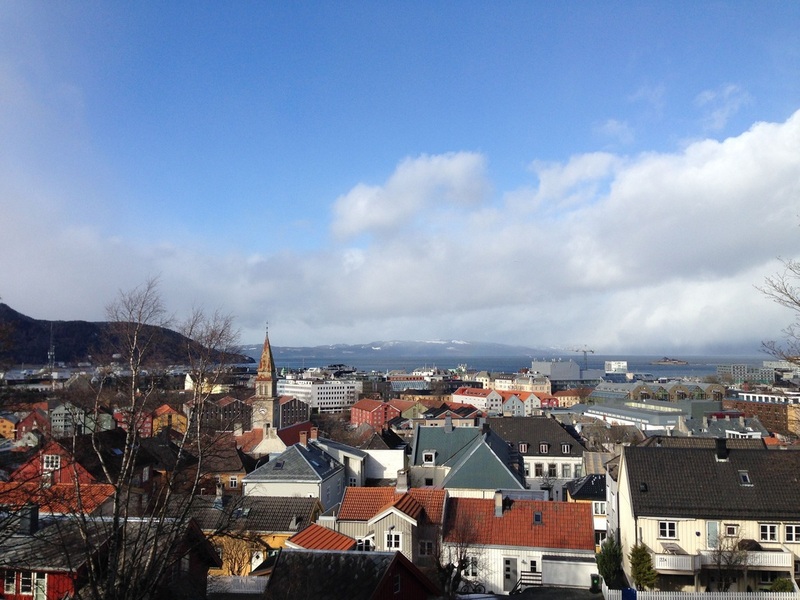 In fact, the snowline nearly reached town on Wednesday morning. The following day, when we finally stepped out of the tram at the top of the Dachstein, we met Father Winter in all his glory. It was nearly white-out conditions and so windy that I’m not sure how much snow was actually falling from the sky or just being swept around from the gusting wind. 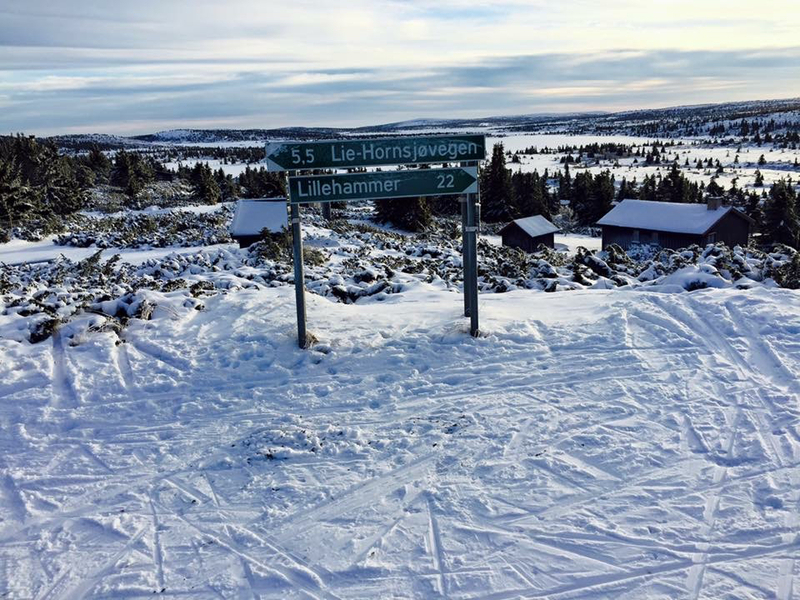 A few of us took a mistaken lap on the walking trail before finding the skiing loop. After 15 minutes of only being able to see from pole to pole, and sometimes struggling to just stay on the groomed trail, we started to wonder why no one else seemed to be out there. Then again, we couldn’t see far enough to know, so we kept on that loop before reevaluating at the start and finding the rest of the skiers. 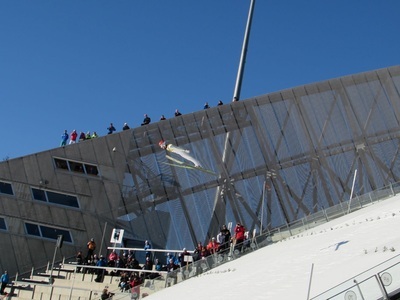 The Dachstein is a popular training grounds for cross country skiers, biathletes and Nordic combiners from all over. Other teams included a club from Thunder Bay, Estonians, Czech biathletes, Koreans, a Japanese para-athlete, and of course Austrians and ski technicians. 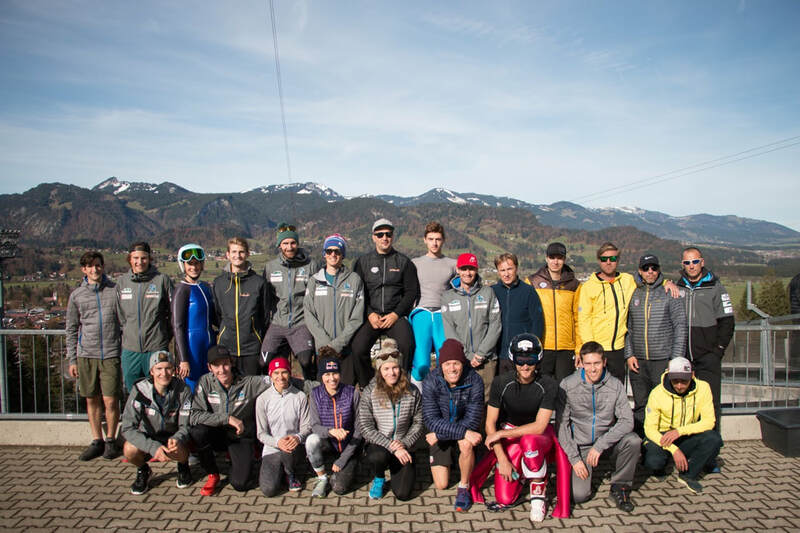 We chatted with the Canadians, who were starting a three-week training camp up there, but otherwise most people tend to stick to themselves and their training priorities. After 2 or 3 hours of skiing, we load back into a tram, mixing skiers with the German-speaking tourists who came for the views and apfelstrudel at the tram station restaurant. The weather and skiing improved each day on the Dachstein. On Friday, it’s not quite sunny, but we’re able to take in the phenomenal views and get a much better idea of our surroundings. On Saturday, we’re back to jumping in Ramsau on a beautiful shorts-and-t-shirt kind of day. 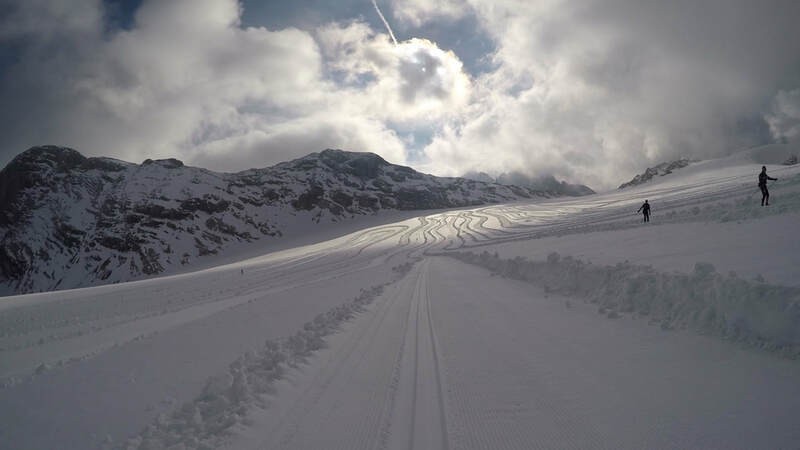 By Sunday, for our third and final ski on the glacier, there’s enough skiing groomed that I barely repeat loops for a two-hour ski. 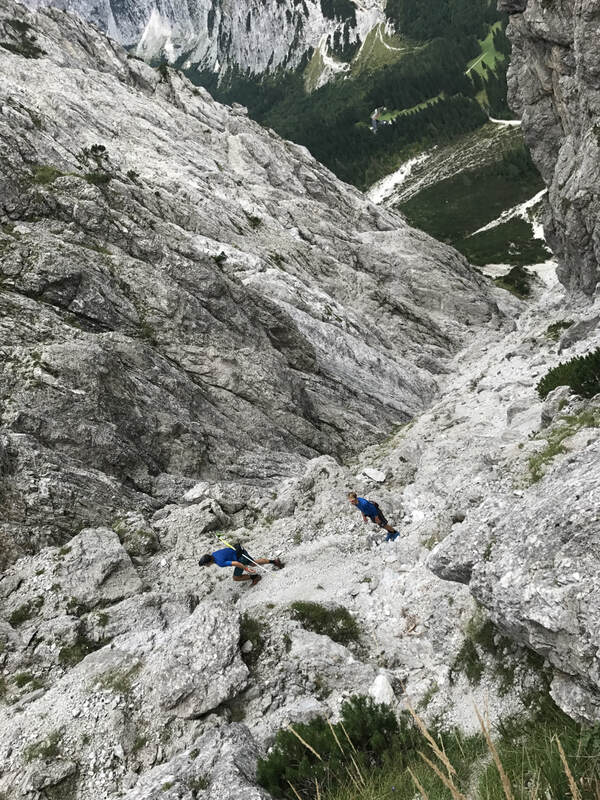 More images from the Dachstein in the slideshow below. ​To end the camp, the Fichtenheim cooks treat us with Kaiserschmarrn – fluffy, eggy pancakes, shredded and served with powdered sugar and apple sauce (literally Emperor’s mess). We ate well and trained hard all week, so I don’t feel too guilty as I finish off my plate and serve up seconds. The Austrians certainly know that there’s no better way to make a guest want to come back again than serving this up as their last meal. Now we’re already unpacked back at our apartments in Planica. We’re able to settle back in quickly and it feels just like home again. This weekend we have the final two days of Summer Grand Prix competitions. 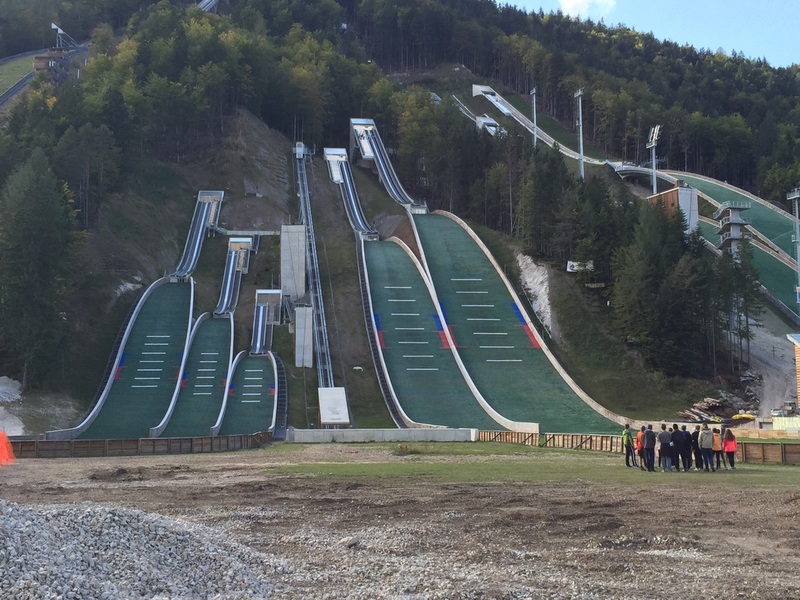 Planica is a new addition to the tour, and after a month-long break in the competitions, everyone is eager to get back at it here. Stay posted on Facebook for results and news from the competitions! Before I go, I want to share my fundraising campaign on Rally Me. I already owe a huge thank you to the incredible donors who have already supported me since I started the fundraiser just last week! I am really amazed at how quickly people have stepped in. I couldn’t do it without this community supporting me! If you’d like to help out, check out my page below. Your support will help cover some of the costs necessary to train, compete and be equipped for this season. Also, be sure to watch the super cool video that Nathaniel Mah made at the page! I’m back in Planica, Slovenia, where I last wrote from. 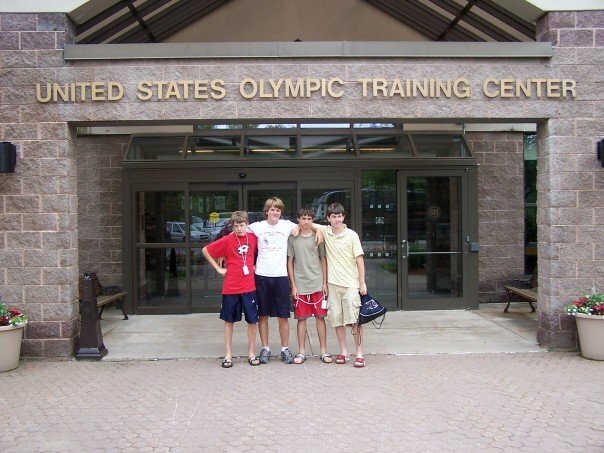 Since then, I spent some time in Stams, Austria and Oberstdorf, Germany, training and competing. 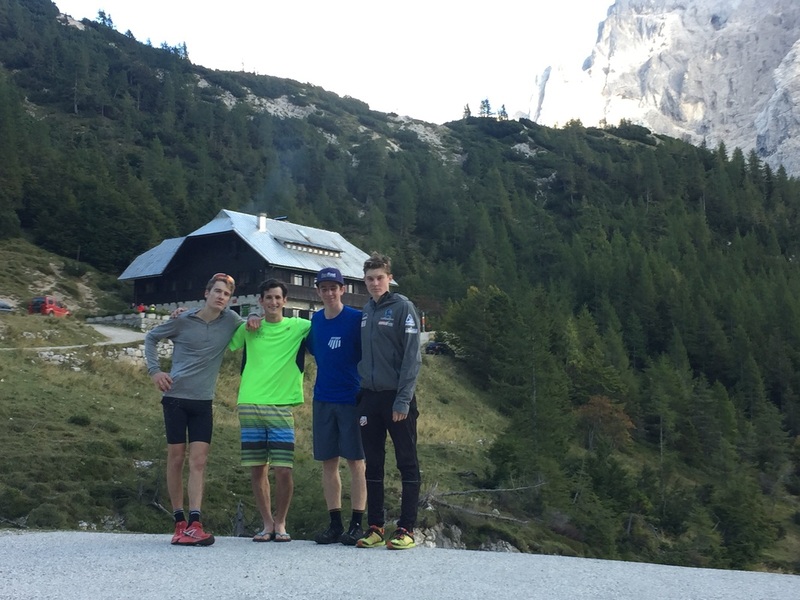 After training in Stams with the younger crew from our team – Ben Loomis, Grant Andres and Stephen Schumann – and some of the junior development athletes, I headed to Oberstdorf for a start in the Summer Grand Prix. Stams, just outside of Innbruck, is over the beautiful Fernpass from Oberstdorf, nestled in the Bavarian Alps. 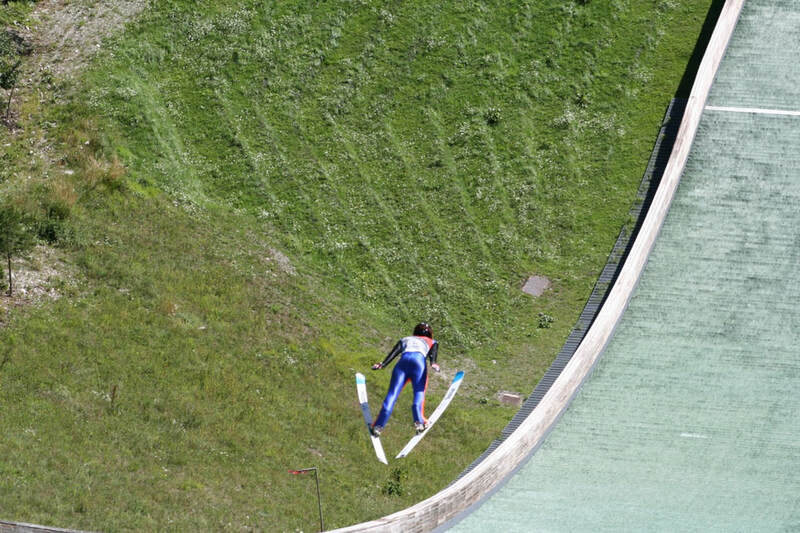 I had the unique opportunity to jump in both Austria and Germany the day before competing – training in Stams, then fore-jumping in the first day of Grand Prix in Oberstdorf. I don’t know about you, but I thought that was pretty cool. Flying in Oberstdorf. Romina Eggert Photo. 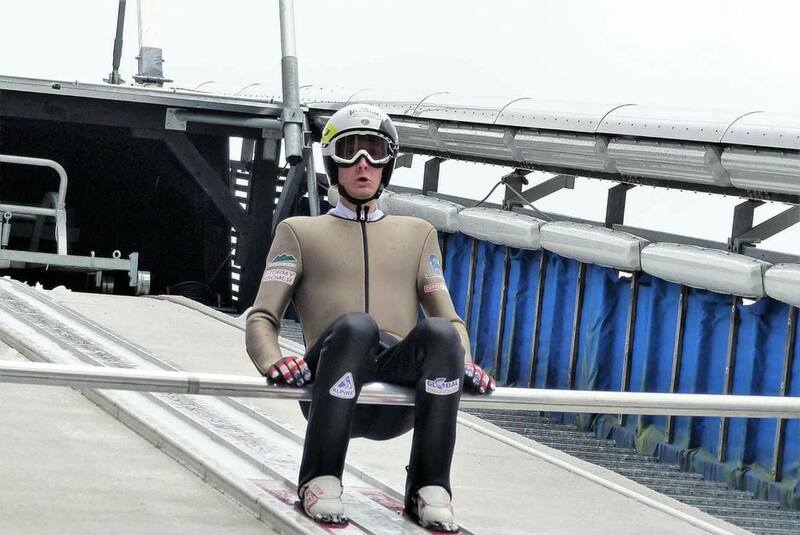 ​In Oberstdorf, I was eager to get back into the mix of competing. I put down a good enough jump in a tough jumping competition to be in the fight for points. Unfortunately, I was also the only one of my teammates to race, after Ben Berend and Taylor Fletcher were disqualified and Bryan opted to rest his irritated knee, but I used this as extra motivation to represent us well. 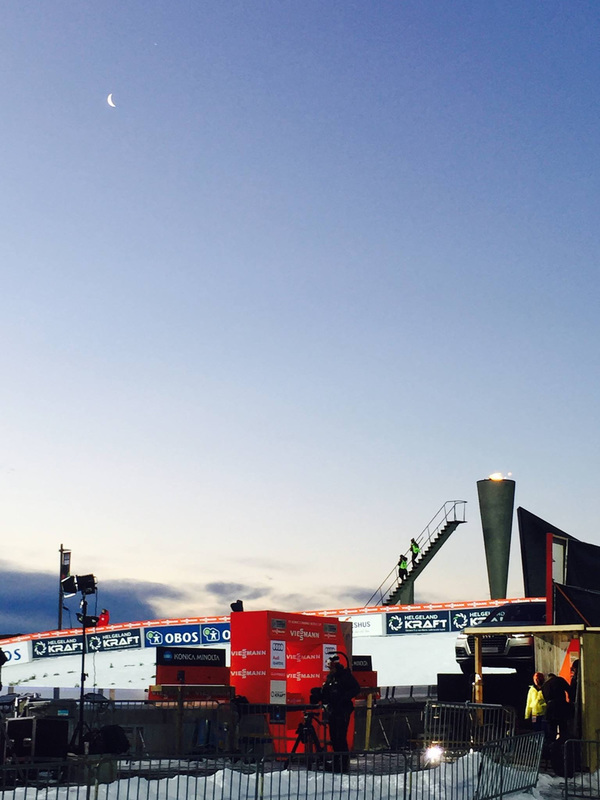 The race, which started at 8:30 pm, was an exciting 6 laps around the dark city streets below the jump stadium. Having not raced in a pack in 6 months, it was quite a shock to the system to be in a massive group of athletes fighting for points and struggling to hang on with the fastest skiers. I didn’t feel immediately comfortable in the group, and to be honest, its not my favorite race course, but I enjoyed the moment and knew I had to take advantage of the opportunity. Spurred on by a huge cheering section, I managed to finish in 28th, nabbing my first high-level points in two years. Despite all the German fans and European coaches, it almost felt like a home race with coaches, most of my teammates and a squad of juniors and Youth Cup competitors from the US cheering me on. I definitely used their excitement and encouragement to dig deeper than I could have otherwise. Night racing. Romina Eggert Photo. 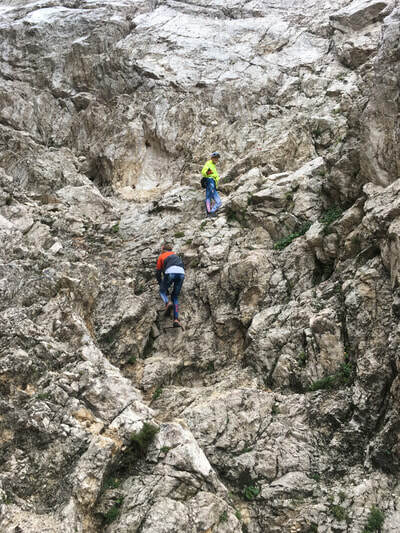 ​If you’ve been following our social media since Grand Prix, you probably think that we’re part time mountain climbers. I can assure you that we’re working hard on the jumps, in the gym and on our rollerskis, but we have taken advantage of our surroundings more than ever these past few weeks. The day after racing in Oberstdorf, we hiked the nearby Nebelhorn peak, which has a tram servicing the resort running full time. Knowing that we had a solid recovery week ahead and wanting an extra challenge, I opted to run down rather than take the tram. I wouldn’t recommend this option if you want to be able to walk normal the next few days, but now I know that it is possible to descend on foot faster than the three-part tram ride. If you didn't see it already, check out the movie I made with pictures and the fly-through from my GPS watch. 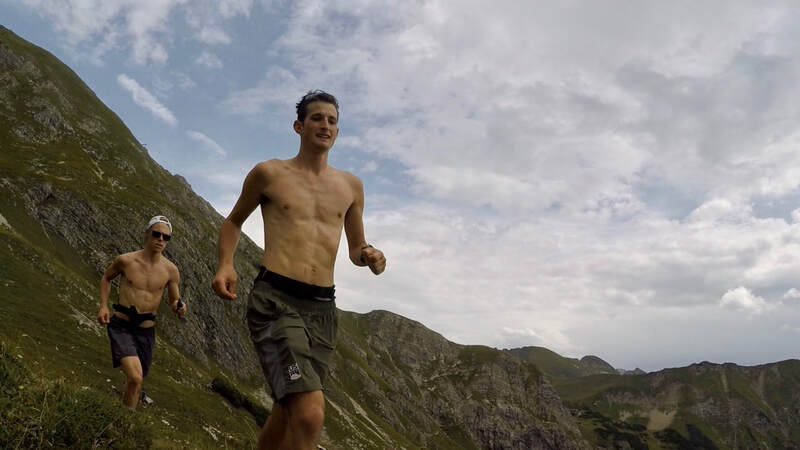 Grant and Ben running one of the flatter sections up the Nebelhorn. The Nebelhorn from Adam Loomis on Vimeo. Last weekend, my teammates Grant, Ben, Jasper and I stood atop Triglav, the tallest mountain in Slovenia. We ascended the 2000 vetical meters from the valley floor in thick fog and occasional rain and gusting winds on the final ridgeline to summit. Most of the other hikers out there were decked out with heavy rain gear, packs for overnighting in the surrounding mountain huts, and Via Ferrata safety gear. (Via ferrata equipment allows users to clip into to fixed cables along non-technical but admittedly hairy sections of the trail). On the descent, as the fog cleared and we could see the sheer cliffs falling all the way to the valley below, we understood the rational for their equipment as necessary for anyone with a moderate fear of heights. We were able to travel light, with just our small packs, knowing that there was a mountain “hut” below the summit, where we stopped to warm-up and refuel with coffee, crepes and water for our packs. After around 5.5 hours on the trail, we jogged into the trailhead where we began, feeling surprisingly fresh and immensely satisfied. 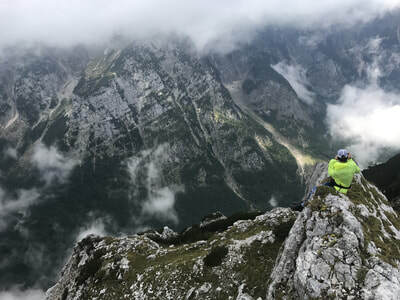 Now, we've been told that we should apply for Slovenian citizenship, as apparently summiting Triglav is what it takes to be considered a "real" Slovenian. 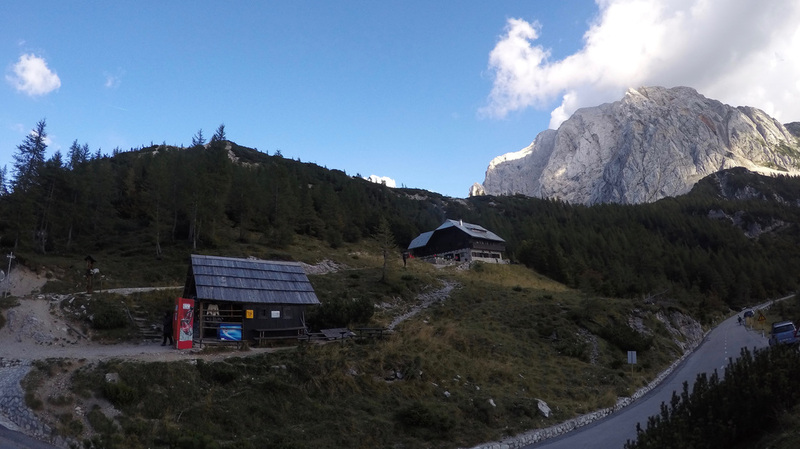 Below is a gallery from Triglav, and a video that Jasper made similar to my Nebelhorn one. ​Since last weekend, it’s been cool and raining more or less non-stop, which isn’t ideal for jumping and particularly pleasant for rollerskiing, but we really can’t complain. For one, the wreckage left by Hurricanes Harvey and Irma have provided a good dose of perspective. We're lucky to not be affected by the weather for any longer than the amount of time we spend out in it. In addition, we always have the ski tunnel here to ski in. It can be mind-numbing to spin 30 - 50 laps around the underground loop, but it’s awesome to be training on snow and a savior when its 40 degrees and raining. We also lucked out with mostly dry conditions for our grueling intensity session this week: 8 x 10 minutes intervals at steady state. In total, it takes nearly 3 hours and we covered over 47 km in this single workout. Our coach was there to test our blood lactates with a portable machine, and each test gave us the "good" news that we could keep pushing harder, as we were still within our zone. 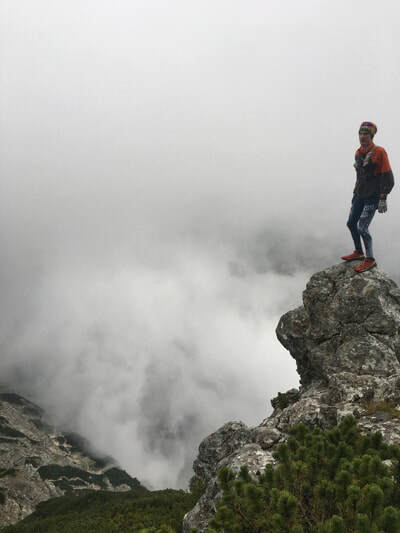 Despite popular belief, training at low elevation isn't necessarily easier, as we are just able to push harder with the increased oxygen density. I’ve been working hard on the jumps, knowing that this is where my biggest improvements can be made. 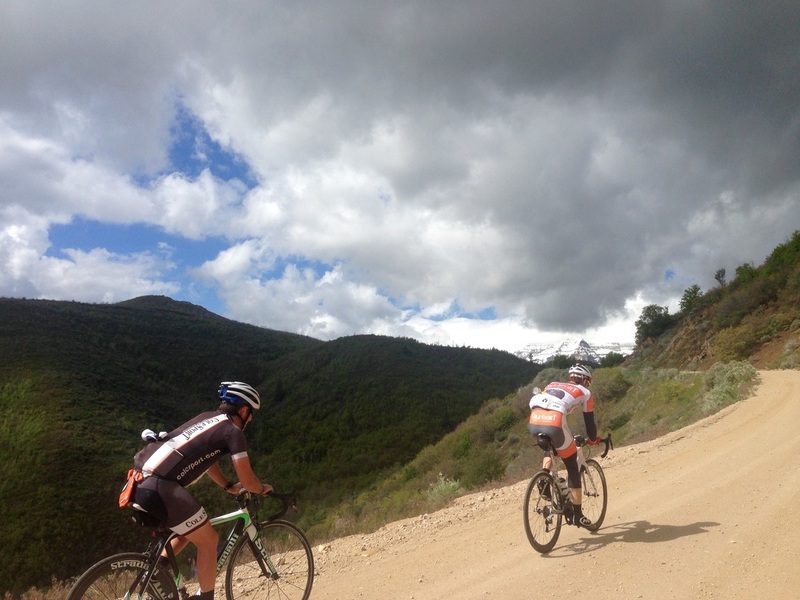 All of our team is making great strides on the hills here. 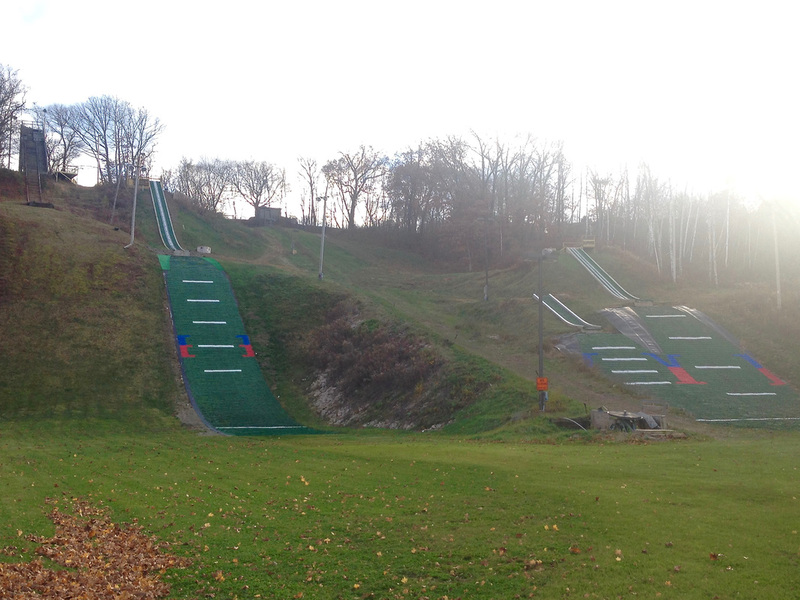 Ultimately, the best part about training in Slovenia is the jump facilities. It’s really important for us to jump on modern, low-elevation hills in Europe, and to get on a variety of different jumps. 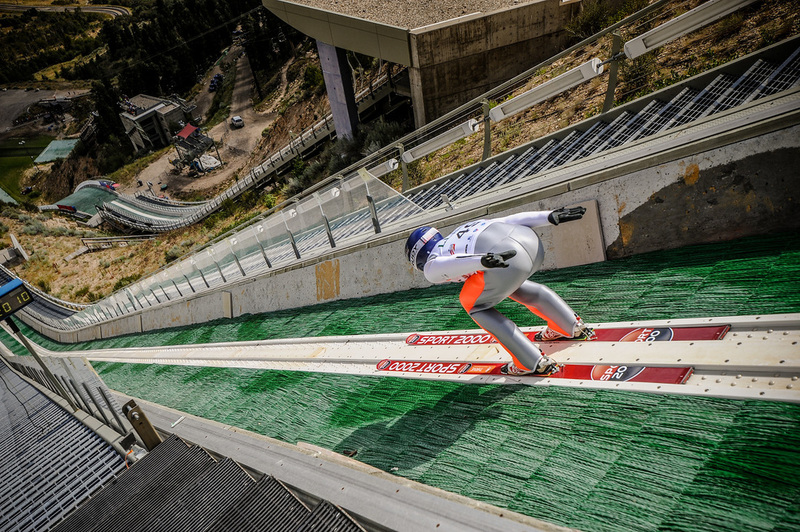 That’s really the only way to get prepared for the World Cup tour where you compete on a new hill every weekend. ​Here’s a quick video I made of jumping in Kranj and Planica with my GoPro a couple weeks ago. Thanks for all the support that allows me to be here. Next week, we'll go to Ramsau, Austria, to jump at two different venues and ski on the Dachstein glacier. Stay tuned for updates, and in the coming days you might be hearing from me asking for your support. Thank you for being a part of the team! Jasper, the king of Kranjska Gora for a moment. I finally had a spare moment to sit down and write yesterday. Not to say that I haven’t had a chance to post an update in the many months since I’ve been on here, but it hasn’t been a real priority in a while. Today, the greater struggle is bouncing from cafe to cafe searching for a wifi connection that is strong enough to put a post together. More than ever, this summer flew by. 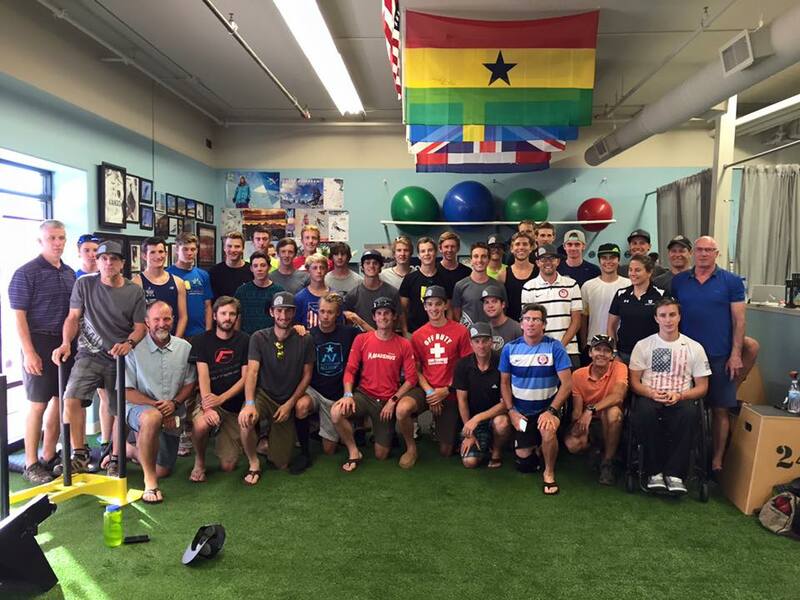 It was broken up nicely by periodic trips and camps: Moab for a “Mental Conditioning Camp” with all of USA Nordic, on-snow time in Bend, OR in late May, Steamboat for a week over the Fourth, and the annual Springer Tournee right before coming over here. Between training, DeVry courses, working at Adolph’s Restaurant and the occasional catering gig, I don’t get much for downtime when I’m in the US. Which is fine – boredom would kill me. Now that we’re in Europe for a lengthy camp, life is less hectic. Grocery store runs are the extent of errands to be run. The time between morning and evening training sessions is spent with our feet up, “recovering hard,” exactly as athletes should. The Team! 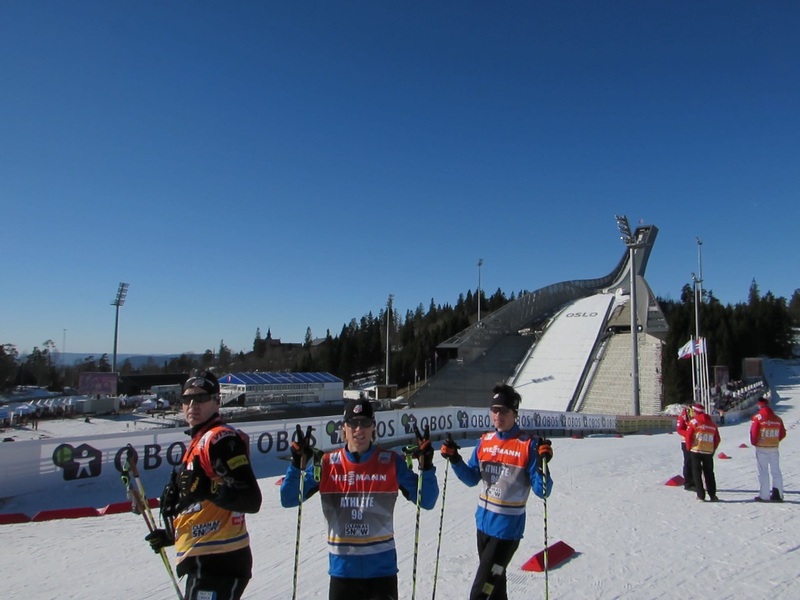 USA Nordic's Nordic Combined National and Junior National Team Members together in Planica. Along with the rest of my team, I’ve been at our Euro-training base since flying over a week ago. We’re not in the same apartments that we rented for two months last fall and some of us last winter, but it still always feels like we’re kind of home here in Planica, Slovenia. For the time being, we fix our own breakfast and lunches in the team apartment, and then have (surprisingly great) dinners cooked for us in the hotel every night. When we move back into our usual apartments, we’ll be cooking all our own meals, which actually makes the stay more enjoyable and homey in many ways. Grocery shopping is a different experience here than in the US – small stores, extremely reasonable prices, no need to pay more to get “the good eggs," lunchmeat that probably isn't cancerous, fresh bread (that doesn’t stay fresh for a week), quality muesli and surprisingly good produce. 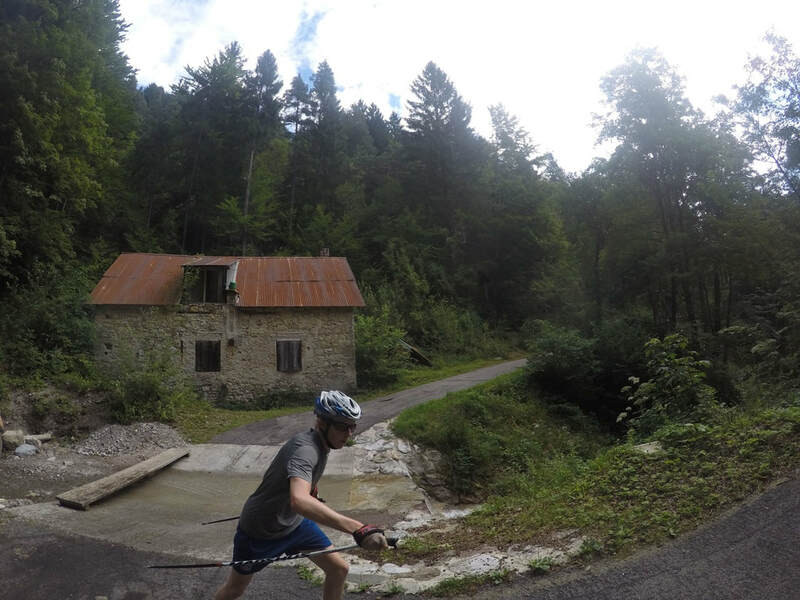 Rollerskiing along an Italian River on Day 2. Predil Lake, in Italy, a prime spot to spot a workout. The Junior National Team joined us on Thursday, after arriving from a week of training in Austria. We’ve been doing most of our sessions with them since, meaning we have a big rad crew out turning heads in Slovenia. Yesterday we drove over a pass in our vans and had our coaches drop us off for a point-to-point double pole rollerski. 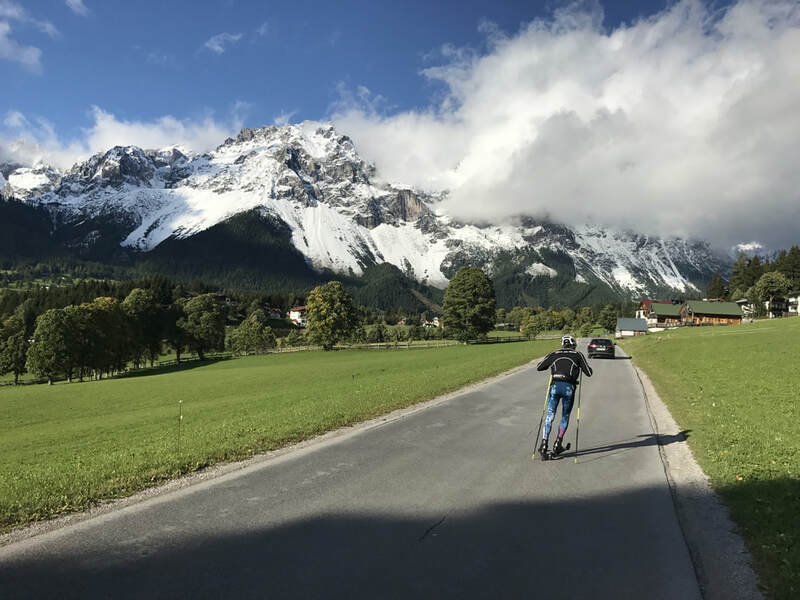 The ski back was almost 35km, virtually all on bike path, first in Austria, then through Italy, and eventually into Slovenia. 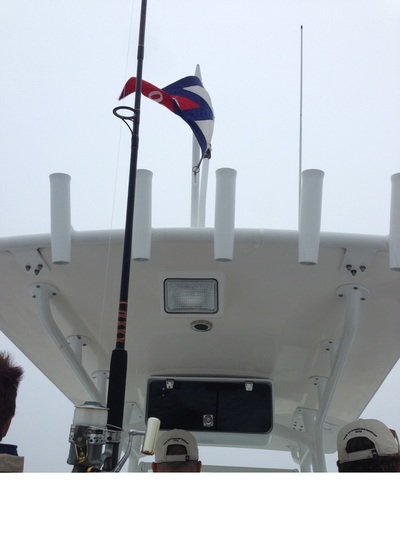 One broken pole amongst the juniors – but otherwise no complaints on a training session like that. 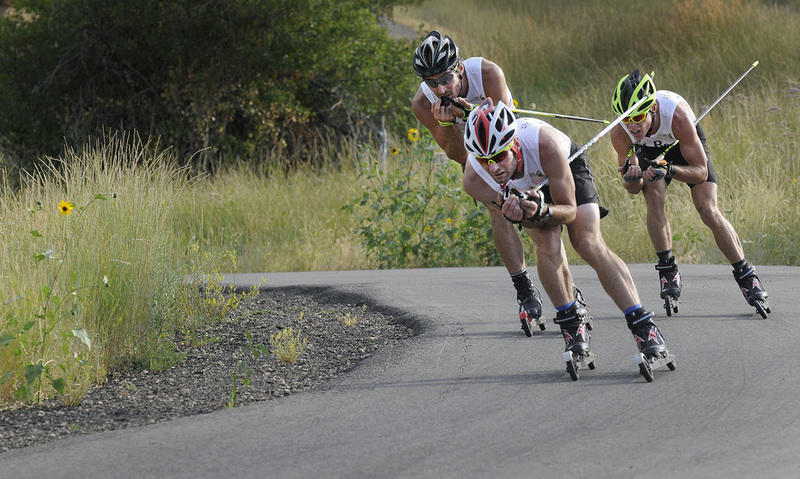 At the start of yesterday's tri-country rollerski. Refueling in Tarviso, IT, the border town down the road from us in Slovenia. Aidan Ripp (Cloquet, MN) navigating a tough corner with a broken pole. 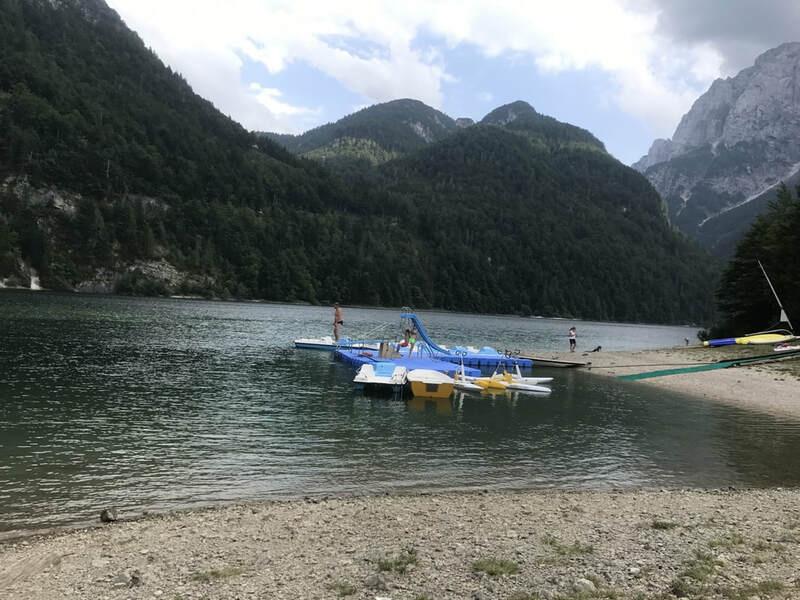 Sunday was our off day, and although we still jumped, we spent most of the day lounging at a nearby lake just outside of Kranjska Gora. Besides jumping into the freezing cold water, it was luxuriously relaxing. I realized that I probably spent more time reading and laying on the beach in that afternoon than I did all of my entire time in Hawaii this spring. On Saturday we held an inter-squad competition to determine who would be heading to Germany for the start of our Summer Grand Prix circuit. Since starting the summer season off in good form I’ve been struggling more on the jump hill over the past weeks. I’ve made improvements since coming over here, but still put myself at a pretty tough disadvantage to start Saturday’s 10km race. Much of the race played out in front of me on the tight and technical 2km rollerski track. After overtaking Ben Berend, who led the jumping, the Fletcher brothers established a clear lead. Farther back, I moved from past Grant and Stephen and the fight for fourth was on between Jasper and I. Jasper skied really strong for the third and fourth laps, and on the following and final lap, I was only able to cross the line in fifth, six seconds behind Jasper. All-in-all, it was a good day for the team; we all threw down huge improvements over our times on the same course last fall. Taylor set our course record by nearly a minute and a half, and I improved by over two minutes. We’ve been putting a big emphasis on maintaining V2 technique in our training so far this summer, and it looks like it’s going to pay off. Below are some pictures from training and the race. Most of them are from Ben, who's unfortunately not back to jumping after a broken collarbone in early July. 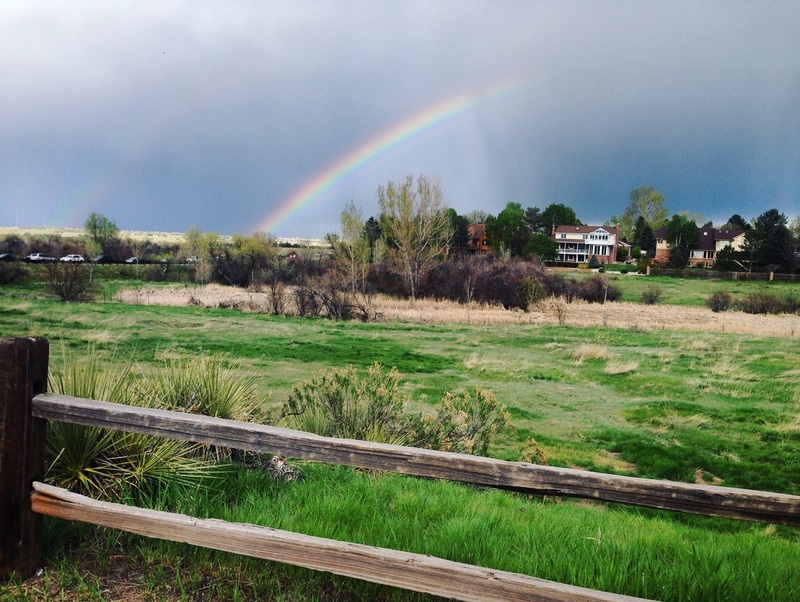 Later after the race, I reinvigorated with a quick evening recovery run that turned into a bit of an adventure – just the sort of thing that I thrive off. 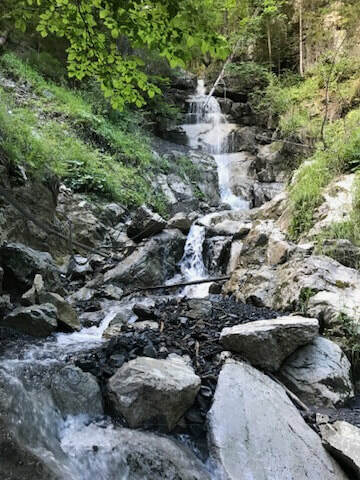 I left the dirt road that I was on in favor of a stream bed, and before I knew it I was hopping from rock to rock, then scrambling up sections of waterfall in the middle of the stream. I could have spent that hour running on a flat path, but honestly I think this sort of workout from time-to-time makes me a better athlete – and at the least a happier person. 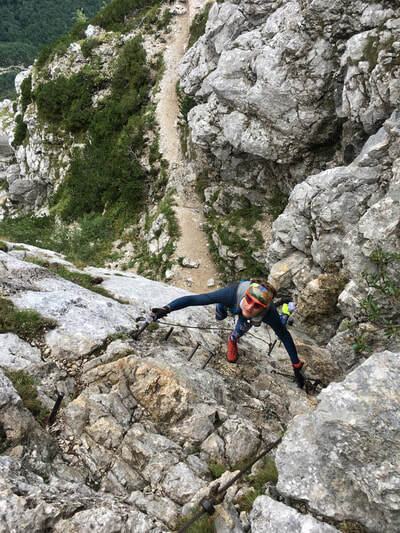 At the top of the "trail"
The results of Saturday’s competition mean that I won’t be starting in the Grand Prix in Oberweisenthal, Germany or Tschagguns, Austria. But because of how close we were, I’ll most likely be in for following events in Oberstdorf, Germany on August 25th and 26th. I’ll be excited to see how my teammates do in the first events, and in the meantime the rest of the team will be getting great training in. 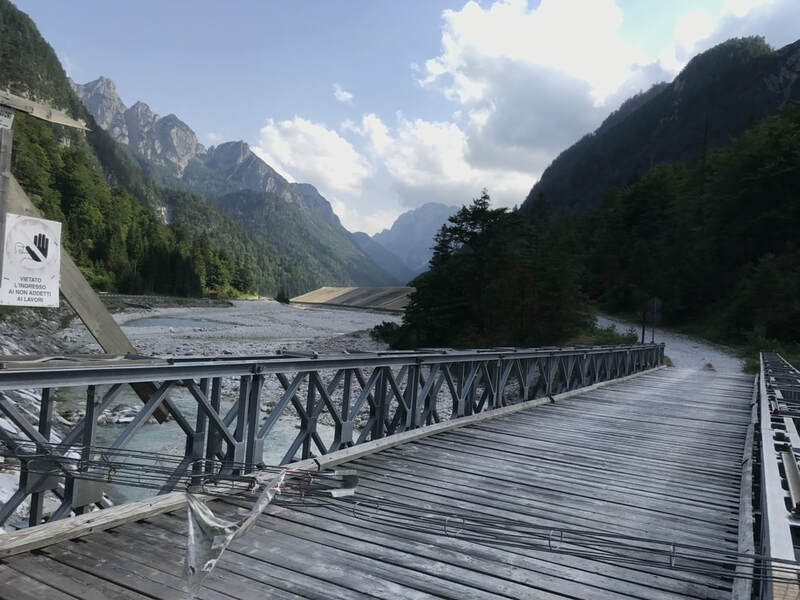 Grant, Stephen, Ben (Loomis) and myself will stay here in Planica until next Monday, then head to Stamms, AUT, just outside of Innbruck, for a few days before Oberstdorf. 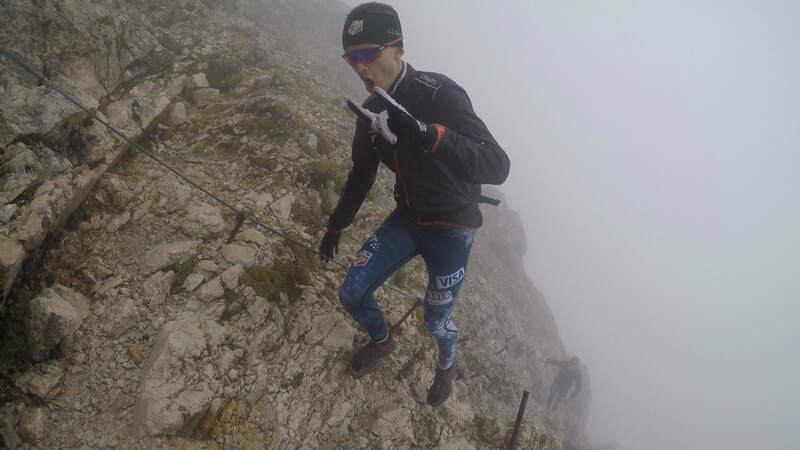 We’ll continue training with the Junior team, under newly appointed coach Tomas Matura – formerly our COC wax tech and generally awesome dude from the Czech Republic. Note: I wrote this post to appear on USANordic.org. 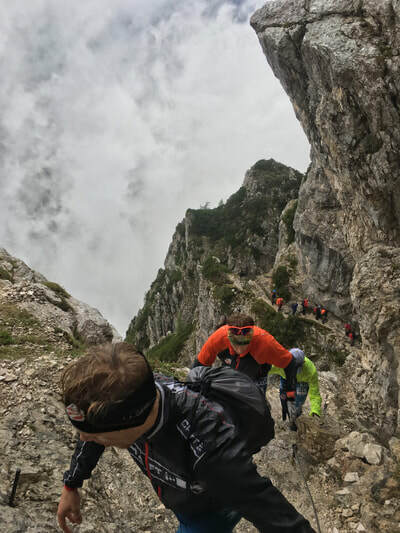 In it, I outline our great fall of training in Slovenia, Austria and Germany. 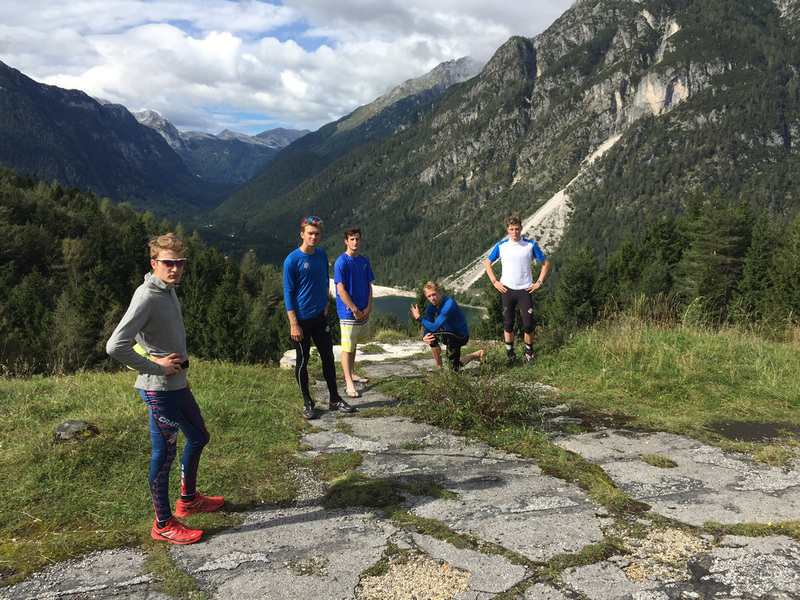 Summer competitions ended way back in early September for the USA Nordic Combined Team, after the fast and furious 8-day Summer Grand Prix tour. Since then, no one has rested on their laurels; we’ve been busy putting in the work to make this winter a success. 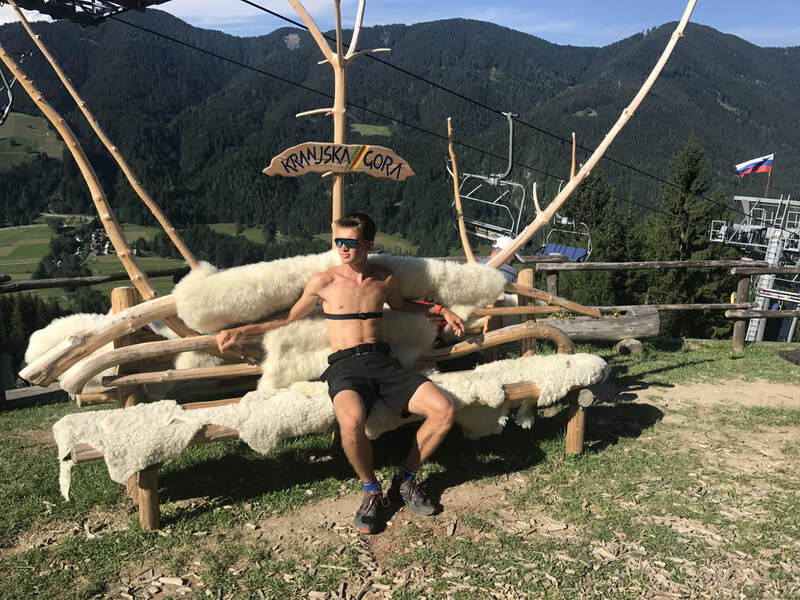 This summer, we decided to spend much more time overseas, where we could train amongst other athletes and on many of the venues that we compete at in the wintertime. We rented an apartment in Planica, Slovenia, which we made our home-base for a month and a half. Early into the trip, I made the following video highlighting some of our training. Check it out! PLANICA SEPTEMBER 16 from Adam Loomis on Vimeo. From left, me, Jasper, Grant, Koby, and Ben. We were all in Europe for the duration of the camp. 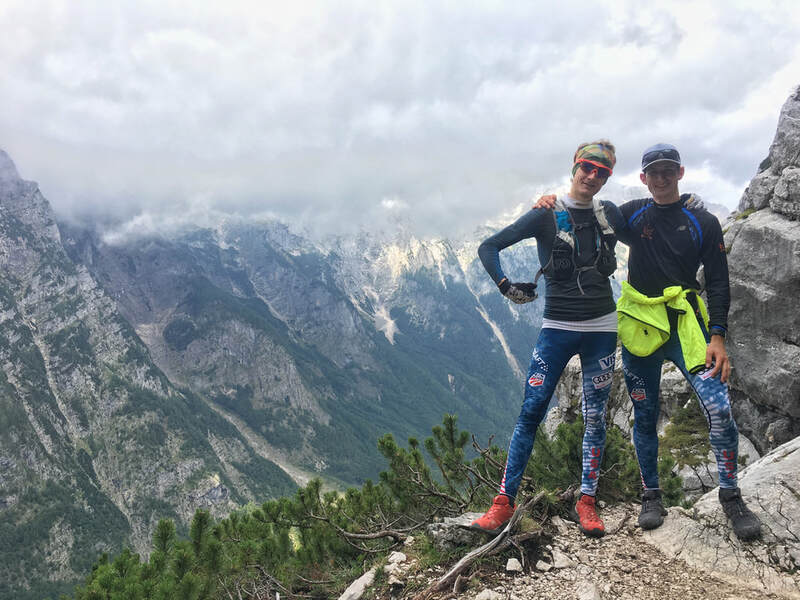 From our home in Planica, we lived as total athletes: training twice a-day, cooking nutritious meals for ourselves and enjoying the abundant opportunities for training nearby. At the complex in Planica, just up the road from our apartment, we jumped on a HS105m and HS138m. 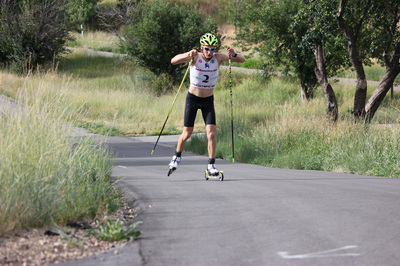 The venue also has a hilly and technical 2km rollerski loop, which we skied countless times in intervals and two test competitions. Next to the track, we also got on snow every week at the newly built indoor ski tunnel. 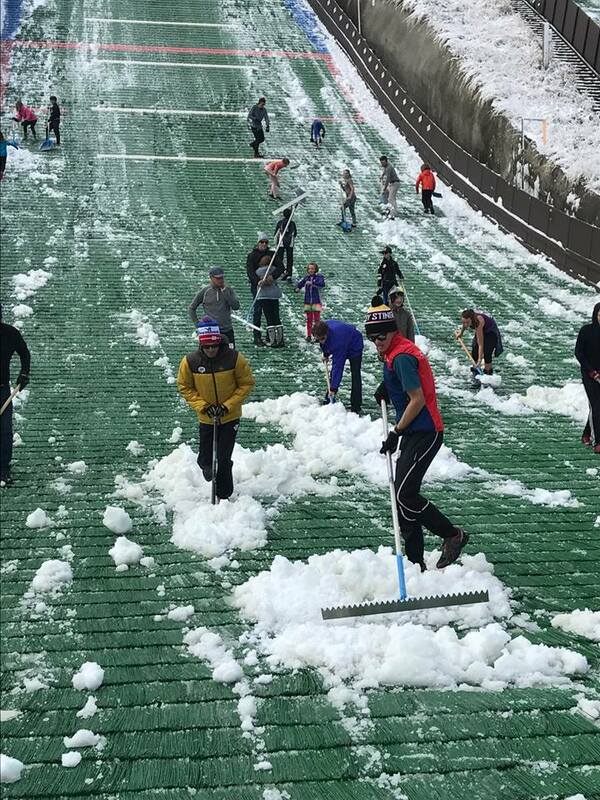 This was an awesome opportunity to get snow training in during the summer – something that we usually can’t do until it snows in November in Park City. 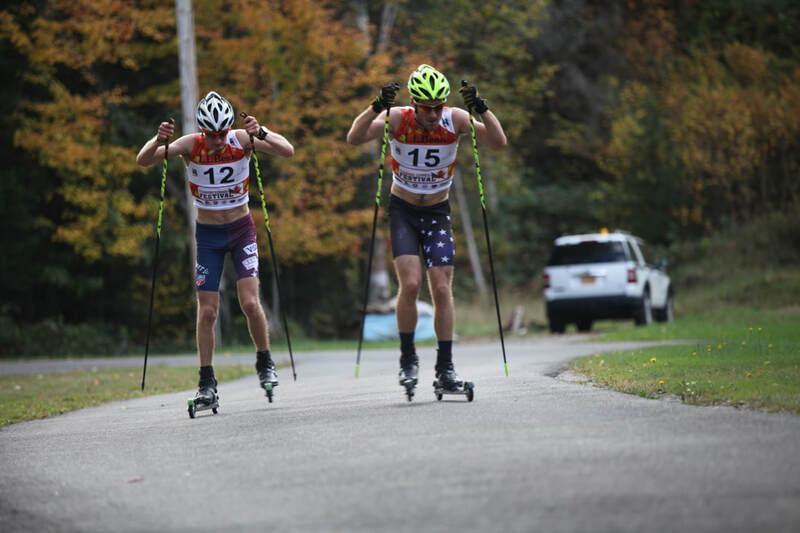 Rollerskiing is pretty close, but there’s no way to replicate the real deal without actually being on snow. Bryan Fletcher also spent most of the summer at home – for a good reason – the birth of his first daughter with his wife Nikki! Ellery Fletcher was born happy and healthy on August 29. Taylor also flew home for a couple weeks after SGP to visit his new niece. 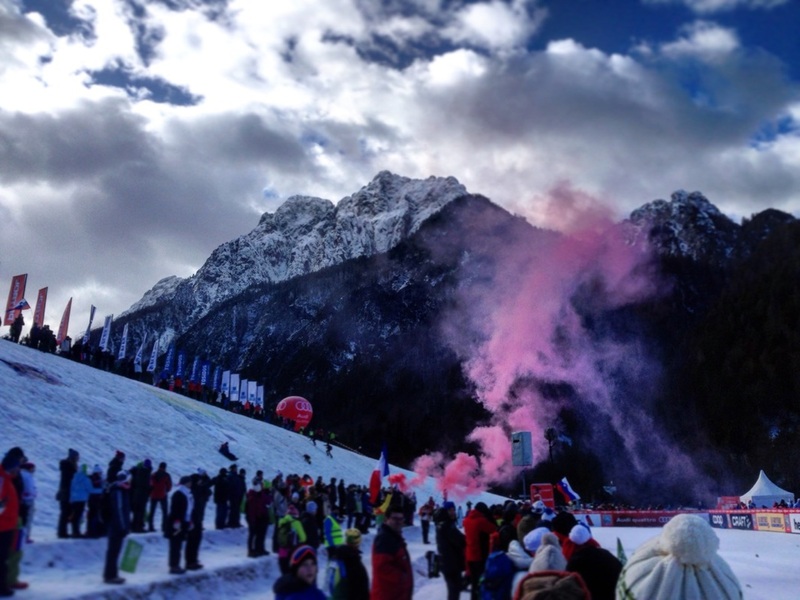 From Planica, we were able to take a few trips to other venues. 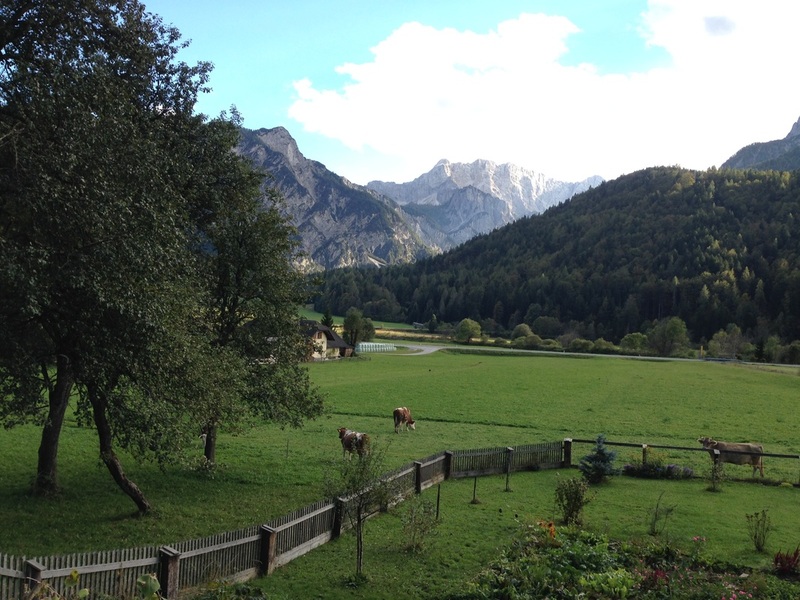 After Taylor came back over, we headed to Ramsau, Austria in late September. 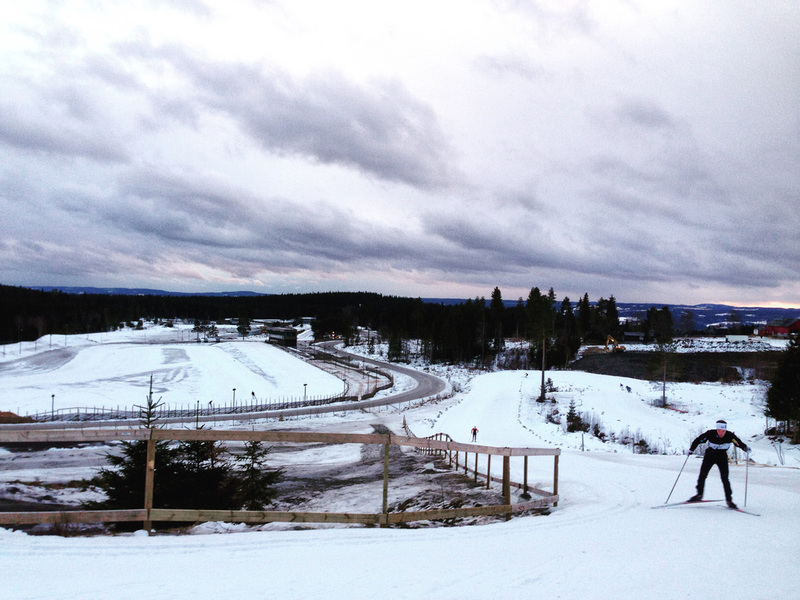 It was great to practice on this hill, where we have a World Cup every December. We also jumped on the large hill in nearby Bischofschofen, and Grant Andrews and Ben Berend both set personal records in one morning! Beckett Ledger, a promising junior from Lake Placid, was also with us for this time. He missed out on the junior camp in August due to a broken toe, but was able to train with us for two weeks – and jump on 5 different hills in this time! 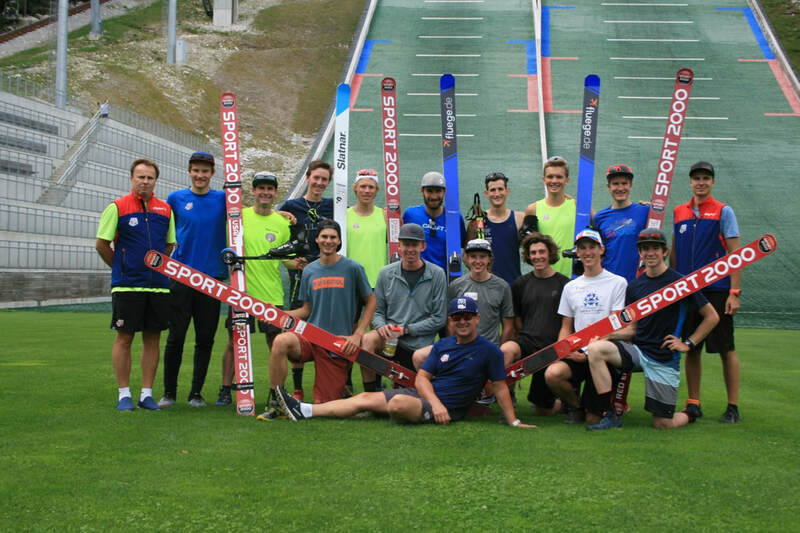 We finished off the training block with a great jumping camp in Oberstdorf, Germany, with the entire team fully united for the first time since August. Bryan, our experienced veteran, flew over to join us, and on the jump hill we could tell that he’s been working just as hard as the rest of us! We all traveled back home on October 20th. Now we countdown the days until winter! 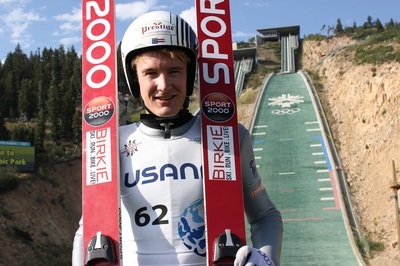 Bryan, Taylor and Ben Berend will start the season at the World Cup in Ruka, Finland on November 24th. 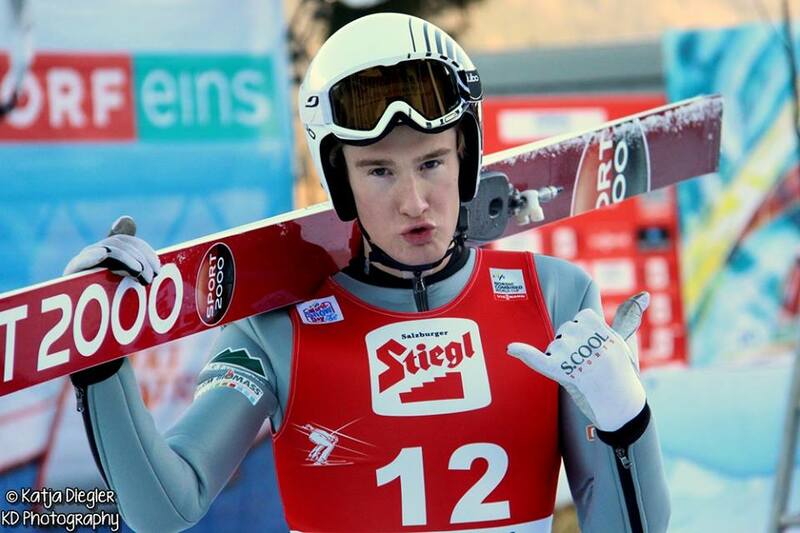 In December, the entire team will be competing internationally, either in Klingenthal, Germany at the Continental Cup or at the World Cup in Ramsau. Before you go, here are a few pictures and videos from our training. Navigating cobblestone corners on Vršič Pass from Adam Loomis on Vimeo. 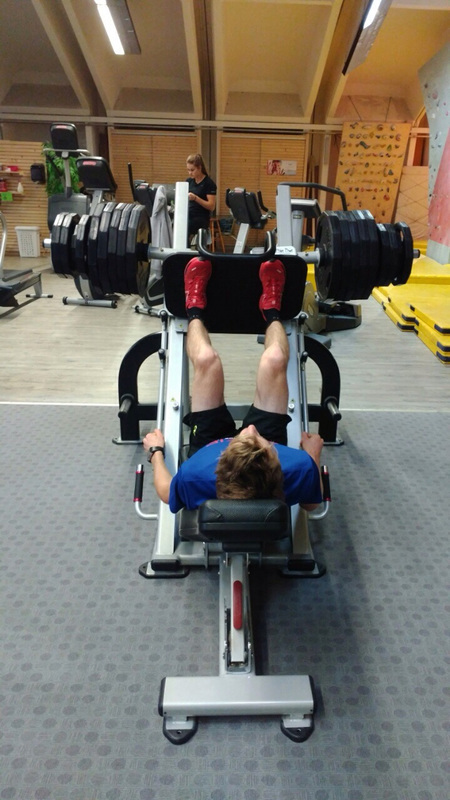 Max strength training in Oberstdorf. 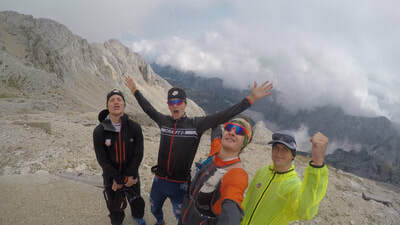 From right: Kobe, Beckett, Grant and I at the top of the Vrisc Pass in Slovenia. Grant, hiking the famous Planica ski flying hill. Loops on loops in the ski tunnel! The pastoral and beautiful Ratece, our home for the fall. Jumping with the crew in Oberweisenthal. This isn't the first time I've said this... but sure enough I've been too busy to blog as much as I should and I'm off on another exciting Europe trip. Bryan, Taylor and Ben, the front pack at our Championships. A crowd starting to fill in before Springer Tournee. 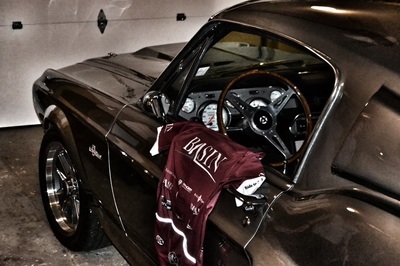 Ben getting the measurements checked on his new suit before Nationals. A cool shot of Bryan from Tyler Tate. 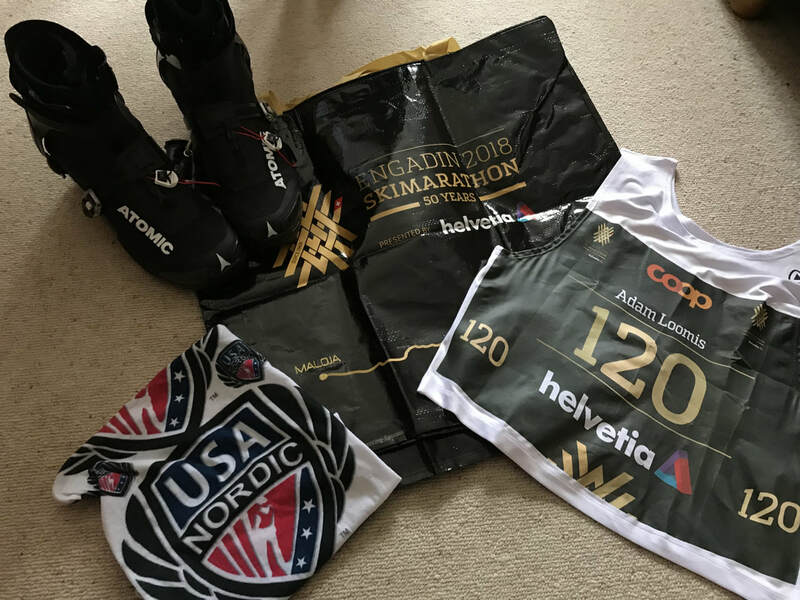 In July I finalized a new sponsorship with the American Birkebeiner. 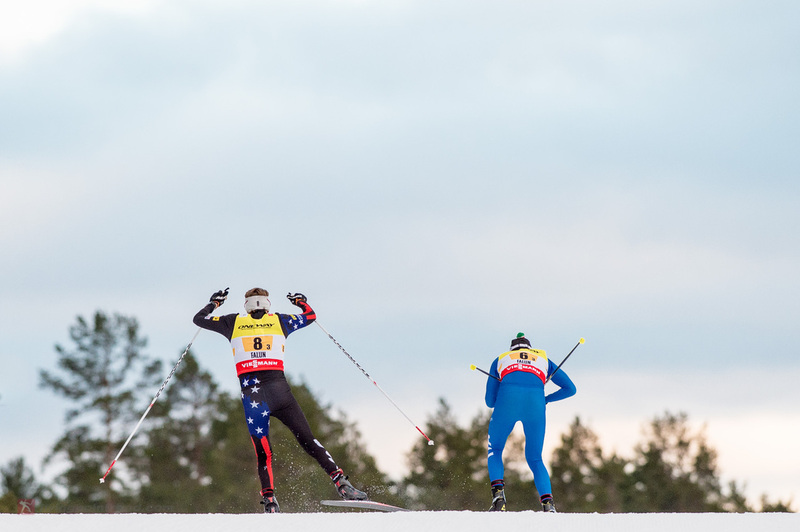 I'm proud to represent the "Birkie" - the race and driving force that inspires Nordic skiers from the Midwest and around the Nation. As you can see, they're my ski top sponsor. Still looking for a head sponsor for the coming winter! After Nationals, we had a week of jumping focus with both coaches Martin Bayer and Nik Huber in town. I really like working hard on jumping right after a competition week, probably because I feel more relaxed but just as motivated. After that, we dove into our third intensity week of the year. These weeks are tough! Two-a-day interval sessions, at least one time trial and hopefully enough recovery to maximize the training effect. In my case, I think I pushed a little too hard, or came in under-recovered, because I came down with a bit of a cold towards the end of the week. Better now that later - but definitely a sign of needing some good recovery. 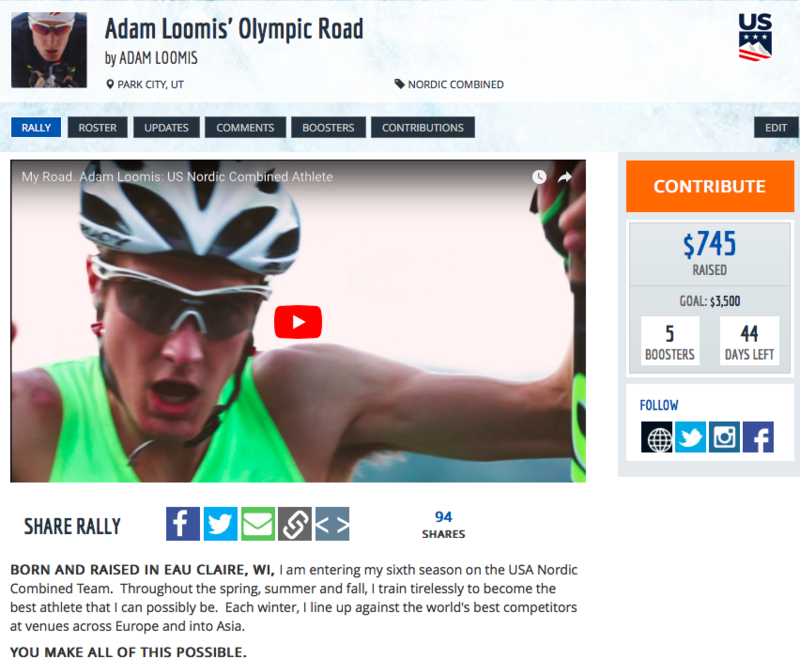 Soldier Hollow TT- Top of Hermod's Hill from Adam Loomis on Vimeo. As I write this I'm in Oberweisenthal in Germany preparing for the Summer Grand Prix competitions. 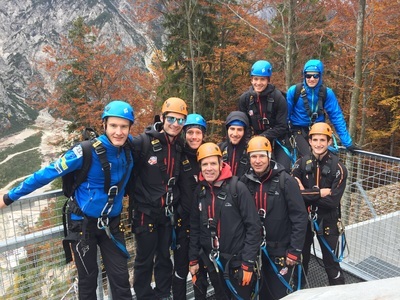 After flying over on the weekend, we met up with the junior team, which has been over here training in Slovenia, Austria and Germany for the past three weeks. This weekend we have a team sprint and an individual, so six of us will get starts in the SGP. Then we'll head to Villach, AUT for a midweek competition, and then we'll finish with two more competitions in Oberstdorf, GER. Stay tuned and look for our results coming up. We're working hard and should be ready to compete strongly this weekend. SGP is always a great opportunity to check our level before we head into the fall. 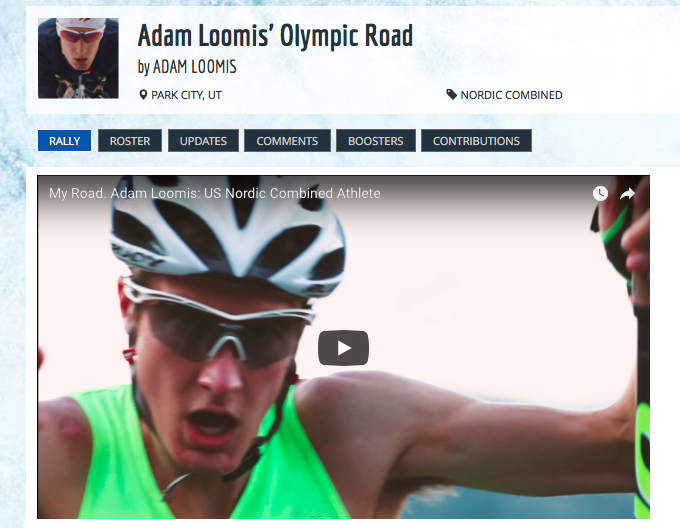 Rollerski Sprint Training in Oberweisenthal from Adam Loomis on Vimeo. Slo Mo Immo from Adam Loomis on Vimeo. 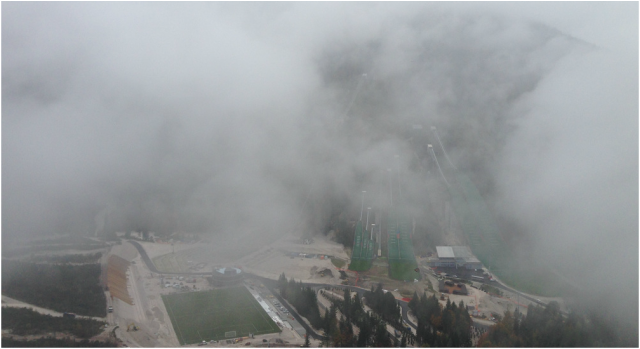 After SGP, I'll be staying in Planica, Slovenia with most of the team. Jasper, Ben and I are staying overseas until October 19. It'll be the longest I've ever been in Europe in the summer, and an awesome opportunity to get great, focused and consistent training in. We sent out a newsletter last Friday highlighting recent updates, which is available here. We'll keep those coming about every two weeks from here on out. If you're not on it, you can sign up right here on the form below. This weekend marked the end of my internship in Denver, Colorado. Basin Holdings, one of our team sponsors, offered the opportunity to our team this spring. I was immediately interested and jumped on the chance to try something new and gain some experience in the workforce. It was an interesting and fulfilling six weeks– and certainly all new to me. I worked for WB Supply, an oilfield supply company and one of the many firms that make up Basin. It’s nothing glamourous, and in theory a relatively simple business. WB is the middle-man from the manufacturer to the corporations doing the drilling and pumping. However, it’s a highly competitive industry. In the current market especially, it takes a tightly run ship to stay afloat. WB Supply is approaching 45 years in the industry, so they are clearly doing something right to have steadily grown through countless booms and busts. ​I spent most of the first week of the internship up at one of their supply stores in Fort Morgan, which is a small, rural town northwest of Denver. From there, I gained an appreciation of the operations at a grounds level. The rest of the internship was at the office in Denver, where I created a couple of big reports and presentations, as well as helping with day-to-day issues with invoices, pricing, etc. As much as I learned from actual application, I also gained a lot from listening in and observing. The general principles that enable success in this business carry over to any industry. I saw much of the success coming from strong relationships – between WB and its vendors and customers, and also within the company. The president of WB works at the Denver office, and she told me how she worked her way through virtually every part of the company. She understands the situation far better than someone sitting in an office hundreds of miles away might otherwise. The macro takeaway for me was that in any environment, the more that you can see from all perspectives, the better off you’ll be. Downtown Denver. We moved into the city during my last week of the internship. ​I didn’t slack from my training during this time either. My weekdays were always busy, starting with a strength or plyometric session in the gym at my apartment complex. In the evenings, I would run, rollerski or ride on the considerable network of bike paths throughout the city. 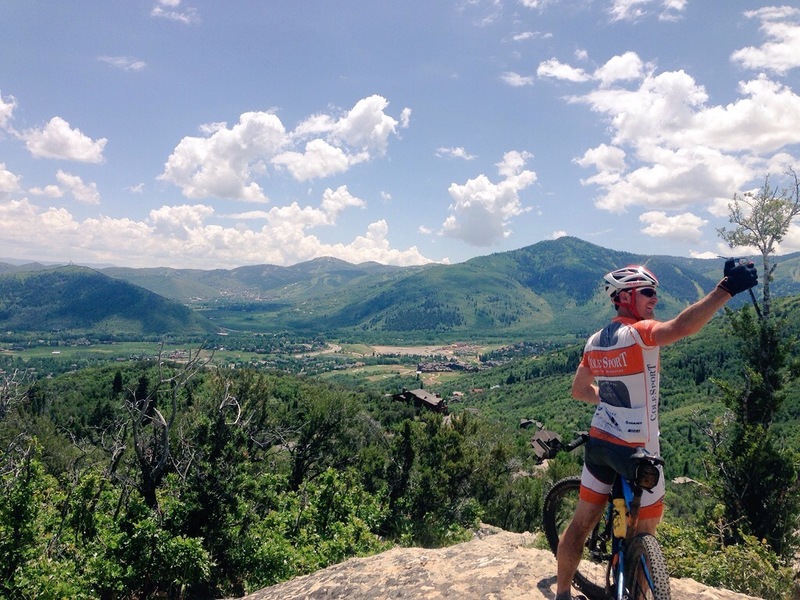 I found plenty of places to train, although pounding the pavement through suburbs and the city sure made me appreciate the luxury of living right against world class mountain trails in Park City. On the weekends, I headed for the mountains of Golden and Boulder, where I found plenty of trails and mountain passes to explore. 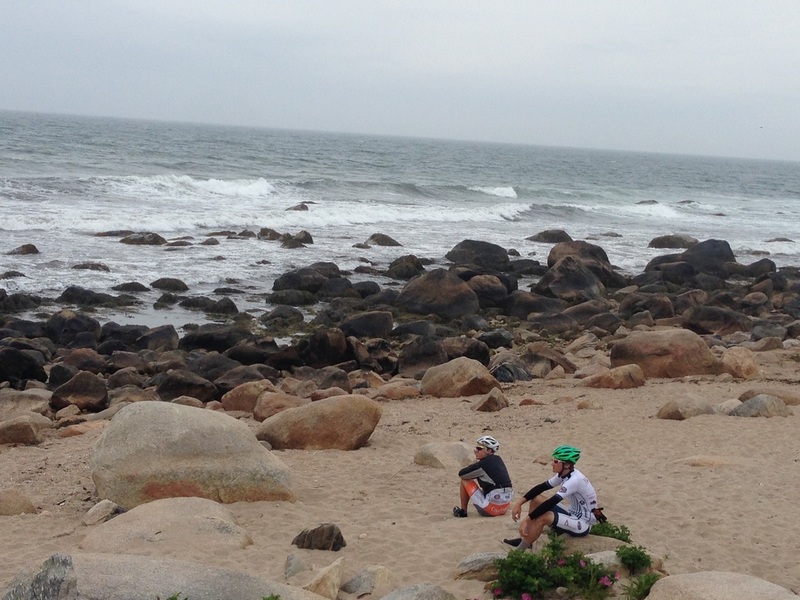 Finding new places certainly helps make up for the monotony of training alone. 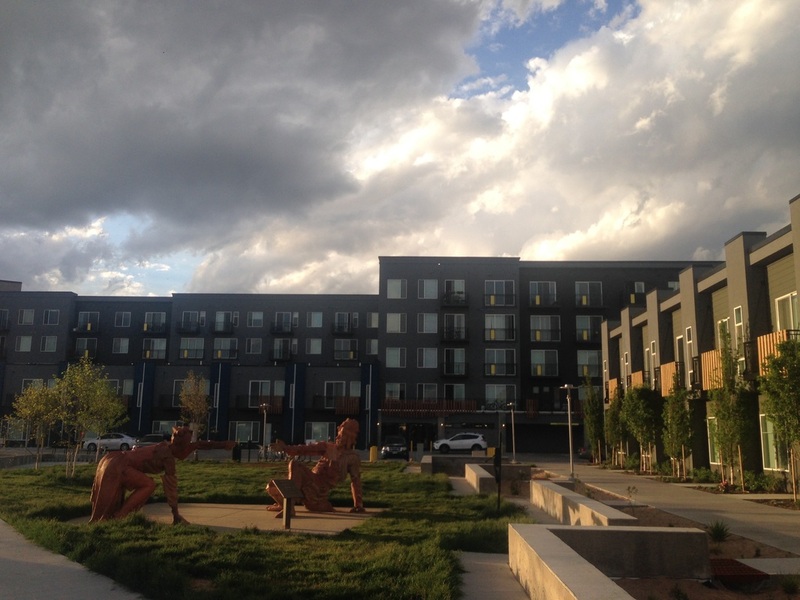 The apartment complex where I stayed. 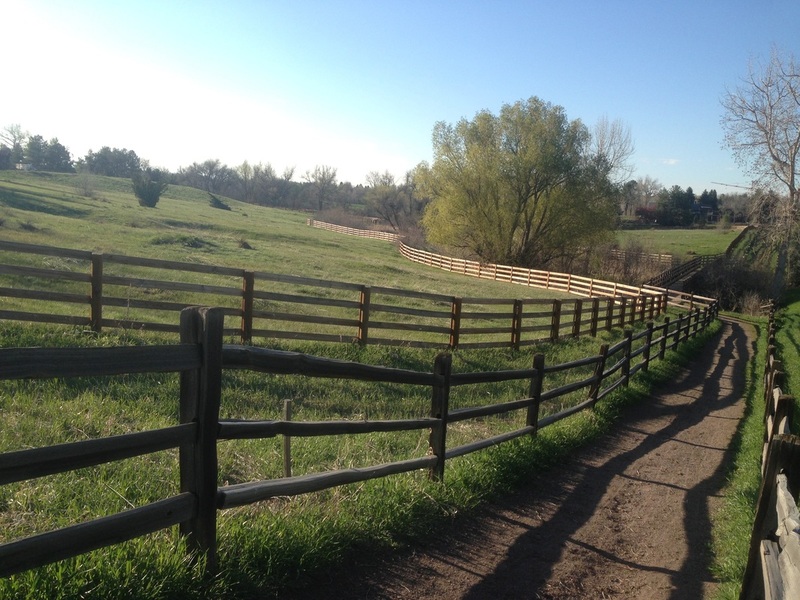 A little oasis of open space within reach of Denver. Getting creative with "hurdles" in the gym. At the end of a big training day. 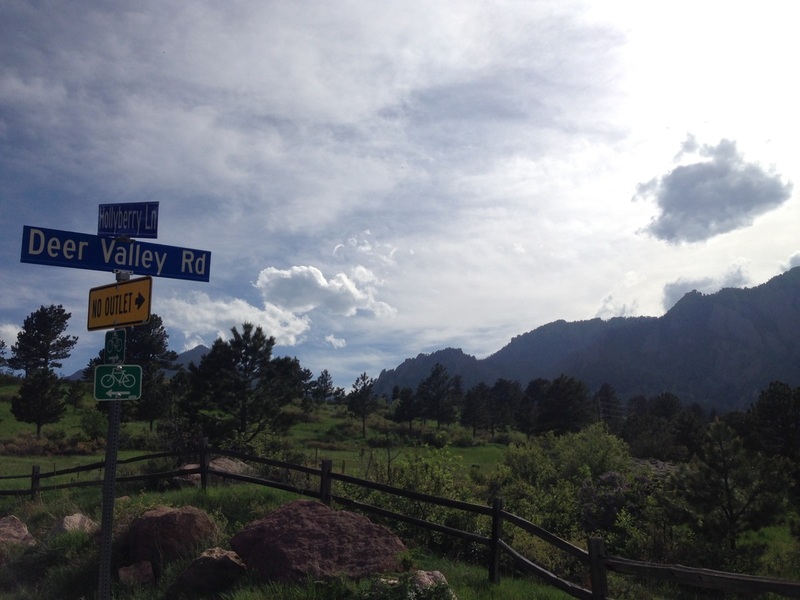 Outside of Boulder...Not to be confused with the intersection of Deer Valley Loop and Deer Valley Drive (where I live in PC). 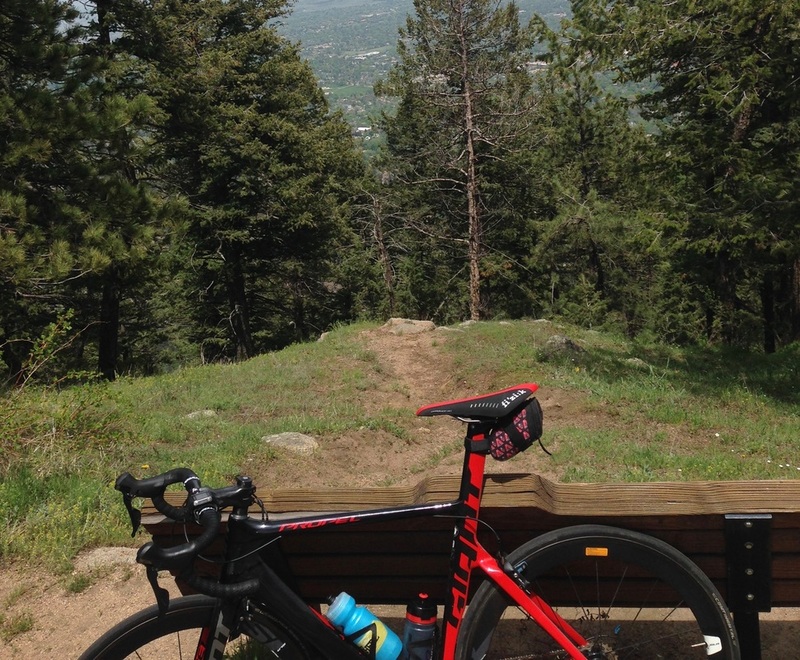 The view on a road-ride along the aptly named Peak-to-Peak highway. 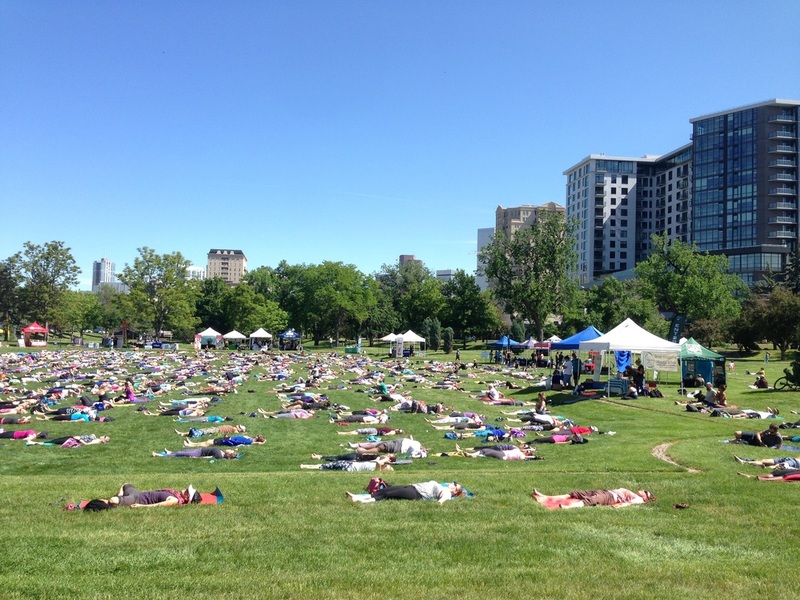 Yoga in the park is a little bigger in Denver than Park City. Like always, the time flew by, and now it’s a bit of a shock to find summer here already. I’ve been enjoying getting back to training with the team. We’ll get back on the jump this week, which will be great after nearly three months away from the hill. The week after that, we’ll start to really “pay our dues” with some hard sessions for our first intensity block. That’s all for now. Thanks for reading, sorry for the irregularity of postings. As you can say, I’m generally a busy guy! 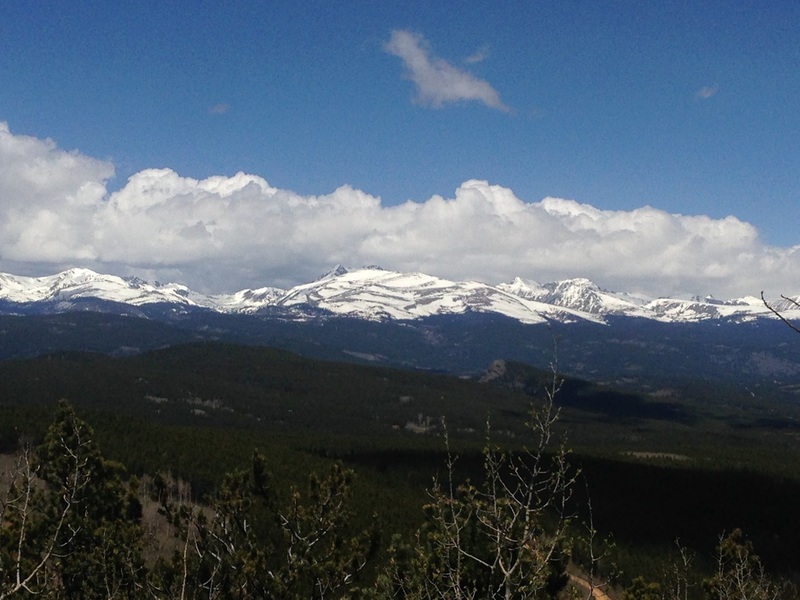 Just had to see the Rockies before leaving! 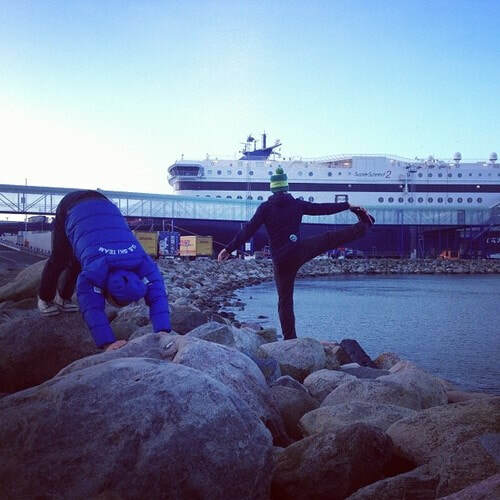 ​After competing in Norway the weekend before last, we traveled back down to Europe and a week of training in Slovenia. Although we’re all anxious to get back to competing on the World Cup circuit, this week of training turned out to be really productive. This weekend we start back up with the first World Cup of the New Year in Chaux-Neuve France! 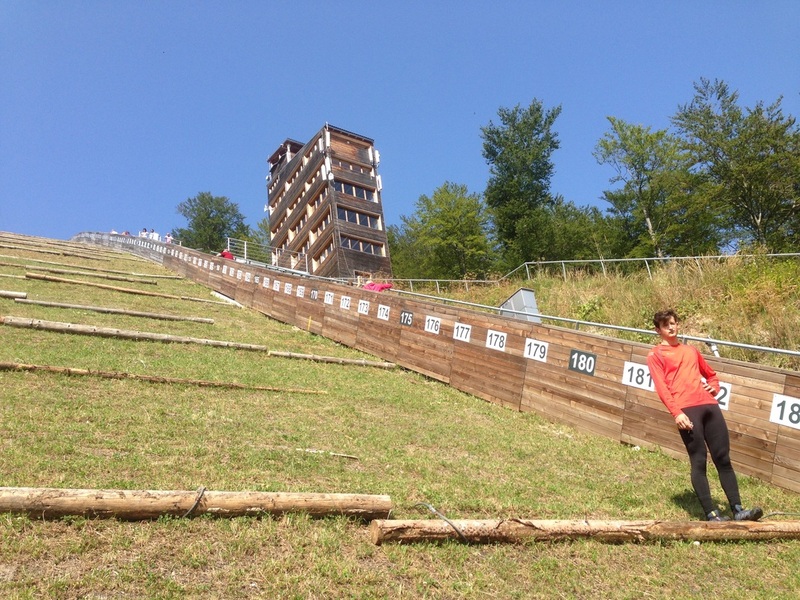 Planica is one of my favorite places to train. We were there for a camp this fall and it was great to get back on the jumps on snow. They're modern and somewhat challenging hills, but the super smooth inruns and high flying profiles make them some of my favorite hills to jump. 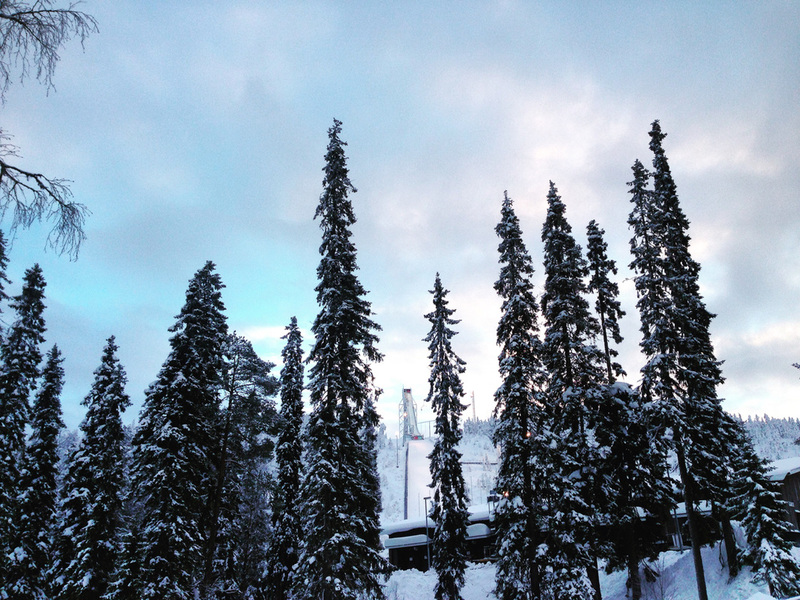 It’s pretty sweet to wake up in the morning and have the choice of two hills (K95 and K125) just right up the valley. A busy morning at the jumps. 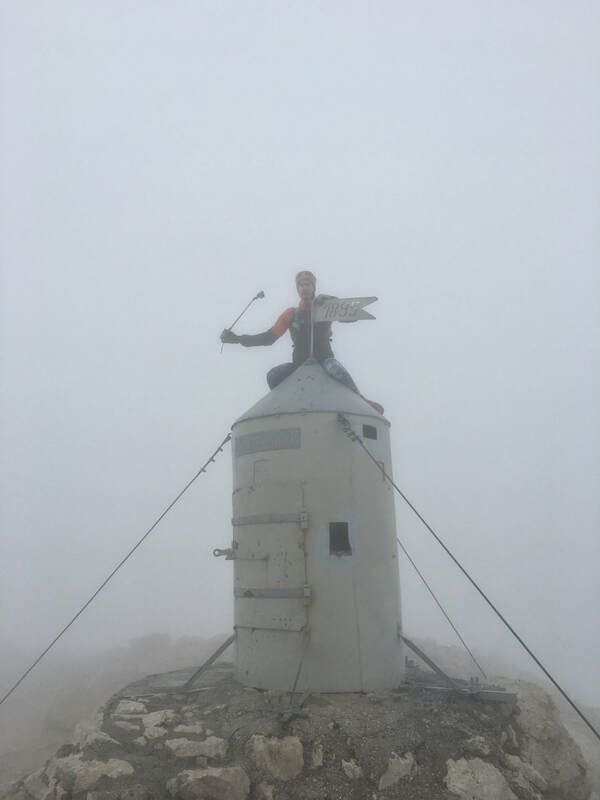 ​Winter still hasn’t fully hit Slovenia yet, but fortunately they had enough snow made for a challenging loop of skiing. 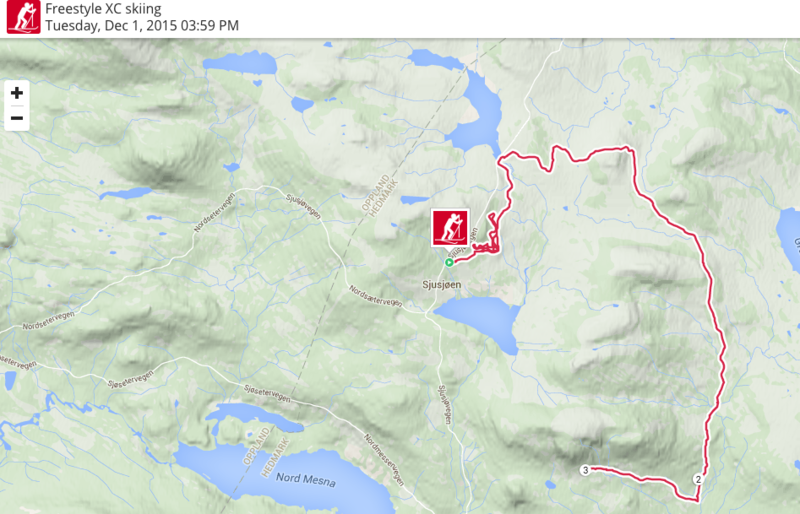 By the end of the week I had close to 95km – some 50 laps – on the loop. Surprisingly, most of the sessions went by pretty quickly. It helps to have a specific plan to break up and focus the session. 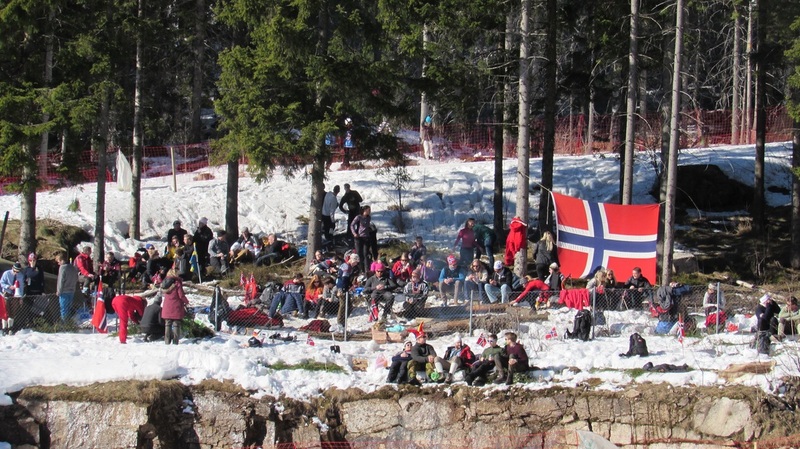 The Cross Country World Cup happened to be in Planica for a sprint weekend while we were there. On Saturday and Sunday we went right from jumping to the race course and watched the action from the sidelines. The races were high paced and really exciting to spectate. 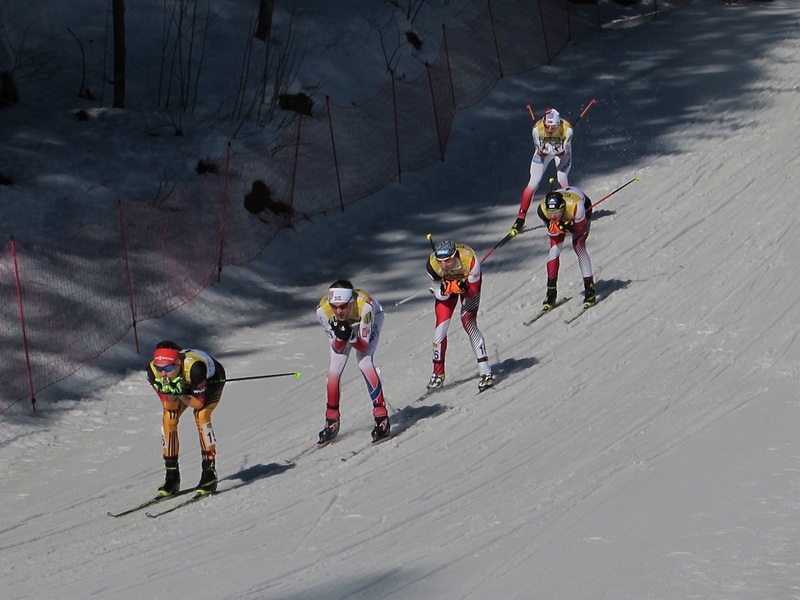 It was cool to get a good perspective on how fast those top sprinters are – especially before we skied our own race on the course after them. We just did a small “practice” comp to keep the speed up, but I gained a real appreciation for how much speed the cross country athletes carried on their sprints on the same tracks. I put up a quick video that my coach shot in some of our interval sessions. 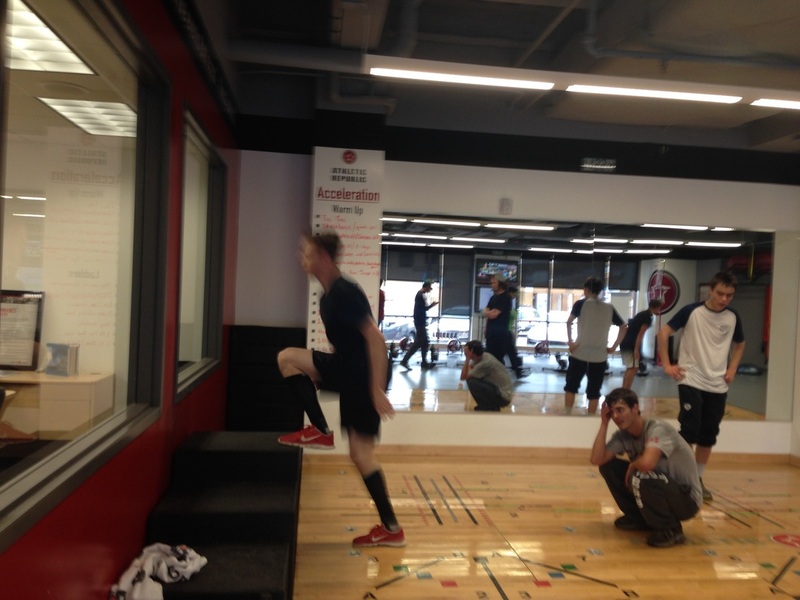 ​We also ran into some of our own cross country skiers in the weight room on Monday. Periodically throughout the winter our World Cups are held with them, and other times, like this, we happen to just be in the same place at the same time. 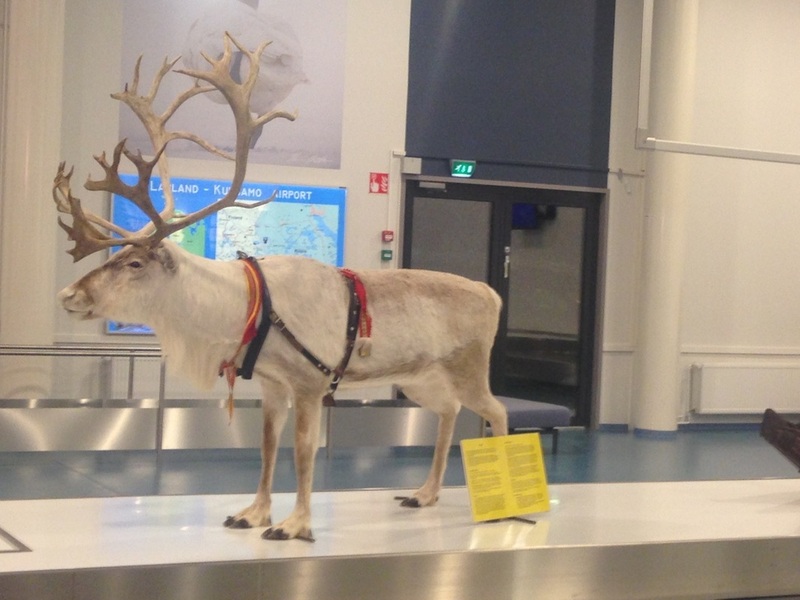 (Although usually if it's not for a competition, we run into other US Ski Team athletes at the airport hotel in Germany). 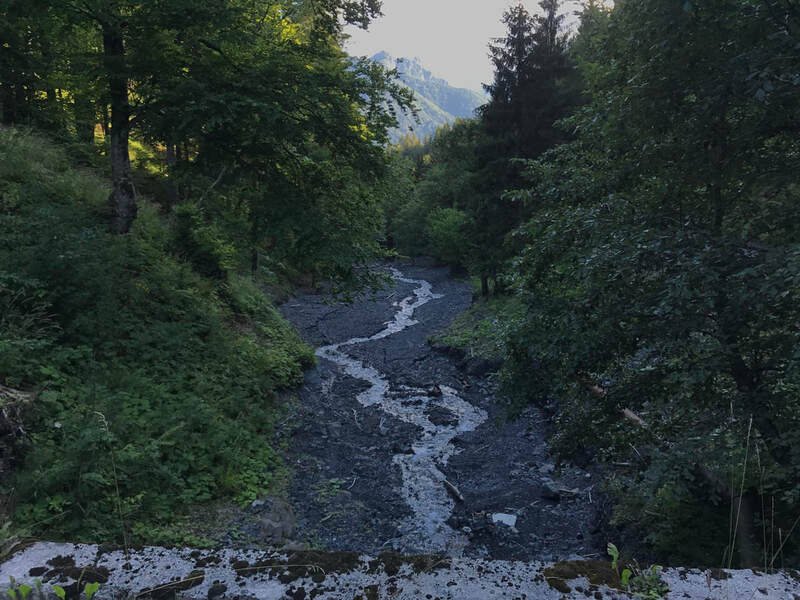 ​Yesterday we traveled to France - across Italy, over a corner of Switzerland, and just out of the French Alps to the city of Pontarlier, France. The scenery through the Alps, north of Torino and between Chamonix and Zermatt, was spectacular. Nothing makes an 8-hour drive go by like a couple hours in some of the coolest mountains around. Pontarlier is a surprisingly large city about 45 minutes away from the small town of Chaux-Neuve, where we’ll compete. This competition was originally scheduled for the last weekend, and after it was pushed back, the organizers had to scramble to find new accommodations for all of the teams. Most of the area surrounding Chaux-Neuve is farmland dotted with small rural towns, so I’m not shocked that this was the closest city they could find with open rooms. The Italian Alps near Courmayeur. I’m psyched to get this weekend going tomorrow with official training and PCR/qualification. The next two weekends are pretty high pressure, as we need to get some more points in order to keep the rest of the season alive. 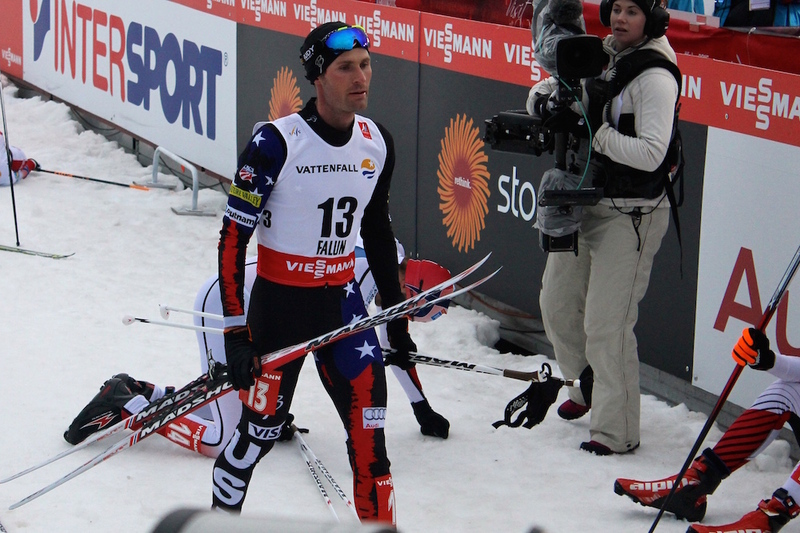 But last year I had my best result here in Chaux-Neuve, and I think I’m up for the challenge! In case you missed it, FIS gave me the opportunity to share some writing. The following post is also on their website. 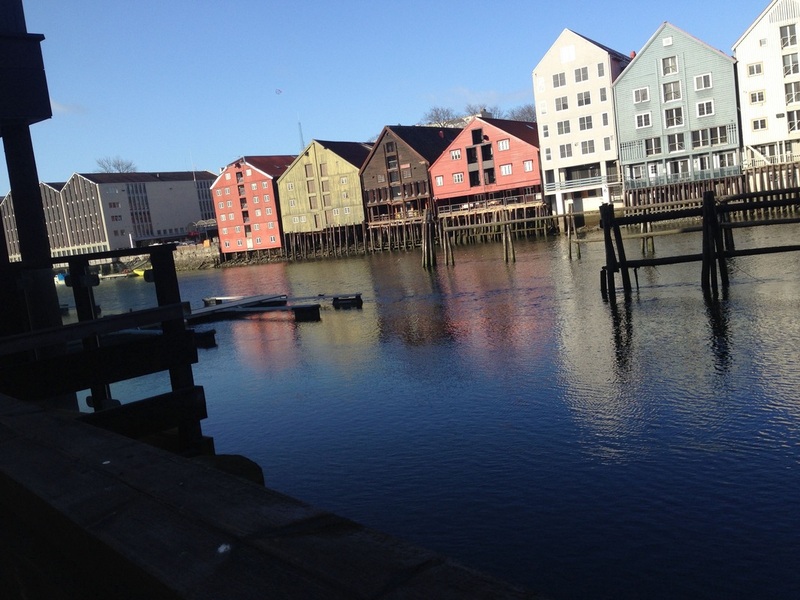 Also, I made a little video from our trip up to Norway. You may need to watch it on a desktop if it does not play on mobile. 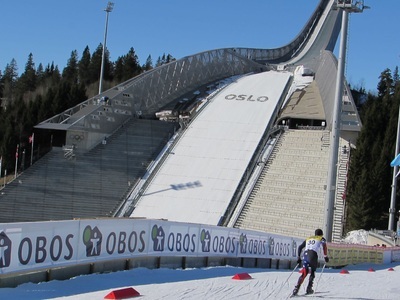 Due to the very difficult weather situation that brings a long competition break this winter, FIS Nordic Combined is breaking new ground on its website, usually dedicated to competition reports, news and interviews with the top stars. Instead of asking about sports related matters, we gave the word to our athletes themselves: what is on their minds at the moment, how do they view and handle the situation and related "deeper" issues like positivity, the spirit of competition or climate change? In the first edition, Team USA's Adam Loomis writes about unpredictability. If I’ve learned one thing so far this season, it’s that nothing is predictable. 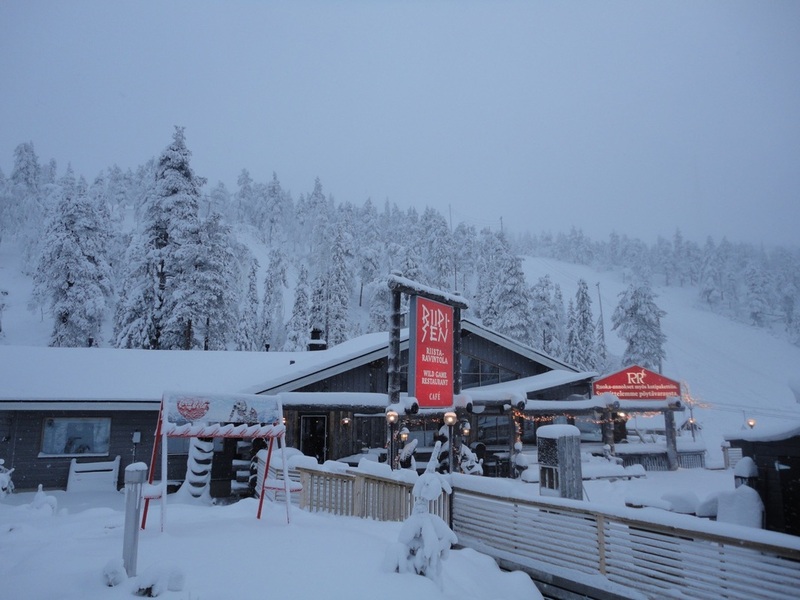 We saw this the first weekend of the circuit, in Ruka, Finland. We arrived early in the week to find perfect wintery conditions: plenty of snow, cold temps, and calm winds. 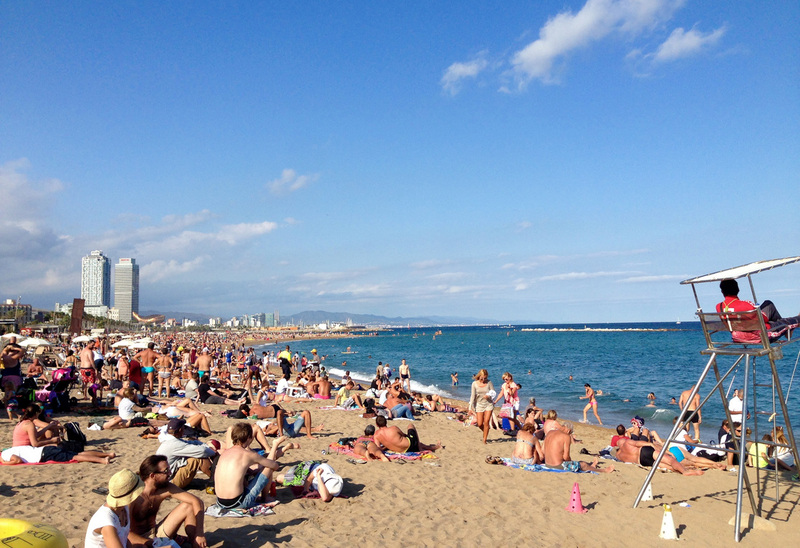 By the weekend, however, a warm front blew in – and kept blowing. 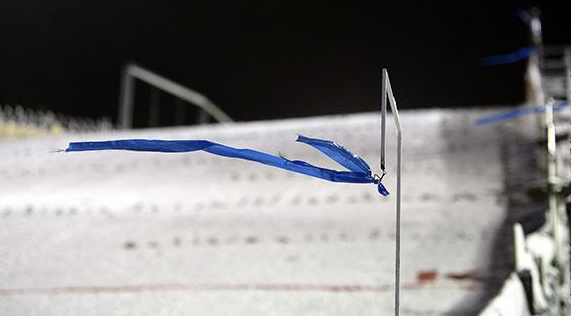 The strong winds prevailed, preventing even a single round of training, much less the completion of a full jump competition. In Lillehammer, the next stop, and the defacto season opener, after one competition on the big hill, we moved down to the normal hill. This meant a quick change to a very different hill, and those that were ready for this excelled. 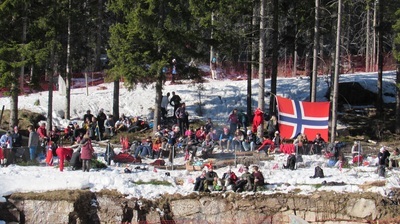 Fast forward two weekends to Ramsau, where the prodigy Norwegian Jarl Magnus Riiber stole the spotlight of both competitions. 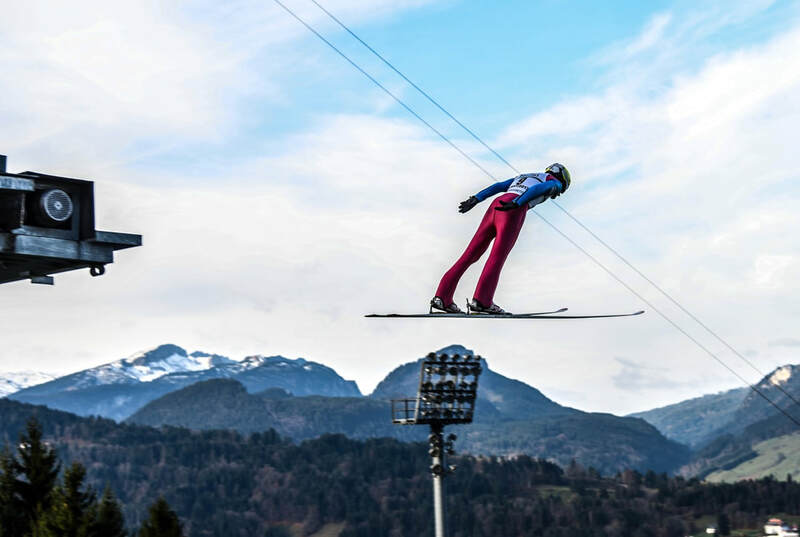 While we first saw Riiber’s talent in full form last winter, his performance in Ramsau brought fresh light to how high the level of jumping can be on the Nordic Combined circuit. Despite his dominance on the jump hill, through four separate competitions, we’ve had four different athletes at the top of the World Cup podium. Thus far in 2016, challenging conditions and schedule changes have been the unfortunate story. 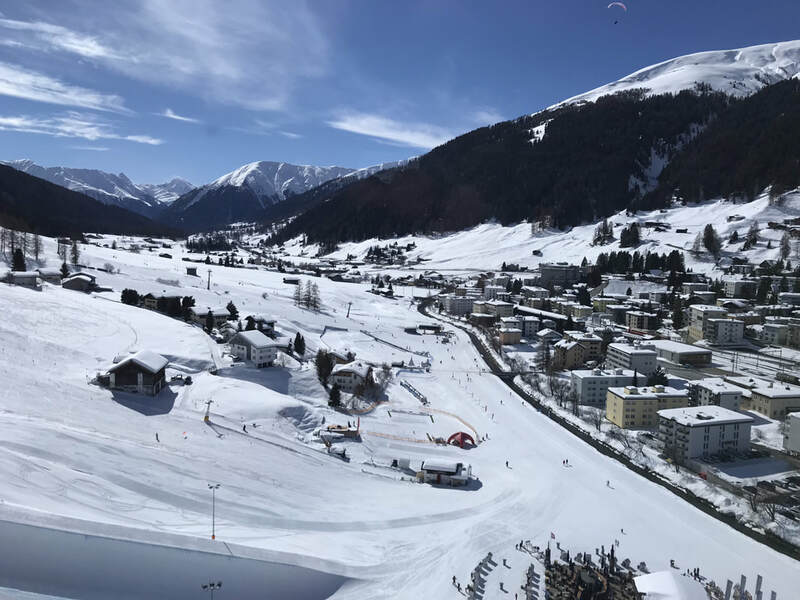 Athletes and coaches found themselves making quick adjustments to their plans, searching for the places with good snow for training, such as Seefeld, Austria. 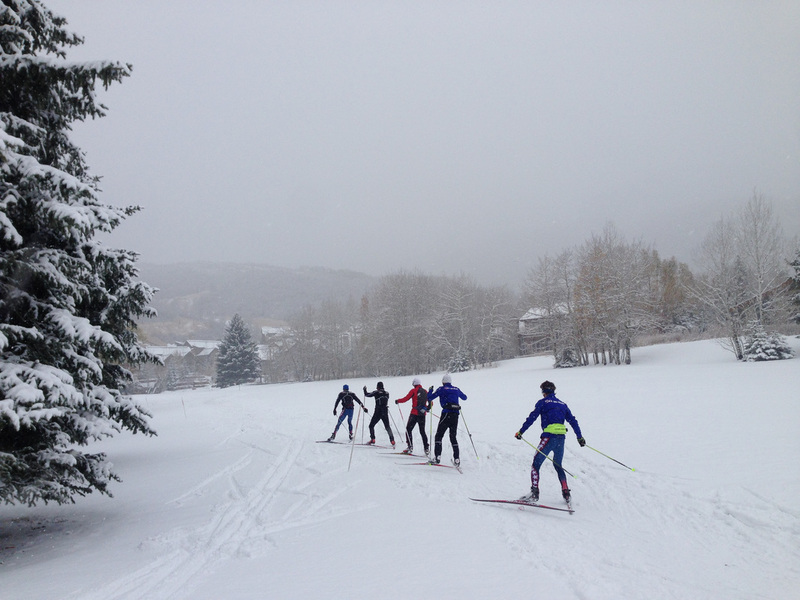 Back in the US, we were lucky to have incredible winter conditions for training in Park City, UT. After the announcement about Schonach, our “younger” World Cup team (Jasper Good, Ben Berend, Michael Ward and me) flew to Munich, rather than change our tickets for a second time. 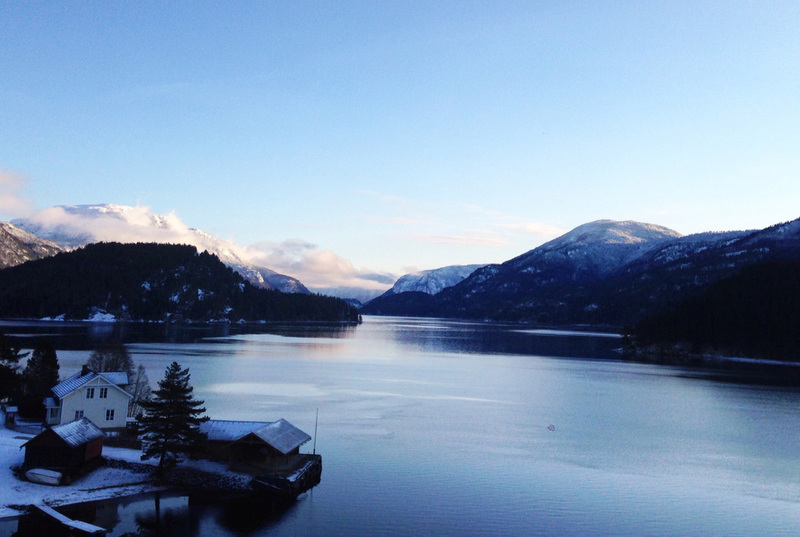 From Munich, we pushed onward to Høydalsmo, Norway. (9 hours of driving through Germany, one night at a hotel, three more hours to the tip of Denmark, a “short” 4 hour ferry ride to Larvik, Norway, and then three more hours to our hotel). 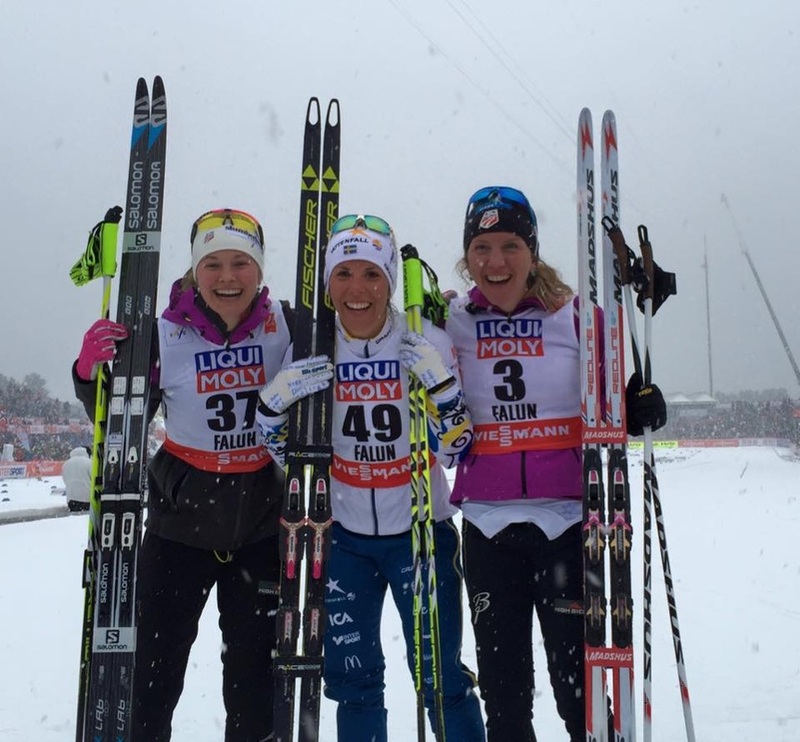 Høydalsmo held a Continental Cup – as planned – but now without a World Cup that weekend, it got a whole lot harder. 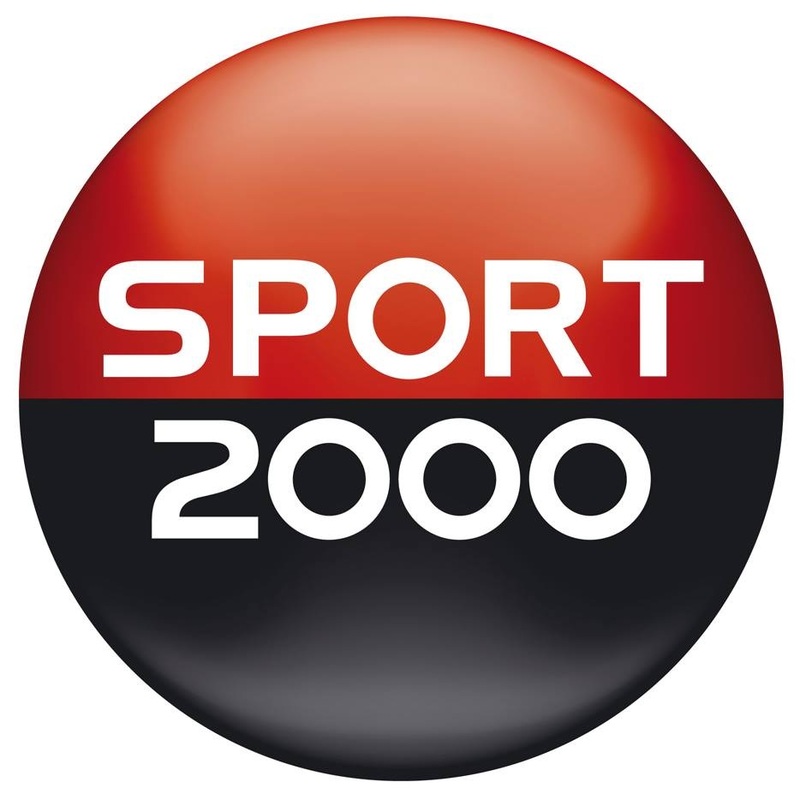 Numerous World Cup athletes were amongst the 67 starters, including Finland’s Ilkka Herola, who already has a podium this season from Lillehammer, and Maxime Laheurte, a French veteran of the sport with multiple podiums. 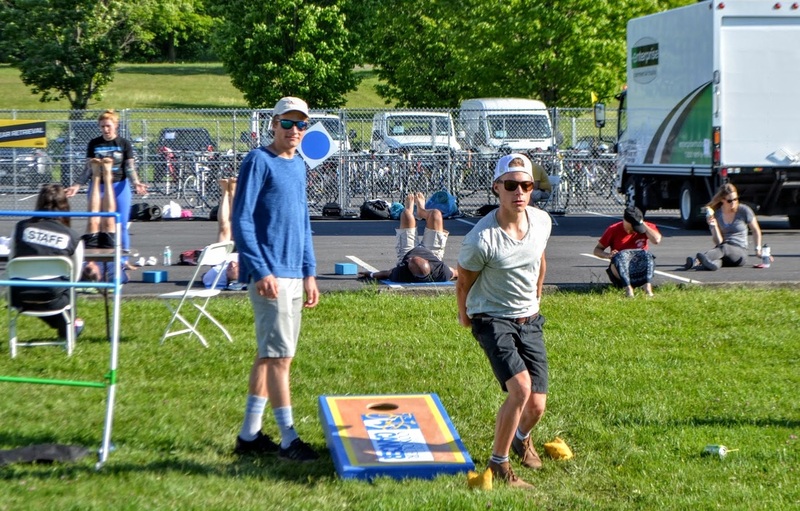 These two athletes in particular seemed likely to take the competition by storm, but as it turned out, only Maxime reached the podium, with a third place on Saturday. It is evident that one cannot take anything for granted in this sport. Plans will change, upsets are the norm, and there’s no guarantee that a so-called “World Cup athlete” will always beat a Conti Cup skier. On a personal level, I started the weekend with relatively strong jump performances, but after a disappointing race on Saturday, I struggled to bring the same mindset into Sunday’s competition. Rather than be psyched about my improvements on the jump hill, I lingered for too long upon failing to meet my expectations for the race. In hindsight, I should have known that everything fluctuates, from year-to-year, week-to-week and day-to-day. Rather than worry about the factors that aren’t going as planned, we can all be better by appreciating what we have going well for us. 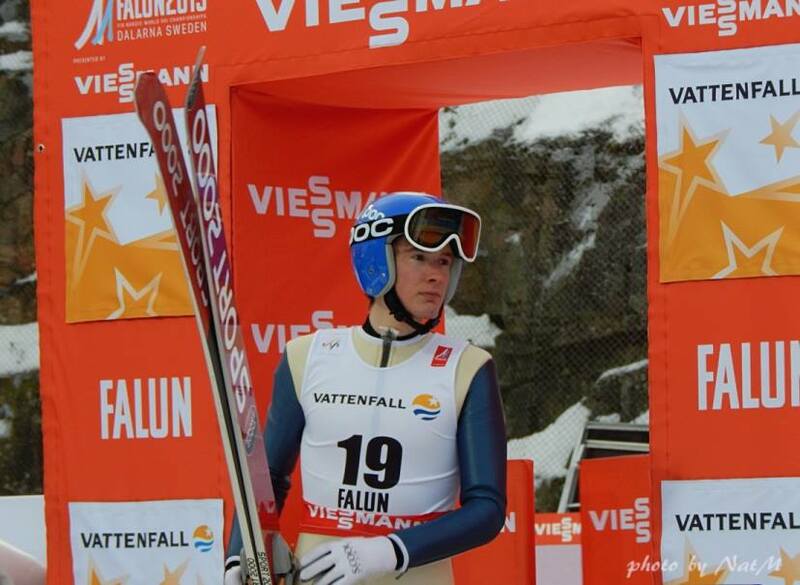 Take the winner of the second day in Høydalsmo, Franz-Josef Rehrl for example. 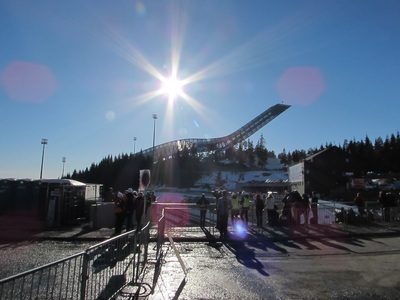 Last winter in Høydalsmo the jump competition was cancelled due to too much snow (yes that can happen). 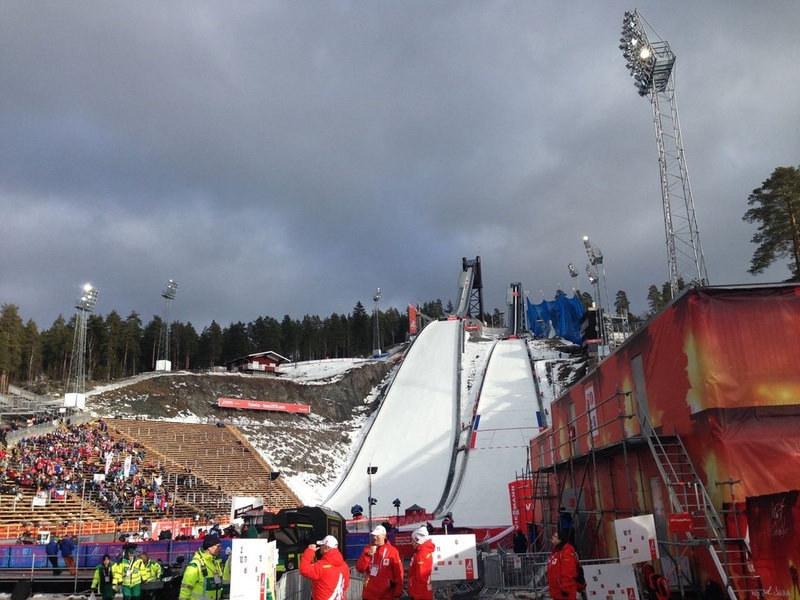 Fortunately, we still had a provisional jump to use for the afternoon’s race. 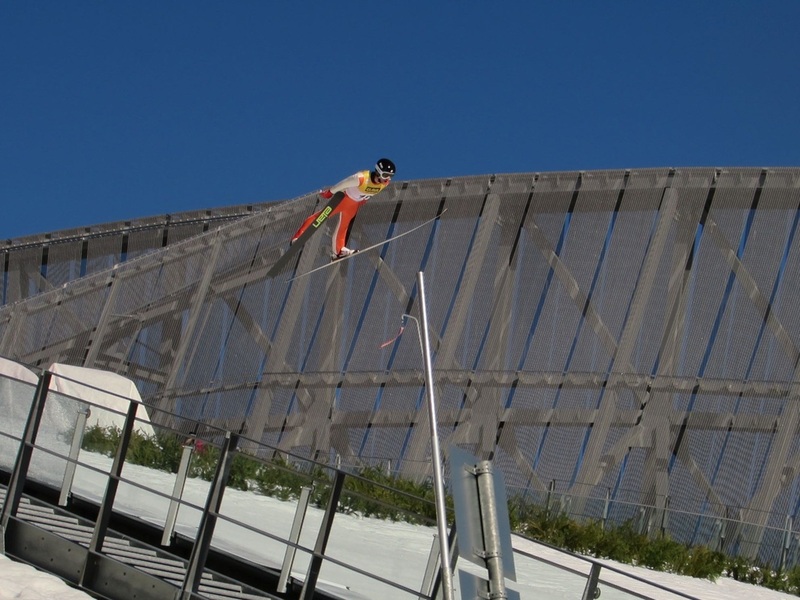 Franz, however, took the extra time waiting at the jump hill as an opportunity to go powder skiing behind the ski jumps. He came back into the changing room some time later, fully covered in snow, grinning and, luckily, with his 2.6m long jump skis still in good shape. While I’m not prescribing this as a pre-race routine, it says something about a skill that winners have. They adapt and make the best of what is in front of them. This winter may or may not become the norm for years to come. But certainly, as athletes, we will only have to get more accustomed to varying conditions and changing schedules. 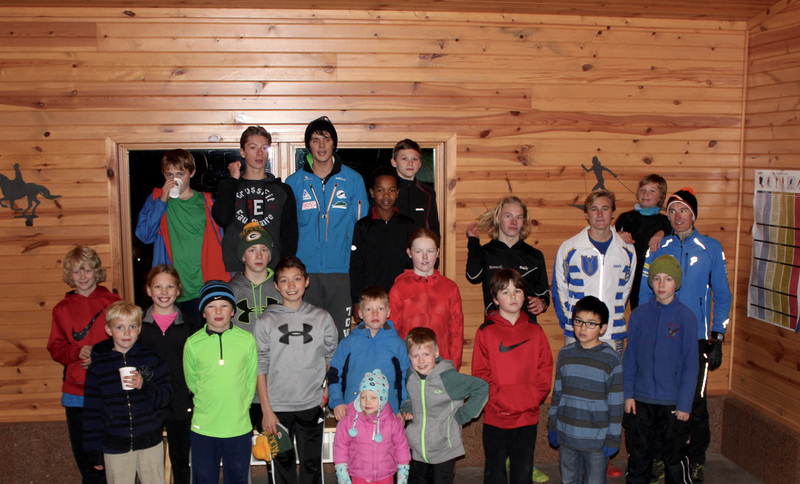 At the end of the day, anytime we get a big group of Nordic Combined skiers together; it makes for a great competition. When you let go of the bar, or charge into the start of the race, it doesn’t matter where you are, or what it’s called. The opportunity to compete is a beautiful thing. 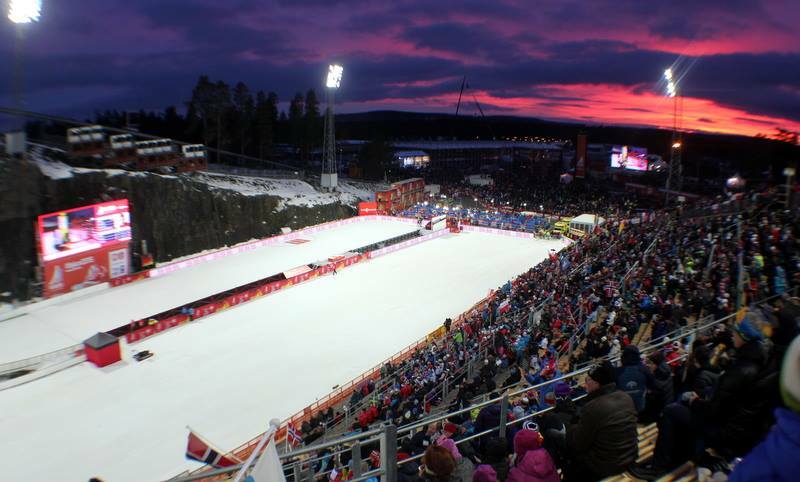 It's Thursday evening as I write this, and in less than 24 hours I'll be aboard a plane to Finland for the World Cup Opener in Ruka. The last few days before leaving for the season are always a bit of a whirlwind of organizing, packing and last minute tasks. I came down with a bit of head cold yesterday morning, which wasn't ideal timing, but better now than in a few days. I forced myself to stay in and rest, and with a couple easy days ahead, I should be ready to go by next week. The upside is that I finally got everything organized and had time to sit and write a blog update. Going back a few days, I had a great trip back home the weekend before last. I usually don't make it home more than once or twice a year, so any chance I get is a treat. 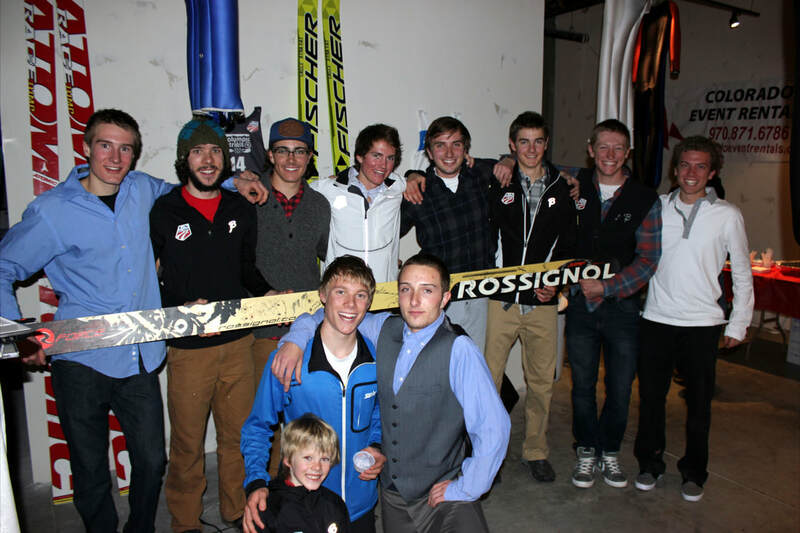 This time, I went back to run a small clinic and bring the ski community together for an evening. Bjorn, the owner and organizer of Out There Nordic (ski shop and team), suggested I do this and was instrumental in making it happen. We held a silent auction as a way to raise funds to help with my travel and competition expenses, and I was amazed at how generous supporters were with donating food, auction items, time and energy to make it happen. The best part, though, was just seeing how excited everyone was about skiing and following their dreams. 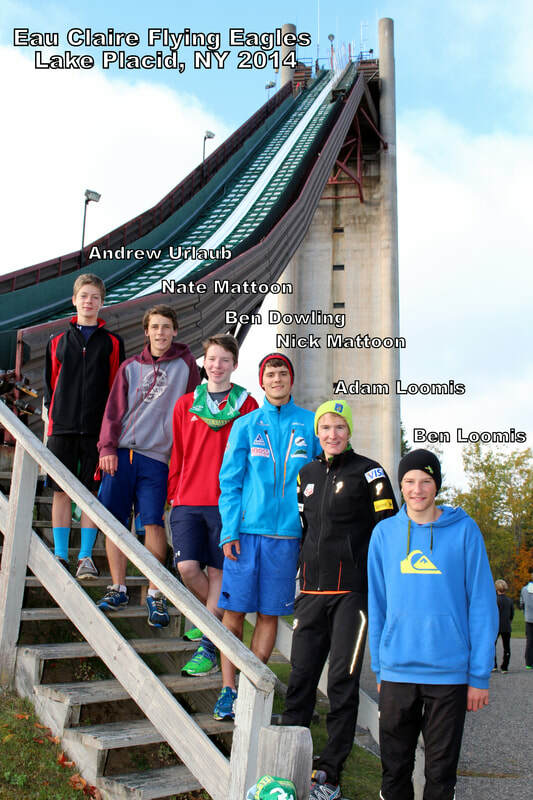 Eau Claire's local ski jumping and cross country programs are gaining momentum quickly. It was cool to bring together members from both clubs into one setting, which unfortunately doesn't happen as much as it should. For the training session, I had a mix of young nordic combiners, ski jumpers and cross country skiers. Although ski jumping and cross country skiing generally require very different training, I enjoyed demonstrating that we can do exercises to make you better at both sports, such as mobility, speed, balance and agility work. I'm really glad that I had the chance to make this happen. It means a lot to hear from people who are following my journey, and I hope I can inspire others to dream big as well. I also made time for a few other activities while I was home: a trail race at Lowes Creek Park, rollerskiing with a couple Eau Claire skiers, and I checked out the new plastic ski jumps! 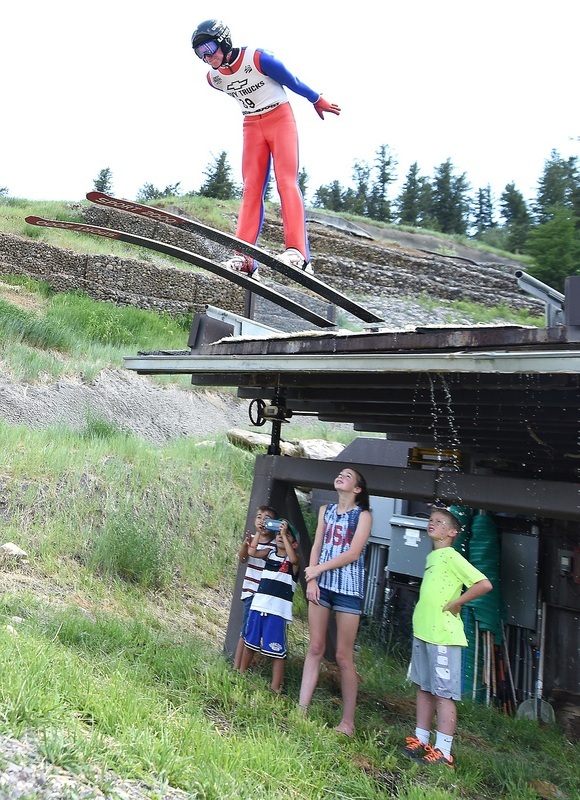 This summer the Flying Eagles ski club just finished putting summer jumping on the Mt. Washington hills that I learned to jump on. This project has been in the works for a while, but to come home and see it as a reality was awesome. On Friday night I had the pleasure to watch some of the local kids jump - their fifth session of the week - not bad for a week in November! The new Mt. Washington complex. No rest for the wicked though, and after a few days, I was on a plane back to Salt Lake. To my amazement, shortly after returning home, the weather changed from "it's never going to be winter," to "yes, winter is here!" over the span of a night. Per usual, our team got out as soon as a the snow accumulated and skied in a track on the public golf course. Thank goodness they let us ski there - because a few inches of snow wouldn't be enough to ski anywhere else. Although I hadn't been on snow since the beginning of April, the feelings come back pretty quickly. 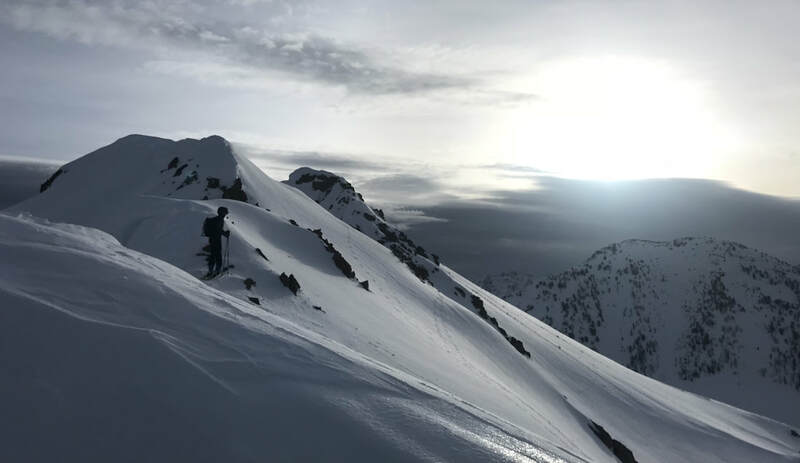 Our team doesn't make glacier trips a priority in the offseason, with the need to get to different jump venues and competitions being more pressing. If we had unlimited resources and time, it would certainly be worth it. But after just a day or two on snow, I feel like rollerskiing translates right into the real thing. 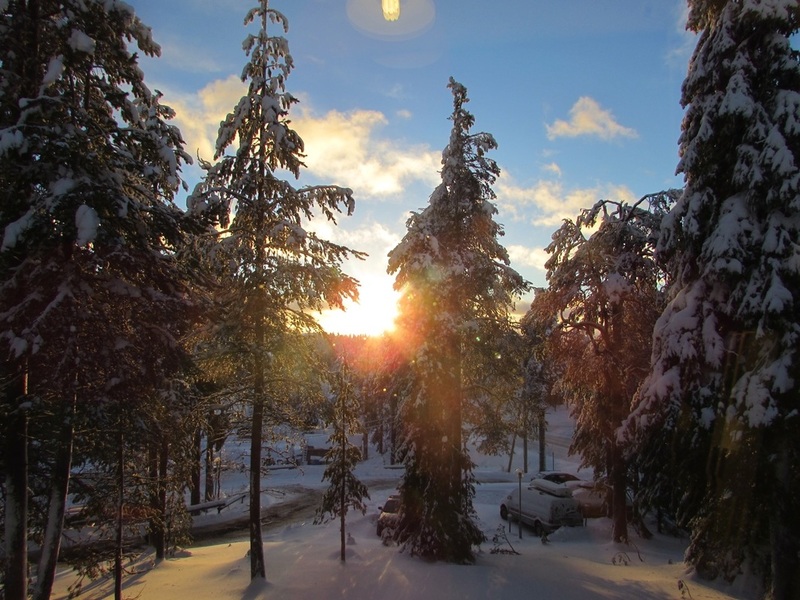 Back on snow at Whitepine Touring - aka the golf course. It gets a bit sticky when you get down to the grass! Last weekend almost everyone in town with interest in getting the jumps open came out for a big work party to snow in the K90. It was certainly worth while though. After we snowed it in, the coaches and hill crew stayed into the night and cut a beautiful track. 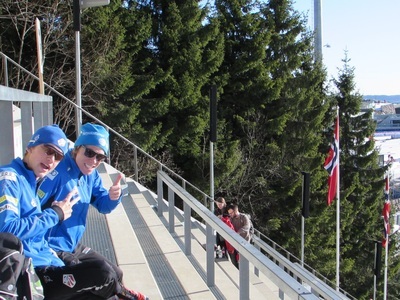 We got on the hill 3 days this week - just enough to have the feelings back before heading to the big old Kuusamo! A freshly cut track - photo (and at least partial cutting) credit Alan Alborn. Heave ho' -- Alan Alborn photo. Stay tuned for more! I'll try to get an update before the competition gets rolling next week. If not, we'll be underway next Friday. 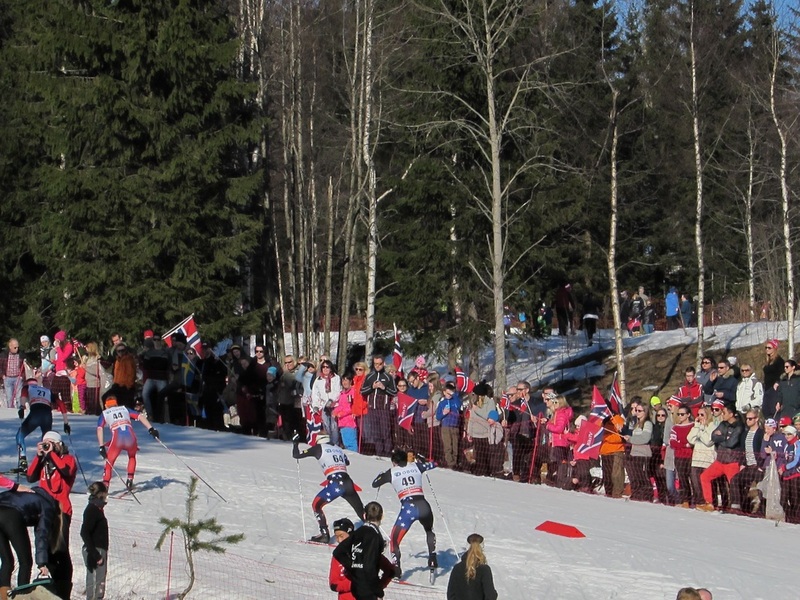 Also, new this year, NBC sports is going to be live streaming all of the Nordic sports World Cups! The news just broke this week, so we'll find out more soon, but here's the link to access the live streaming. (Be warned, early mornings might be necessary to watch if they don't have a replay option). One month and two days and I'll be en route for Finland. It's that time, when winter is right around the corner and the excitement is becoming more real than ever. We're 40 days from the opening World Cup. Five jump sessions on plastic, one more hard intensity week, four plane rides, five Sunday NFL countdowns. And then our time begins. But... as any good sport psychologist will tell you, stay in the present and focus on the tasks at hand. I've been working hard getting ready for the season with my teammates, and we still have some work to do before we're ready to go. 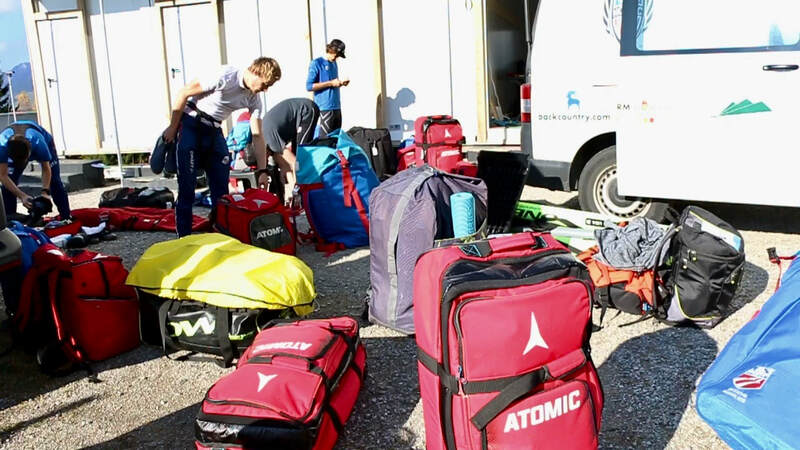 Last week, we flew back from Slovenia, where we spent two weeks in a final prep camp. 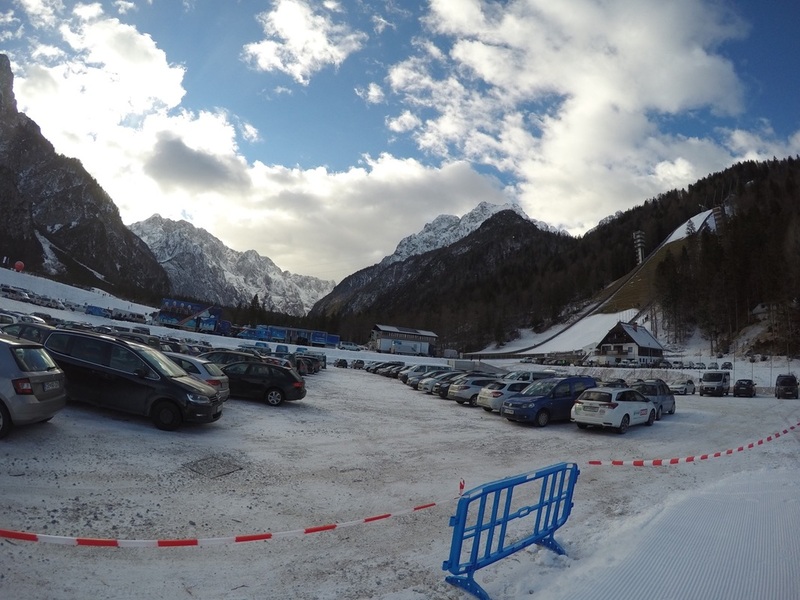 Somewhat unusually, we spent the entire time in one place, Ratece, Slovenia, just below the famous Planica jump venue. 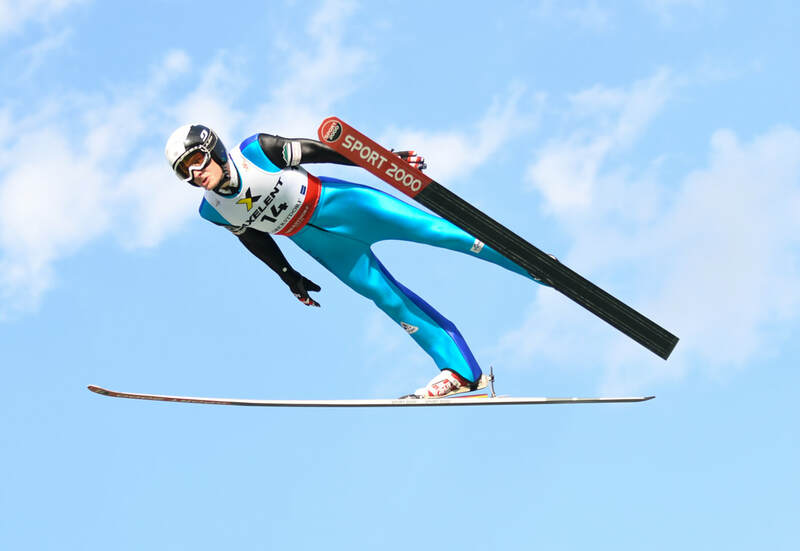 In Planica, we trained on both the K95 and K125 jumps, although, if we wanted to, we could have jumped on any of the five other smaller hills with plastic in the facility. We also drove to nearby Kranj, SLO, to jump their K100, and over to Villach, Austria's K90. Both of those jumps were within 40 minutes of us, so we really had no need to move around from hotel to hotel like we typically do in Europe. Planica's 5 small hills, with the large hills on the far right border. A foggy look down on the venue. 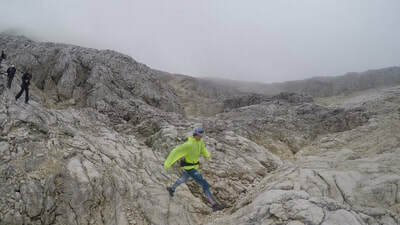 In addition to jumping venues, the surrounding Julian Alps area offers unlimited terrain to explore. 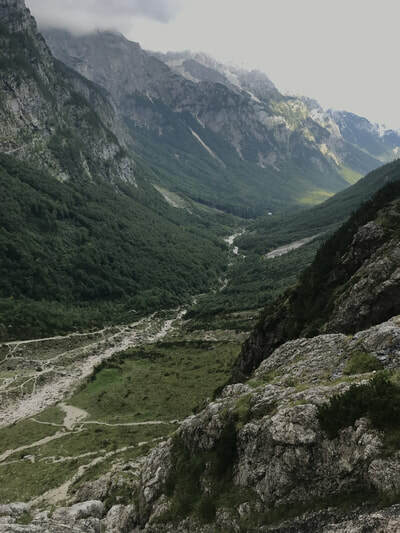 We hiked up to the Tromeja (triple border) of Italy, Austria and Slovenia. Later in the week, we ran and hiked up to another peak across from the Planica jumps. The weather didn't cooperate with many clear days, but once we got above the fog, the panorama views of the mountains were worth the effort. For a couple interval sessions, we rollerskied up a pass where we had to navigate some tricky cobblestone switchback corners. Amazingly, none of us broke a pole either session. 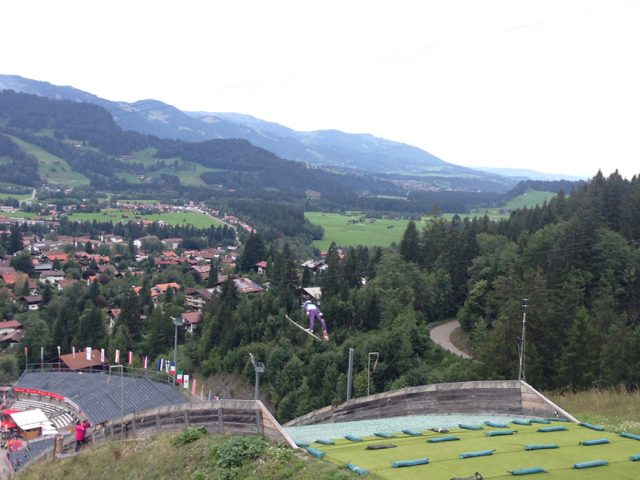 While we were in Villach, we skied on the rollerski track at the bottom of the jumps. 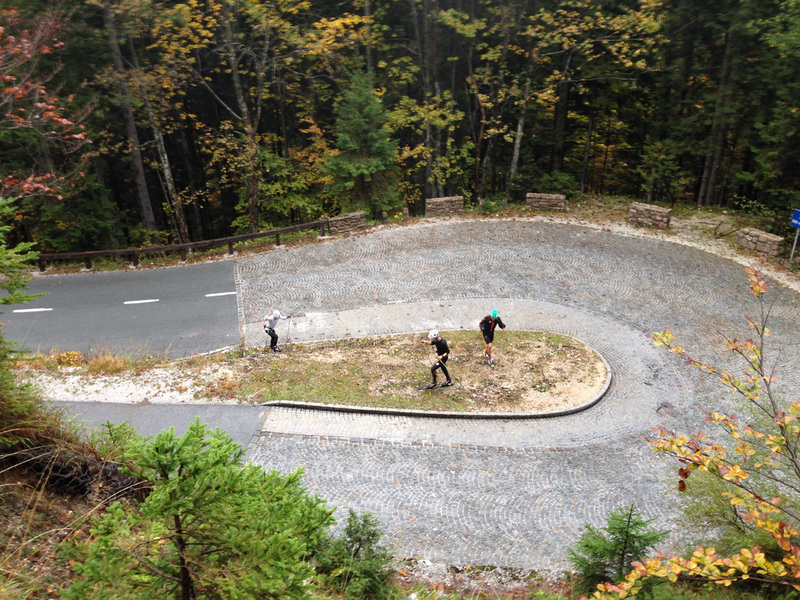 We also drove up to a rollerski track in Pokljuka, Slovenia, where they hold a variety of races, including a World Cup biathlon races every winter. 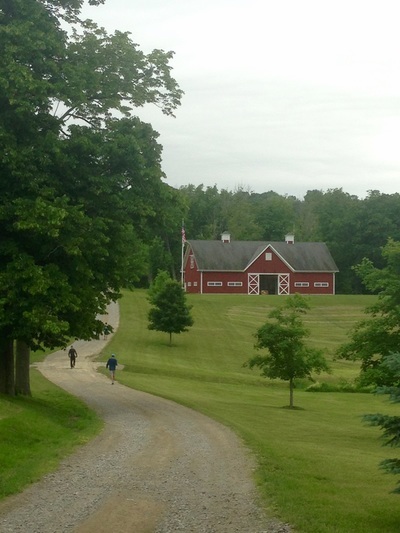 Rollerski tracks offer two main benefits: no cars, and the undulating, punchy terrain of a real XC race course. 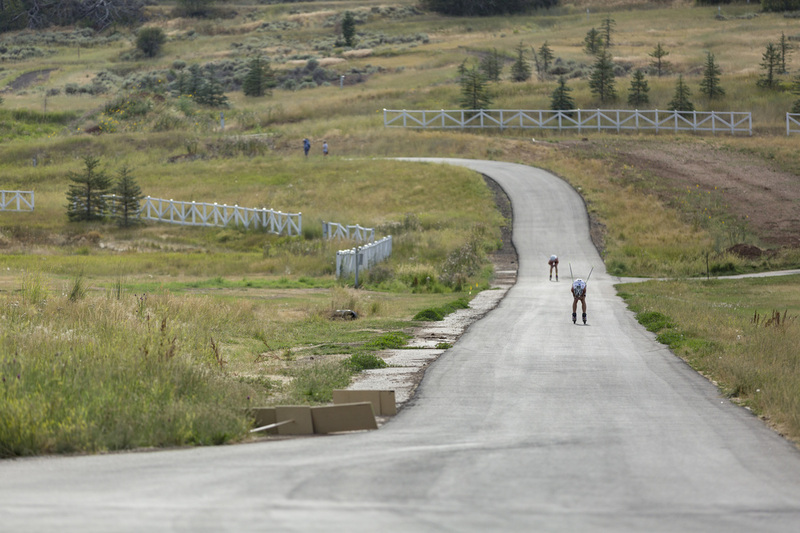 We're lucky to have Soldier Hollow's rollerski track to ski at in Utah. 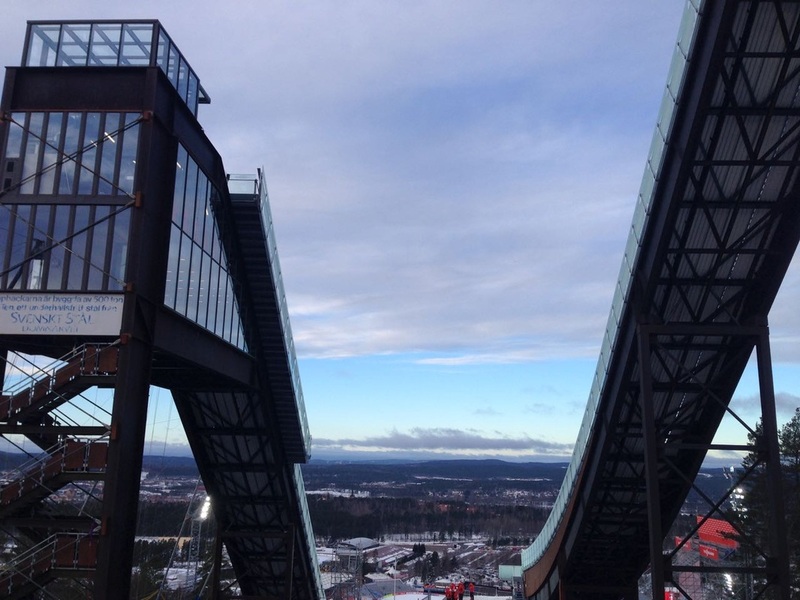 But like ski jumps, every course is different, and it's better to ski on different terrain. 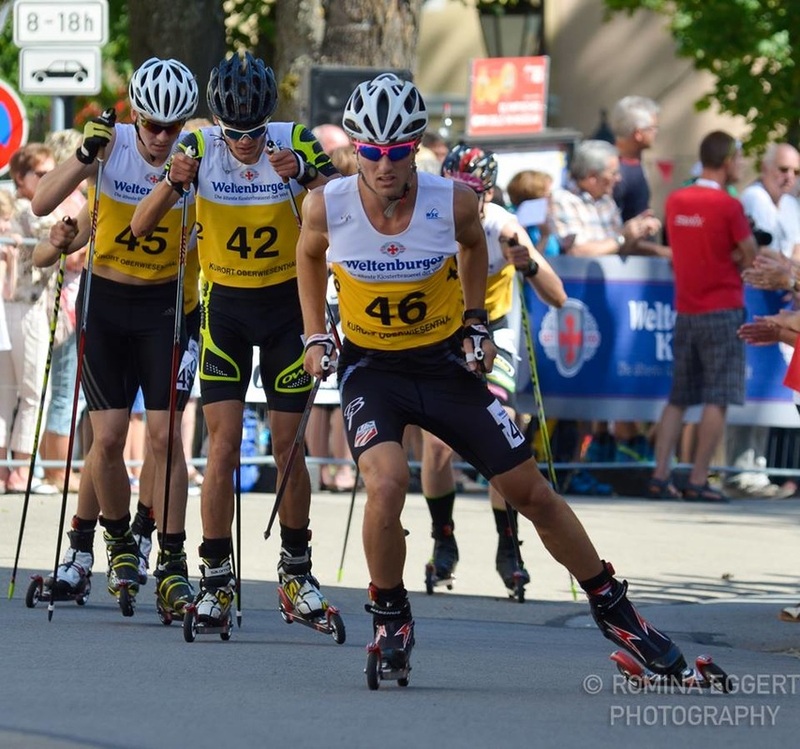 Team Rollerskiing: Villach, Austria from Adam Loomis on Vimeo. Our time was really productive for the whole group. Everyone was healthy and in good spirits - even the rain didn't bum us out much. 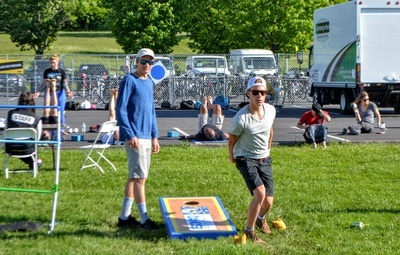 We had three juniors along: Grant Andrews, Somer Shrock and my brother Ben. 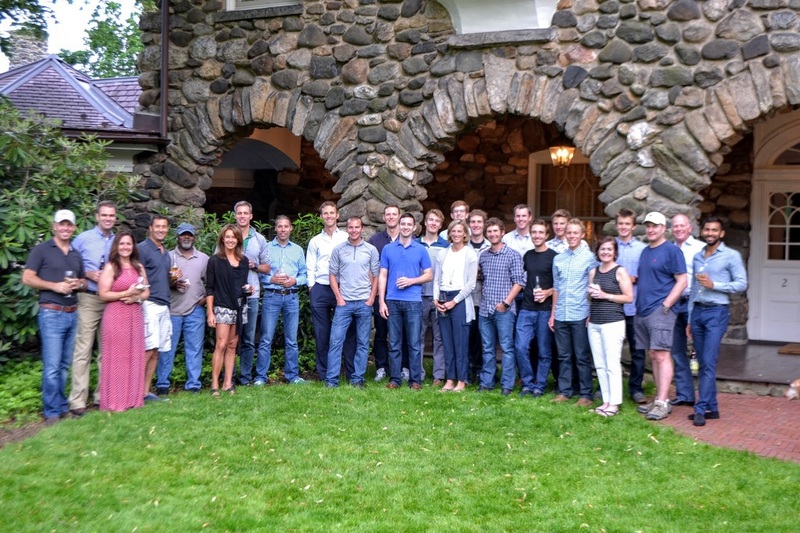 It's always great to mix younger and older athletes, and in this setting, where their were only a few juniors, they learned from us and integrated even more than usual. After the camp, we didn't waste any time before getting right back into training. We flew back Monday, got home Tuesday at 1:30 am, and were right back at jumping Wednesday and Thursday. On Saturday, I ran and hiked up to Mt. Timpanogos. 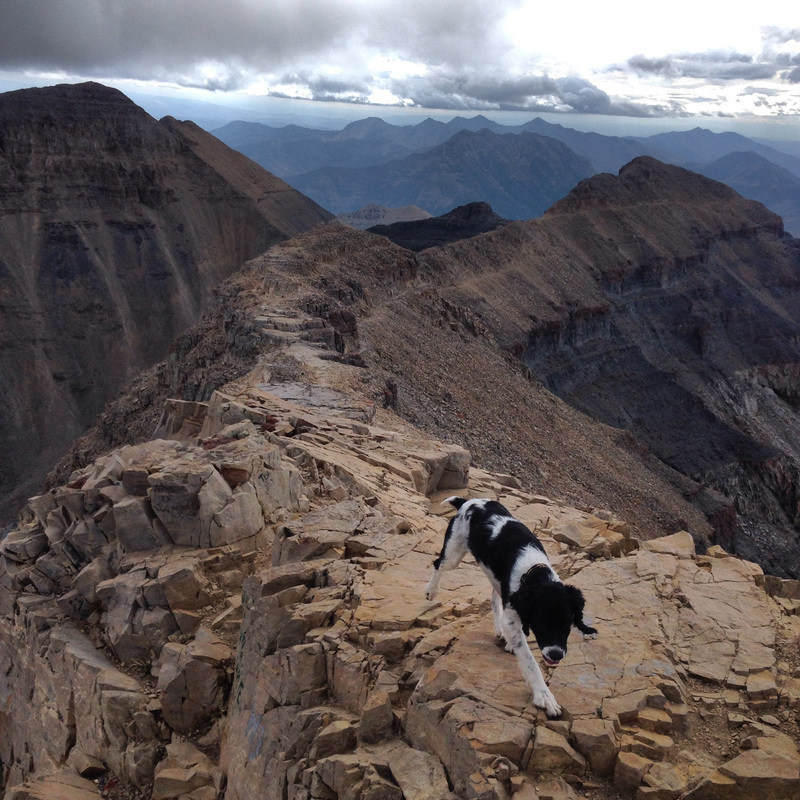 I've been wanting to get to the top of "Timp" for a while, and finally got out and made it happen. By the end of it, I even tired out Roxy, my usually tireless Springer Spaniel. She recieved quite a few impressed comments from the hikers that we passed along the way. For me, it was a 14 mile day, with a little under 5000ft of climbing. Roxy probably did double that. 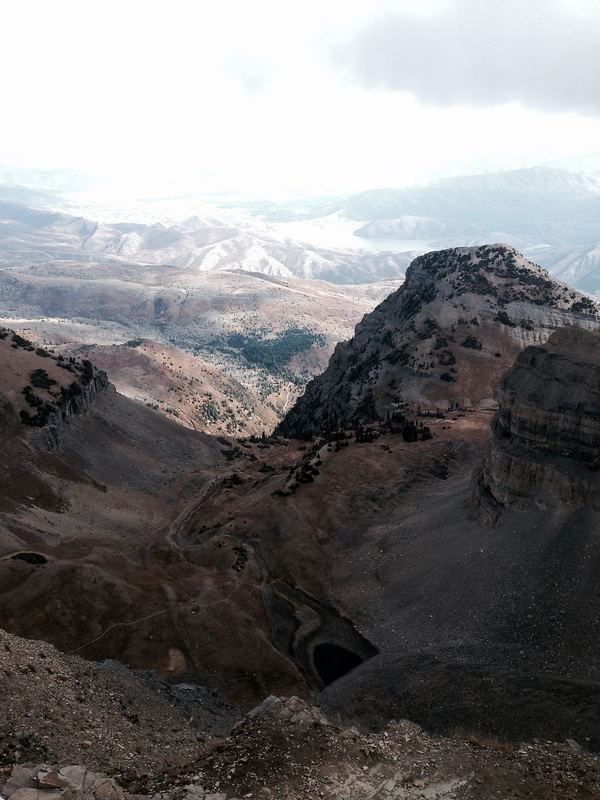 Looking down on the Timpanogos Basin. 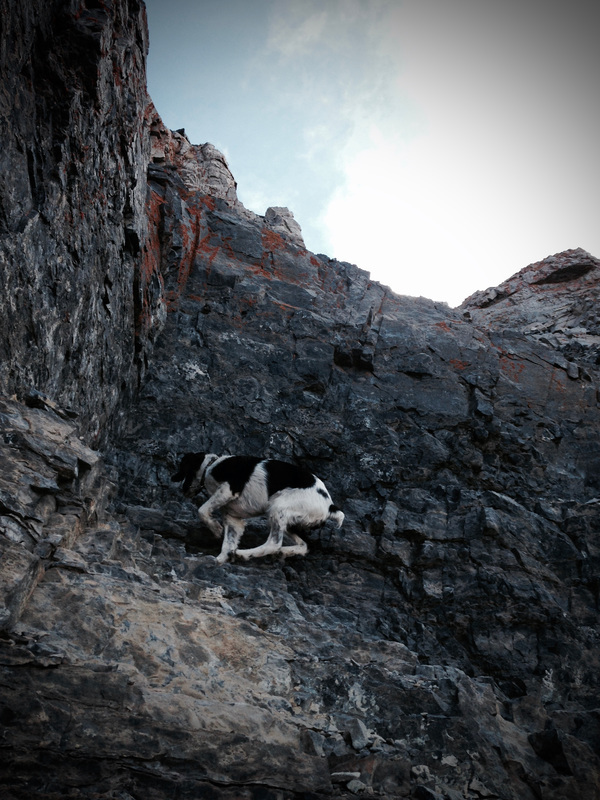 Roxy, as sure footed as the mountain goats. Today is an ever important rest day, the first one I've had without travel in a few weeks. This time of year, recovery is as crucial as anything. 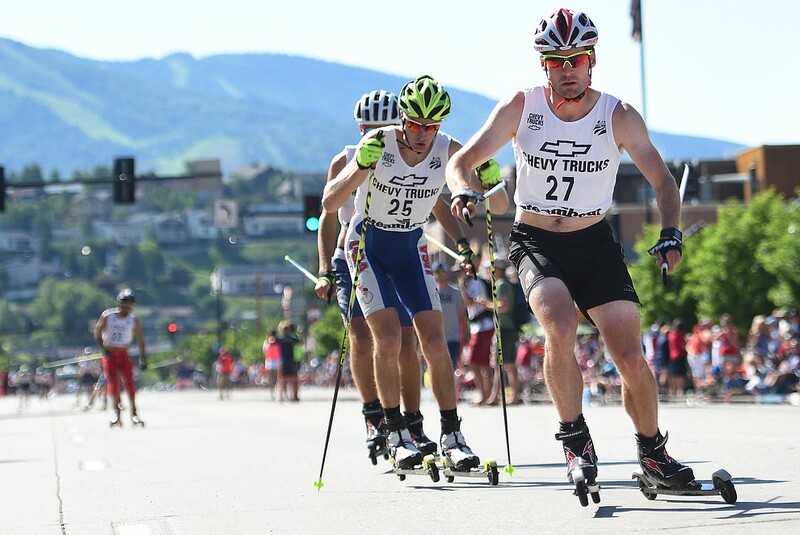 Coming up, we'll have a busy week of training, then a fundraiser in Steamboat and two rollerski races with the US XC Ski Team the following week. Hopefully we'll show them what Nordic Combiners are made of! After that, on November 7th, I'll be home for Out There with Adam Loomis. If you haven't already, check out the Facebook event page. It's going to be a fun day, with a youth workshop first, then a silent auction, media demonstration, stories and more in the evening. Hope to see you there! It almost feels like winter with a typical Thursday rest day. (During the season, we usually take Thursdays off before the competition weekend). As it happens, we're just getting some recovery in the middle of an intensity block, which started Monday with intervals and then continued with a training comp and race on both Tuesday and Wednesday. Tomorrow we get back at it with two-a-day interval sessions Friday and Saturday. So I'm enjoying today and I thought I'd take the time to catch up on things here. 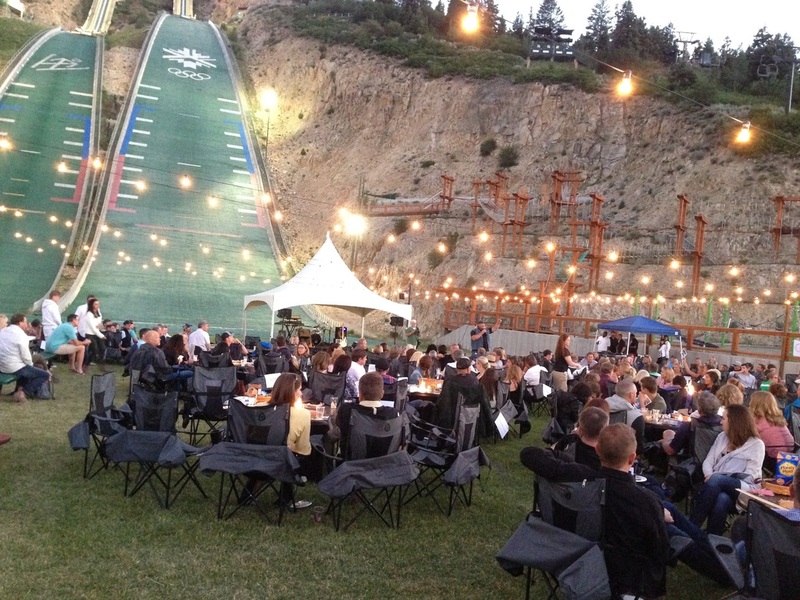 The end of July brought the annual Springer Tournee in Park City. This year, we also had our National Championships at the end of the competition week. 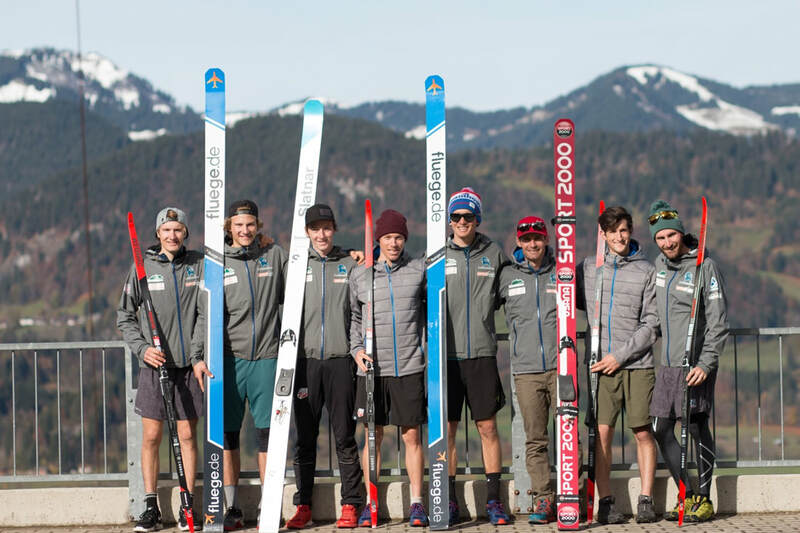 Amongst the craziness of the week, we managed to get the entire USA Nordic Team together, including the Ski Jumping and Nordic Combined Devo, National teams and staff. Our 6-man national team feels pretty small, but when you bring everyone together as one team, we suddenly have an impressive crew! 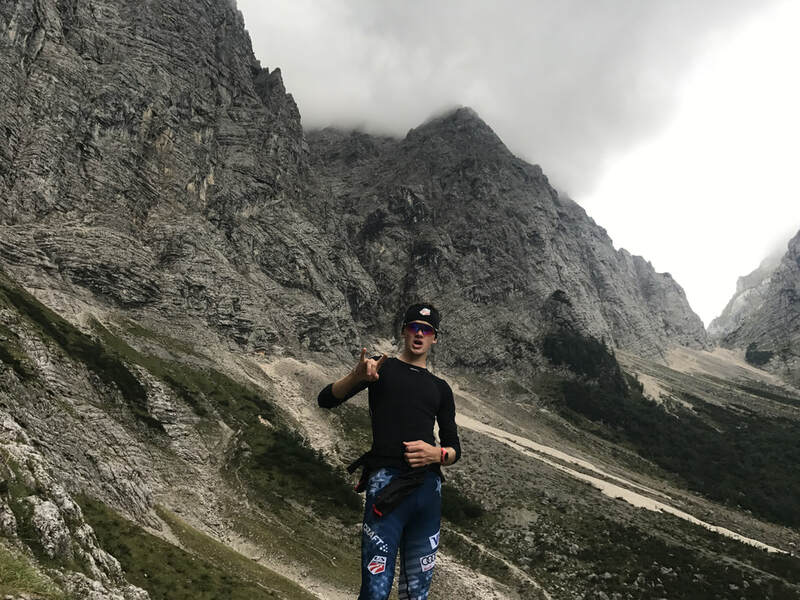 The jumping competition in Springer Tournee and Nationals was pretty deep with guys like Kevin Bickner and Will Rhoads jumping at a really high level right now. Nonetheless, we had four of us NC guys inside the top-10 of Americans on both days of jumping. 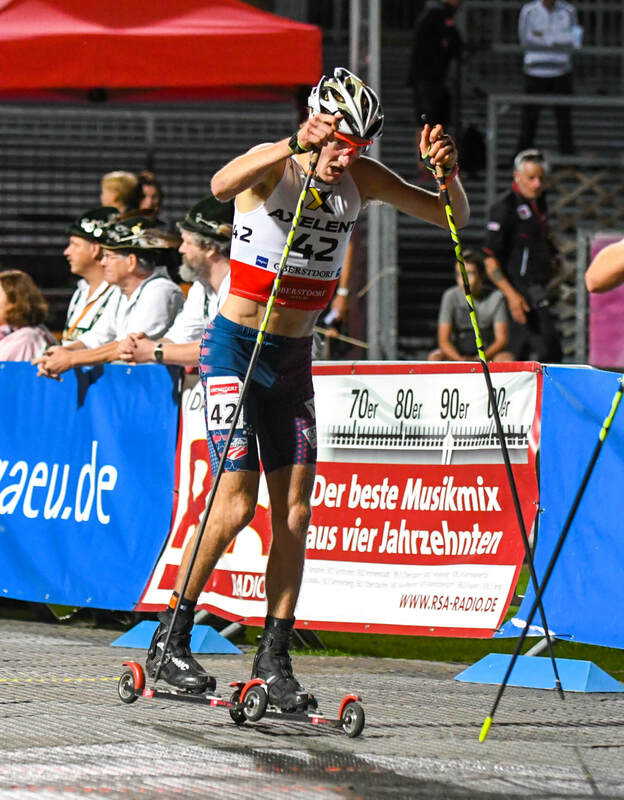 My Nationals went about as well as I could possibly have hoped, which is somewhat of a rarity given all of the variables in a nordic combined competition. I put down my best jump of the week on the one that counted. This set me up to start the race in second place, 26 seconds behind defending-champion Bryan Fletcher. 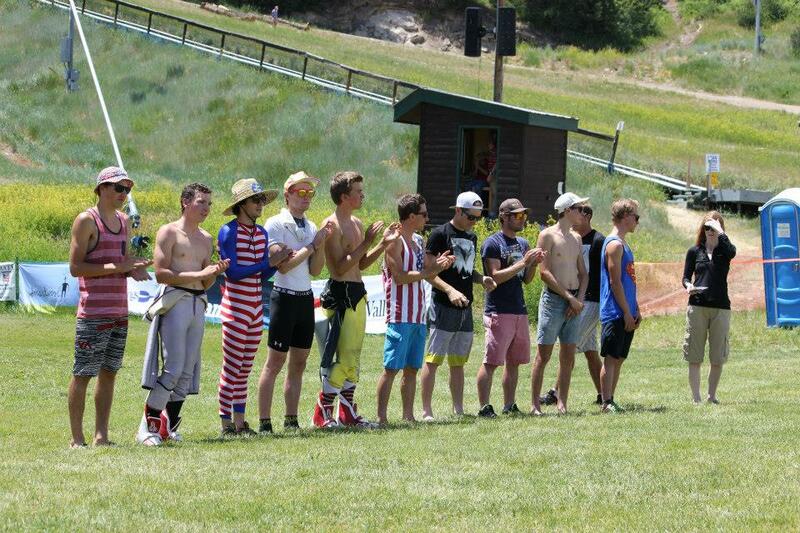 At the start of the race at Soldier Hollow, the chasers behind me were more on my radar than Bryan. Taylor - one of the fast NC skiers in world - was only 34 seconds behind me. I usually need to have a good race to just be within a minute of Taylor's time. Michael was the wildcard, starting a few more seconds behind Taylor, with the possibility of being able to hitch a ride up to me. As the race unfolded the 90 degree heat soon took a toll on everyone. My even pacing began to pay dividends. Taylor went for broke in the beginning of the race - a bold but commendable strategy. After all, might as well go for the win or die trying. Taylor "hit the wall" before he made it up to me. In this sense, I was a bit lucky; it's a rare thing for Taylor to truly blow up. In the last couple kilometers, I pulled close enough to Bryan to make him nervous, but he still had few seconds to spare coming into the final stretch to celebrate his victory. I came in 5 seconds behind him, exhausted, hot and somewhat surprised to have just came in second place at National Championships. On one hand, two podiums in two years at National Championships is a pretty cool career achievement - but I've still got one spot to go! And in reality, our success is measured on the international scale, and this day was just good competition experience to take with me into the future. We'll be at Summer Grand Prix in just a few weeks to get a true test of our level against the rest of the world's. Bryan Fletcher setting up his second National Championship title. Paul Loomis photo. On the podium with the Fletcher brothers. I hope to share a podium with these guys overseas sometime soon! My dad made it out for the week and took some great jumping and XC shots, including the one of Bryan above. 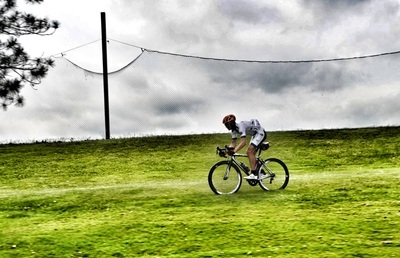 Here's me on one of the short transition hills at Soldier Hollow. The most astute viewers might notice the white boots. I'm switching to Atomic next season for cross country skis and boots, and just broke out the new boots a couple of weeks ago. Bill, Todd and Johnny used to all ski on Atomic, but now Taylor was the only one of our team left skiing for them, and it only took me a bit of testing this spring to decide that skiing for Atomic would be great. Speaking of equipment and new sponsors, I'm also proud to be on One Way poles this year. Not only do they make the lightest, stiffest and coolest (read: neon) poles on the market, but the One Way rep lives right in Park City. When in comes to equipment, right after quality comes service and relationships, and you can't beat working with someone who is practically your neighbor. 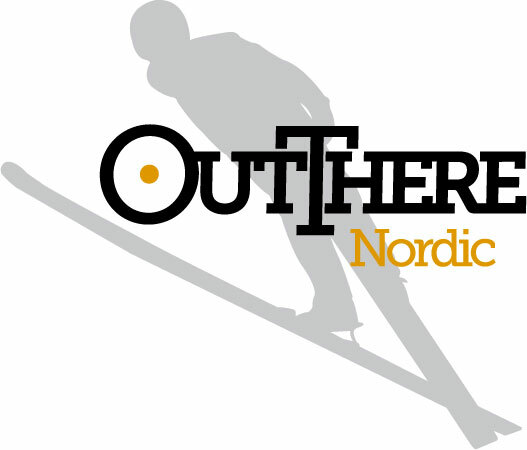 Also, I'm partnering with Out There Nordic, a Rice Lake, Wisconsin based ski shop who has connected a team of nordic and biathlon athletes from all around the world. I'm excited to be a part of this unique team, and am hoping to work with Out There to put together a fundraiser later this fall, in order to raise money towards my team buy-in costs. If anyone has any ideas of suggestions about fundraising, let me know. I've been working hard serving Schnitzel and Merlot at Adolph's, but I need to taper back my work hours as we put in more high intensity training and start traveling. That said, it's not all work and no play. I'm about to go out and hit a golf ball for the first time in about forever, so wish me luck. I'll need it. Well it happened again - I've procrastinated for far too long before posting an update. I won't bog you down with too lengthy of a recap but I've had a busy and productive few months. Hopefully you've been following me on Instagram or Twitter for more frequent updates. With the exception of a couple backcountry skiing hut trips and recent trip to NY, I've been in Park City for most of the spring. After a long winter on the road, being in the same place for a while isn't all bad. Now we're finally less than a week away from starting summer jumping. We usually start jumping around the end of May/ beginning of June; this year we decided to dedicate more time to preparing off the hill, with flexibility, speed, agility and imitation work in the gym. Additionally, we'll finish our volume training block this week, and then back off the cross country hours right in time to start jumping. 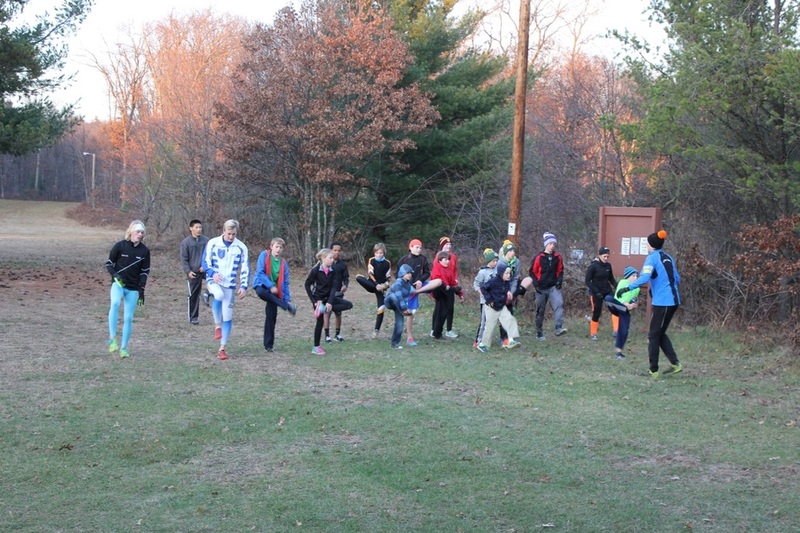 This week is our biggest week of the year in terms of XC distance training. Although it can be challenging, that also means more time out adventuring and being outdoors: running, roller skiing, road riding and mountain biking. 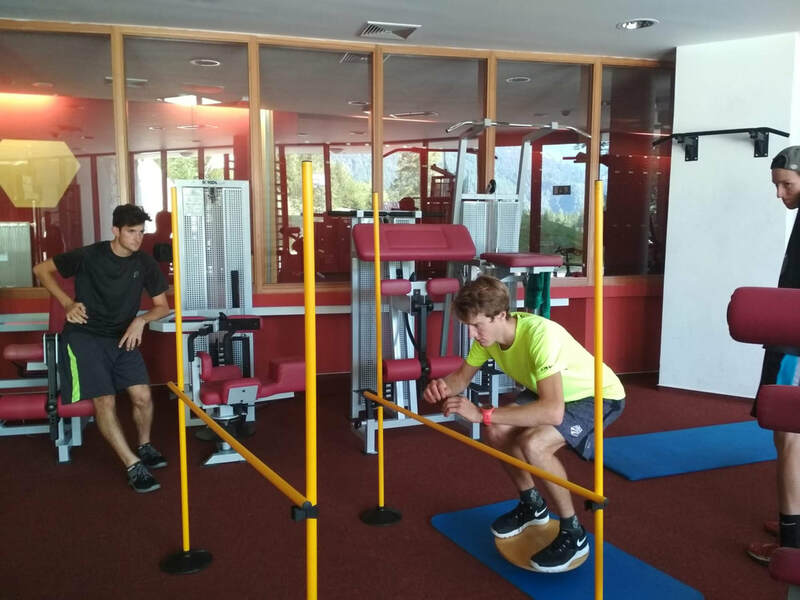 Getting quick, training with the ski jumping team in Athletic Republic. Exploring the mountains out my backdoor. "Road riding" is always more fun when you mix in a little dirt. Heading up towards Sundance Resort around Mt. Timpanogos. Bryan back at his proposal site. That's selfy-worthy. We found a ski jump! 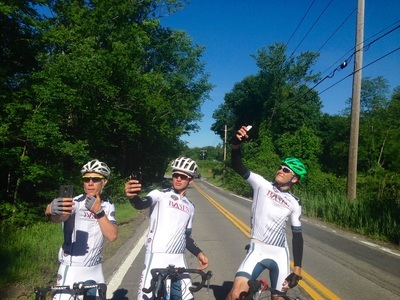 @ Salisbury, CT.
Our whole team, including freshly-retired-Billy and my brother, flew out to New York last week for a bike trip with one of our sponsors, Basin Holdings. I mentioned first meeting some of the Basin team in my last post, way back in March, when they came out here for a corporate retreat. 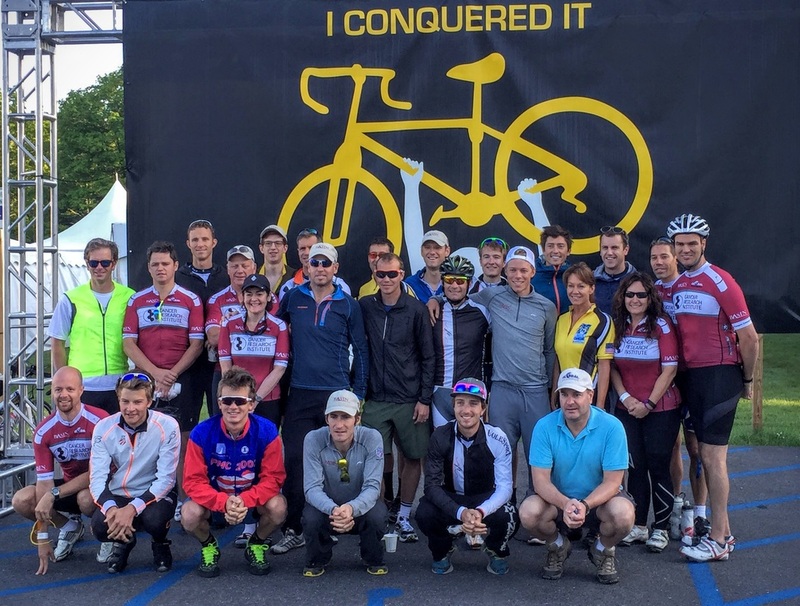 This time, we joined them for a day riding for the Cancer Research Institute (CRI), in the inaugural Ride to Conquer Cancer. 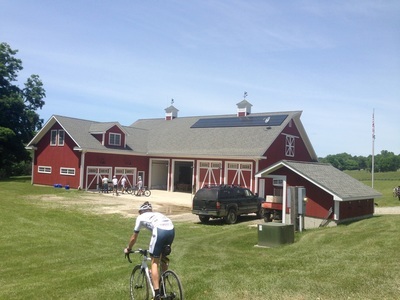 It was cool to participate in the CRI ride, where many of the participants where way out of their element riding 64 challenging miles, and to be part of an event that raised almost $2 million. The ride started in Younkers, near the Bronx, and after navigating busy city streets, we made our way into the countryside, past stunning estates in Greenwhich, CT and back into beautiful rolling hills in New York. 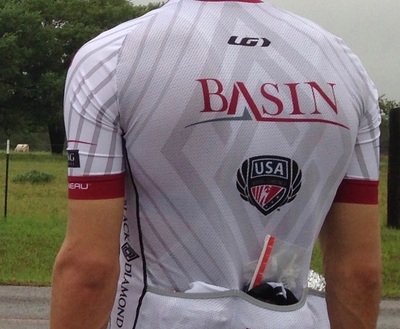 After Day 1, the Basin/ USA NC team continued into the Hudson Valley. We spent a night on a farm owned by Basin's founder, John Fitzgibbons, then road back across Connecticut towards the coast of Rhode Island. 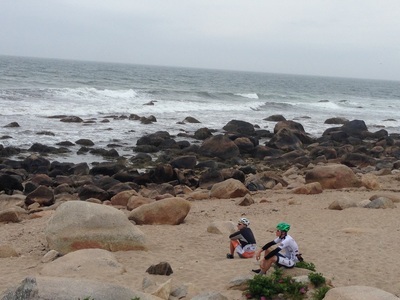 In RI, we were treated with coastal views, lighthouses, swimming in the Atlantic and a lunch at the New York Yacht Club. It was a fast and furious five days. Although the riding wasn't quite the same as our previous bike trips in the Alps of France, it was one of the coolest trips I've been on. 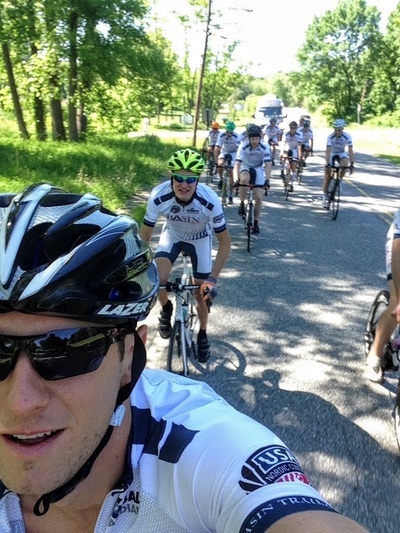 We had an awesome crew, ranging from really strong triathletes to some relative newbies to long road rides. 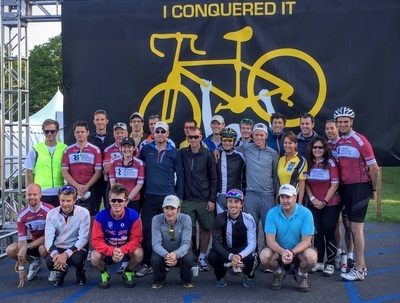 With the help of a strong support team everyone was able to ride farther and faster than they might have thought. In contrast to a typical training camp, where extracurricular activities usually still revolve around skiing (as in watching EuroSport TV while foam rolling and taking turns waxing skis), we stayed busy with out-of-the-ordinary activities off the bike. At the farm, we got our testosterone pumping with a (controlled and safe) target shooting practice, lead by two Delta Force veterans, and an evening farm tour on ATV's and dirt-bikes. We ate from the siblings of grazing cattle and pigs around the farm, which surprised me, as I mistakenly didn't expect the "farm" to actually be just that, a working farm. 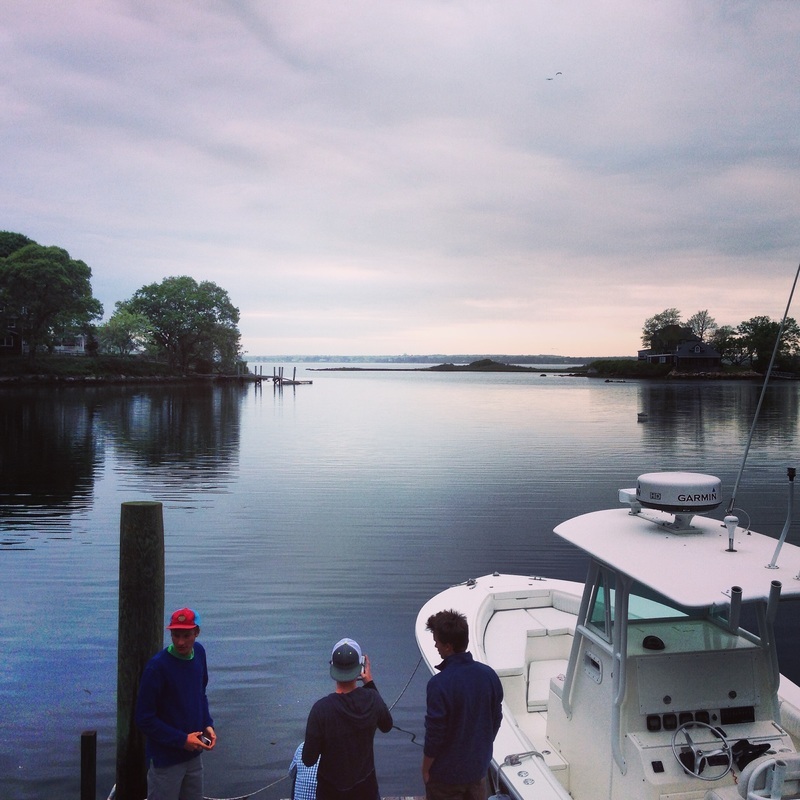 Early on our last morning in Rhode Island, we searched for striper bass off the nearby reef. Although we failed to find any fish, the bumpy wave riding and the views from the boat made the excursion worthwhile. We were more successful body surfing the waves that afternoon - happy to get a little time in the ocean while we could. (In this case, by we I mean just the young guys, Ben B, Jasper, Ben L and myself - no one else seemed too anxious to get in the water). John and the Basin team took great care of us and kept the days' schedules packed. By the end of the trip, we were all in need of a little more sleep and recovery time. I continue to amaze at the productivity of these guys, and their ability to somehow stay impressively fit around the demands of full-time jobs and families. For some great shots from the trip, see the gallery below, credit to Mike Waterman and Spencer Livingston. The last six are my shots. Click for large photos and captions. 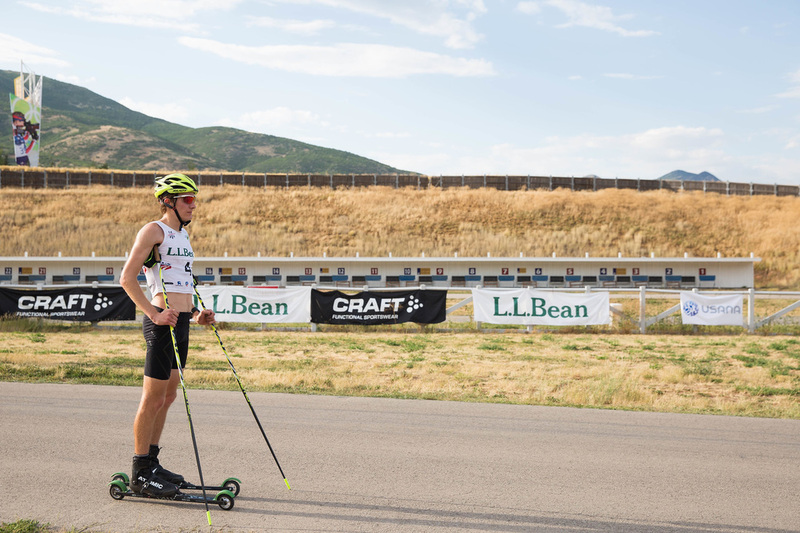 After the trip, we had a few days to rest our saddle areas and spend more time running and roller skiing before the annual Sundance Sufferfest. The race, for those who don't know, is organized by the sports science department at USSA and open to anyone within the organization... and yes, we're still included whether or not we're officially on the team. This year was bigger than ever, with almost 60 starters going out on course over the span of 40 minutes based on a handicapping system. 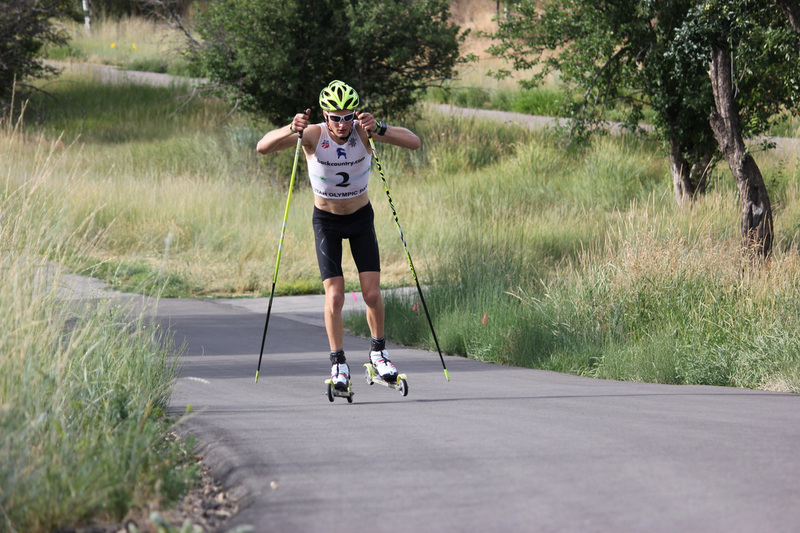 It's all uphill, which tends to favor skinny-but-fit people like Nordic skiers, rather than anaerobic alpine and freestyle athletes. My team and I all started towards the back, as usual. And, as usual, most of our team made it pretty close to the front, with Taylor being the fastest, but the winner came from the middle of the field. Although I don't take too much stock in my racing shape this time of year, I was happy to put down a considerably faster effort than last year, and surprised to see that I passed about 45 people on the way up. As much as my teammates and I want to win, we know that they don't really want the fastest winning, otherwise there's no point in the handicapping. A big thanks to Sundance Resort is in order. Not only do they let us crowd their road, but they reward our efforts with a killer brunch at a steep discount. The legendary post-race meal might actually have more to do with the event's growth than anything else. 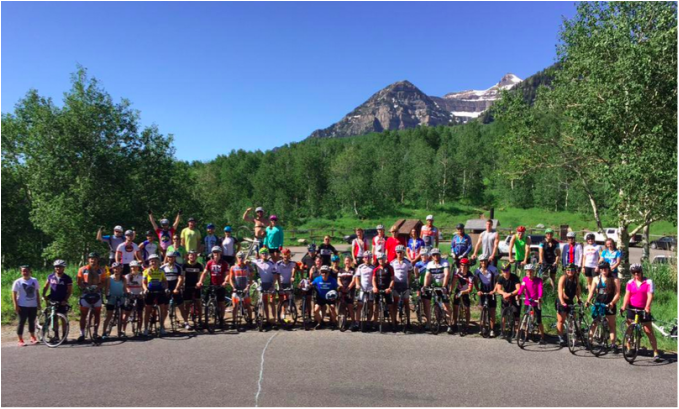 The whole Sufferfest crew, at the top of Sundance. 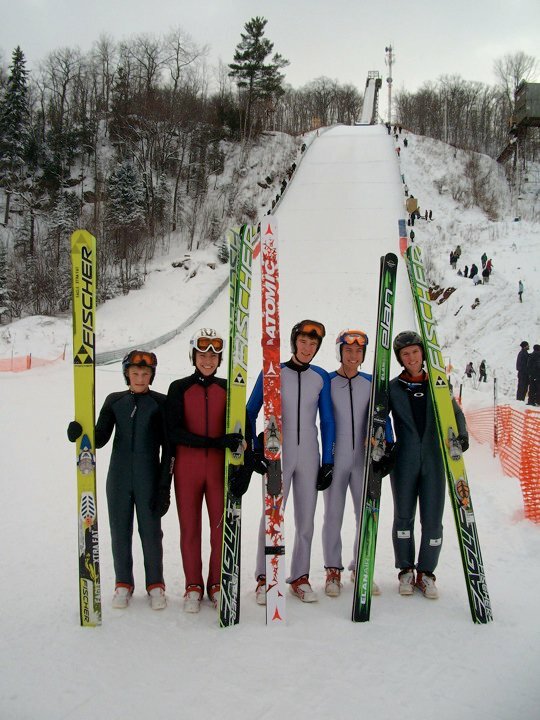 US Ski Team photo. Ben Berend and Michael working together to make it to the top as fast as possible. 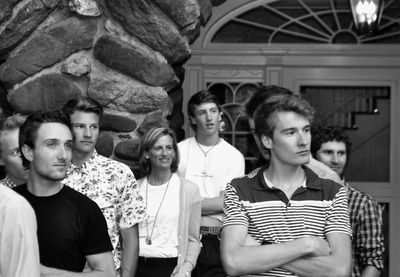 Sundance Resort photo. That's all for now. Gotta rest up for intervals tomorrow. Thanks for reading and stay tuned for another post in the next couple weeks!